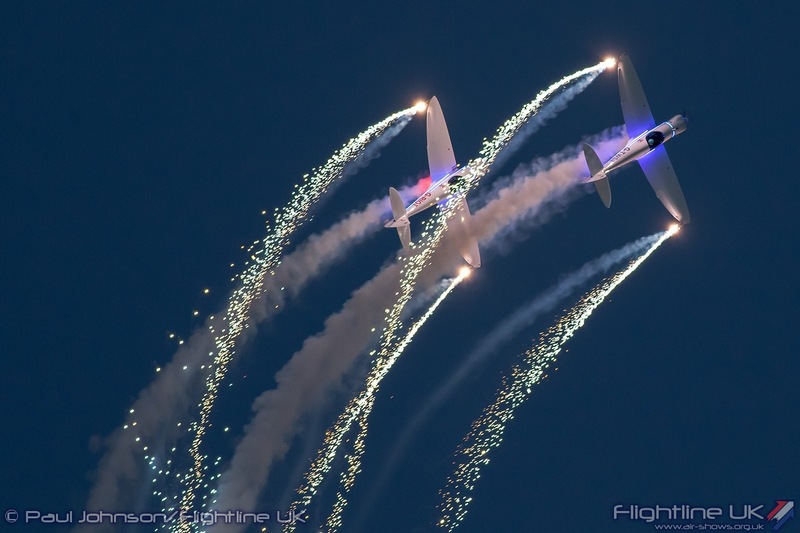 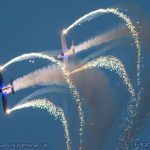 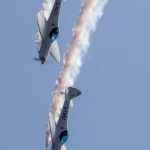 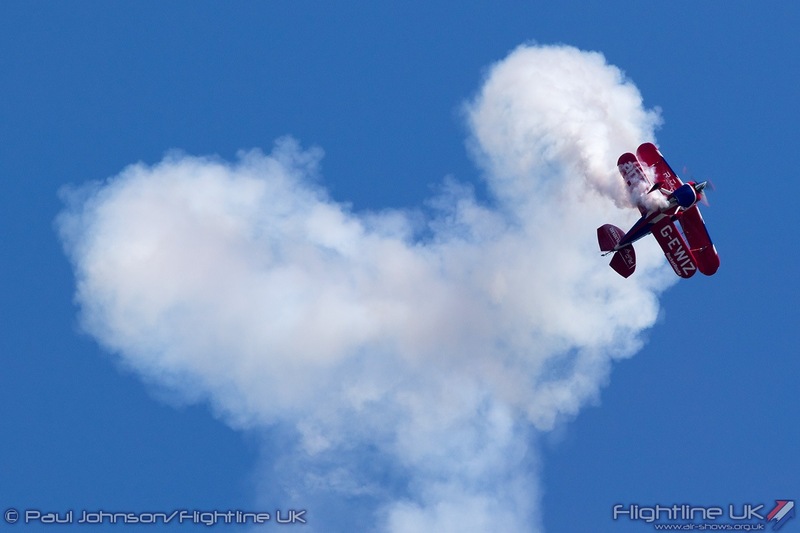 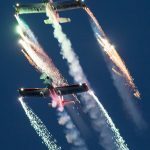 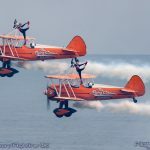 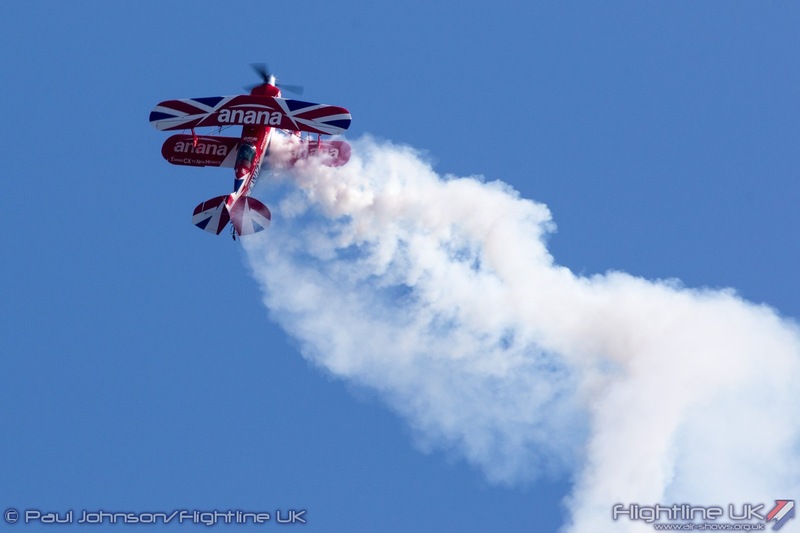 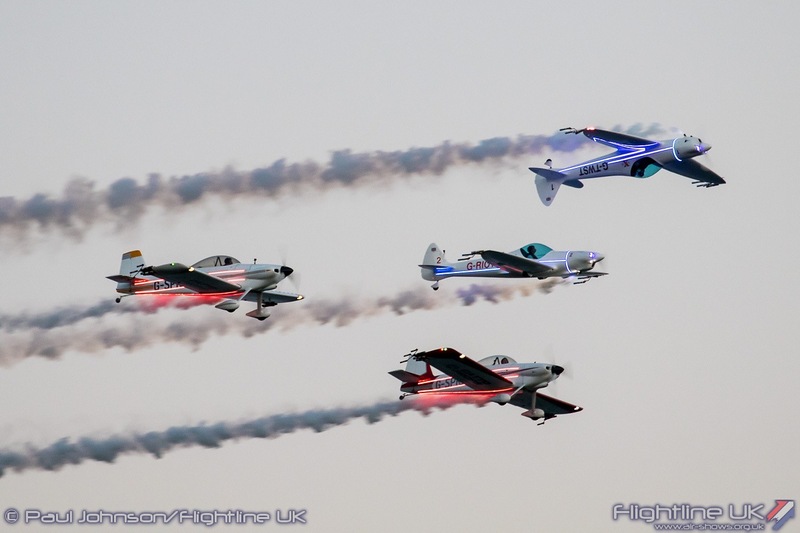 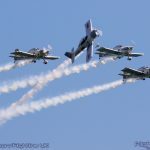 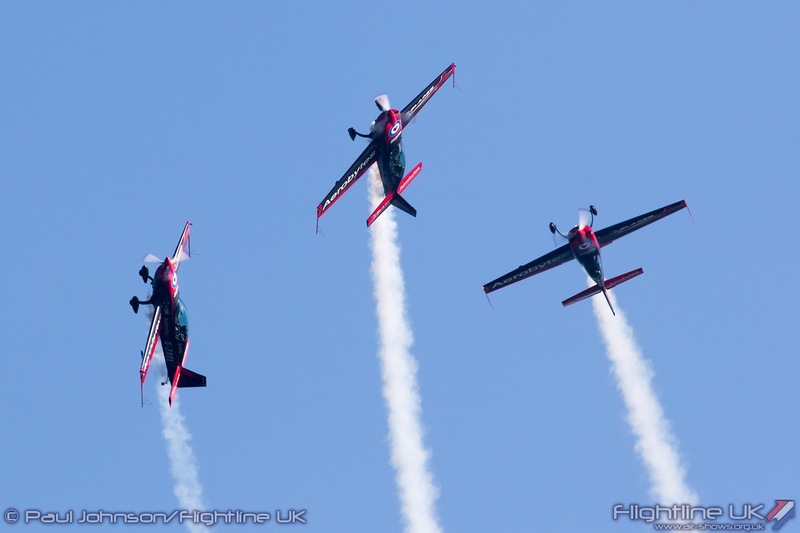 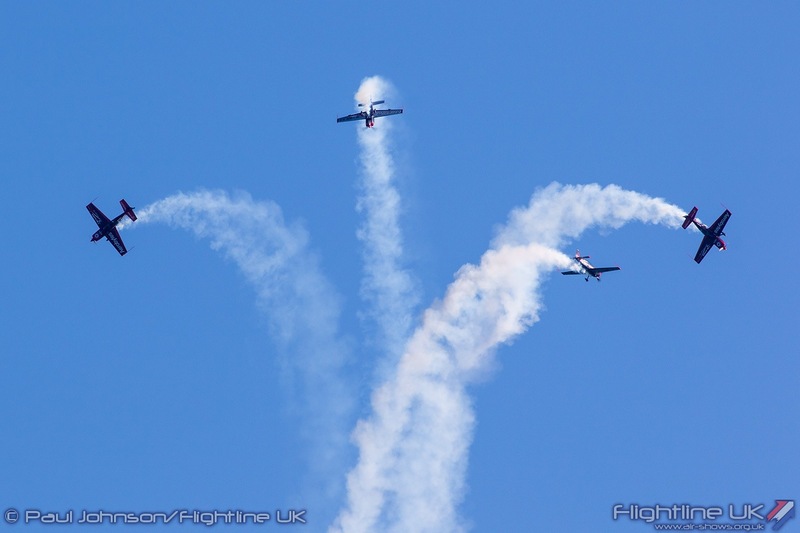 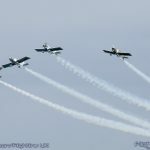 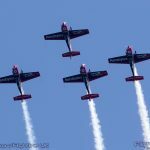 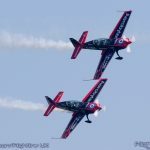 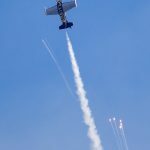 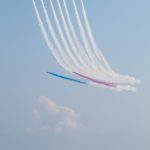 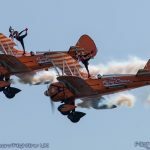 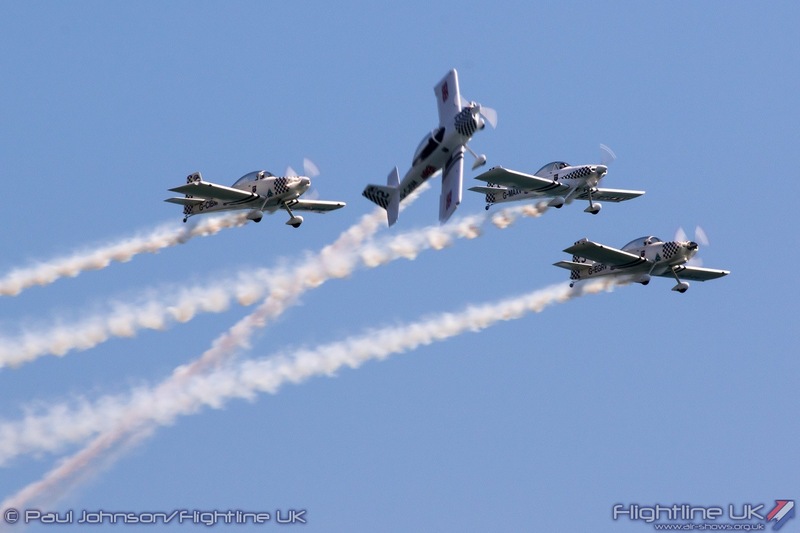 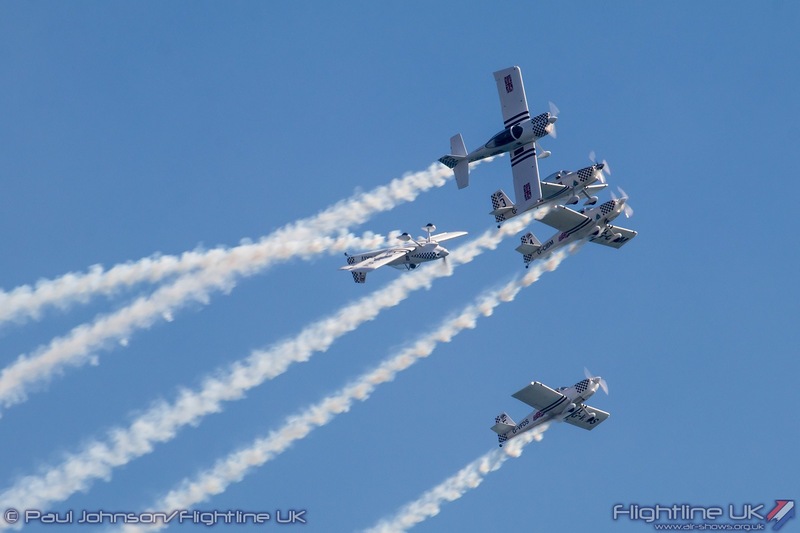 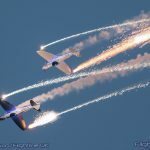 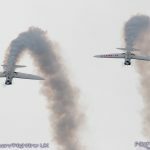 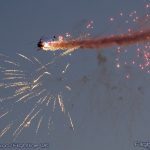 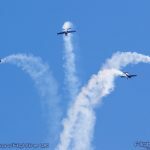 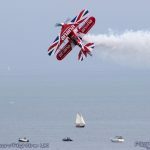 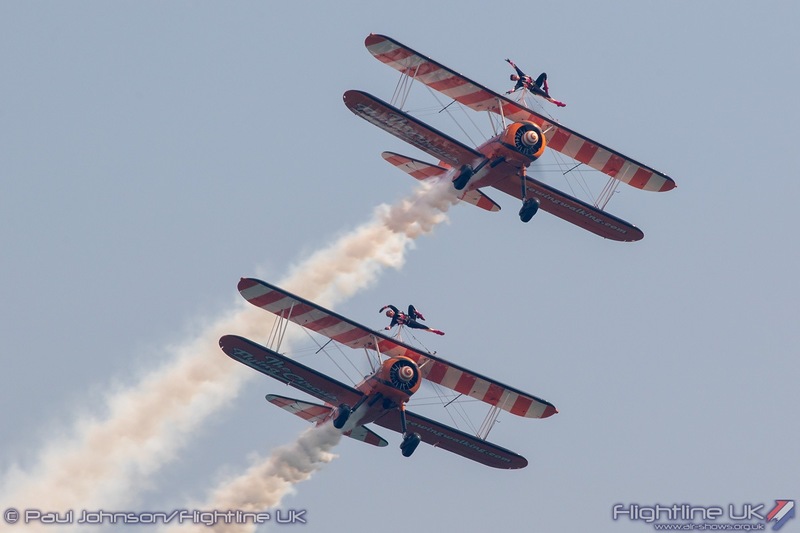 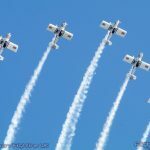 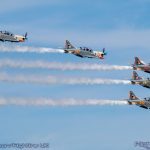 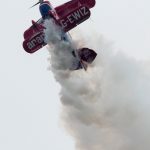 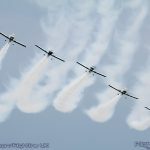 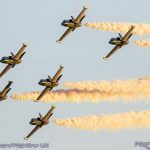 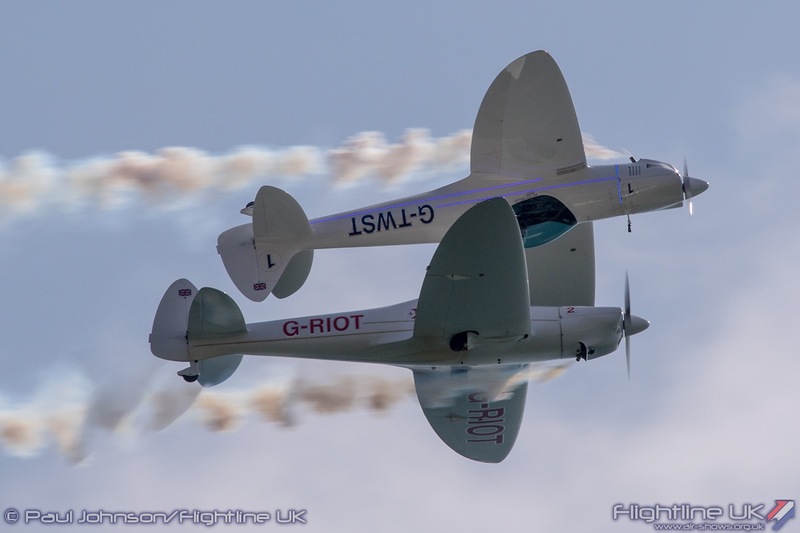 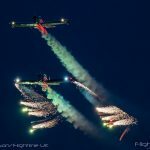 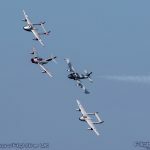 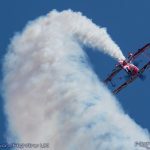 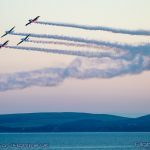 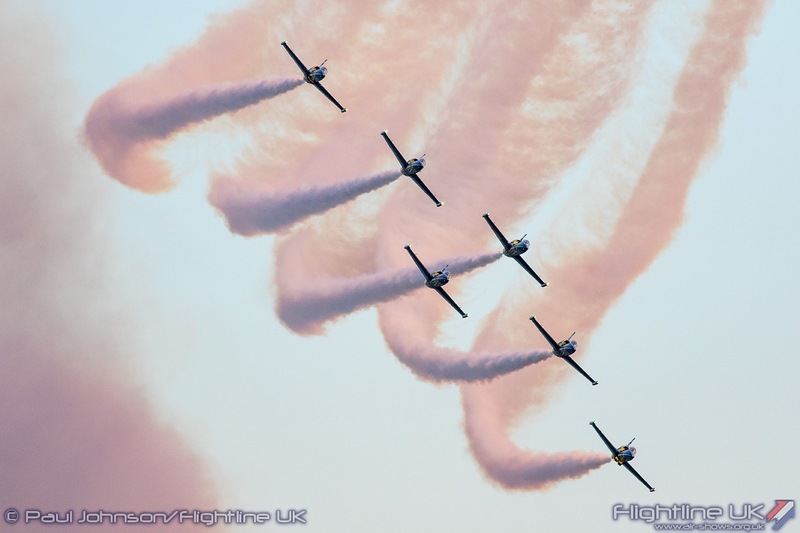 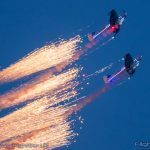 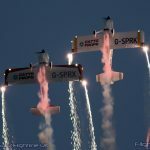 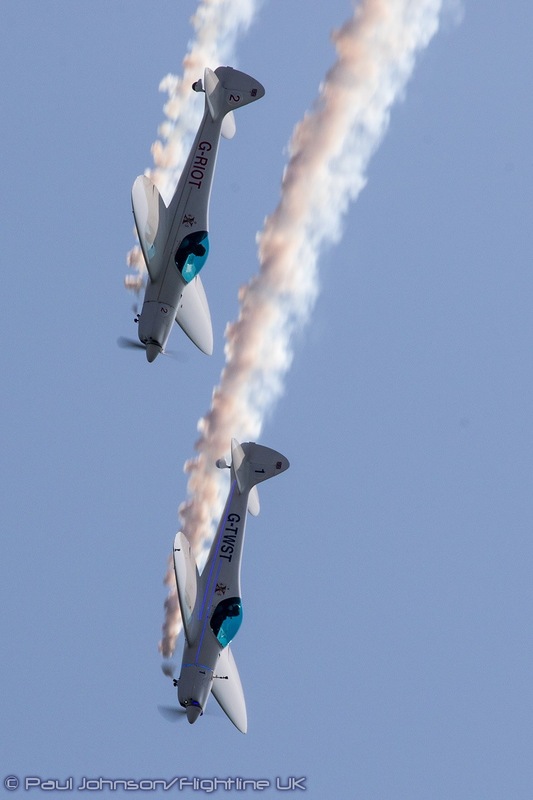 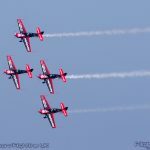 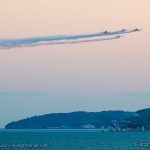 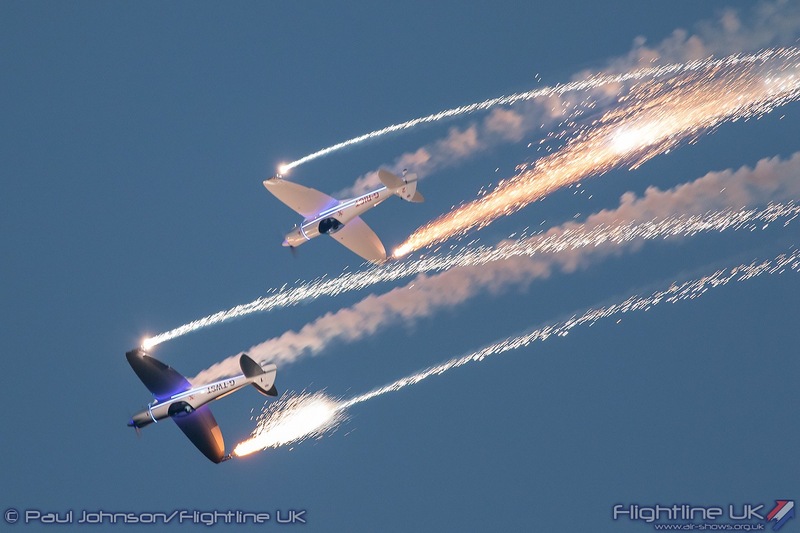 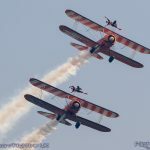 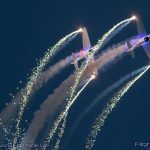 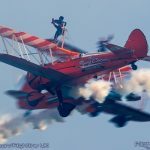 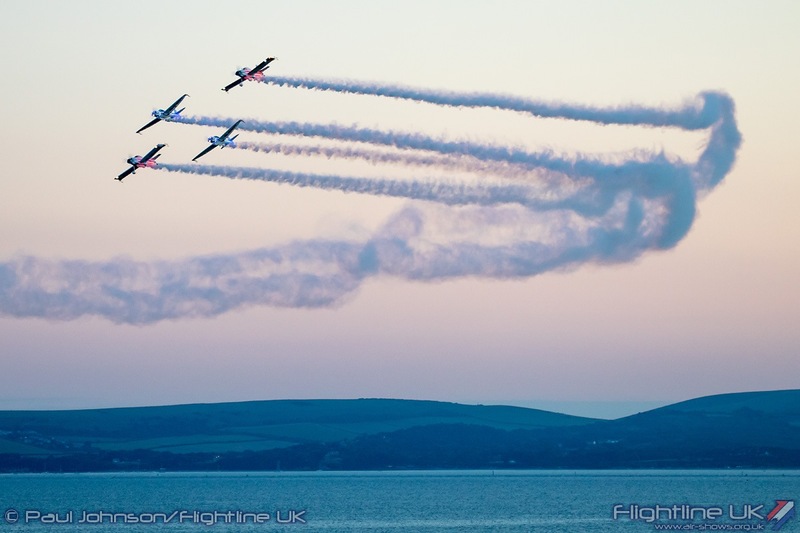 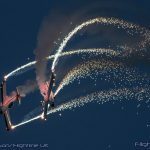 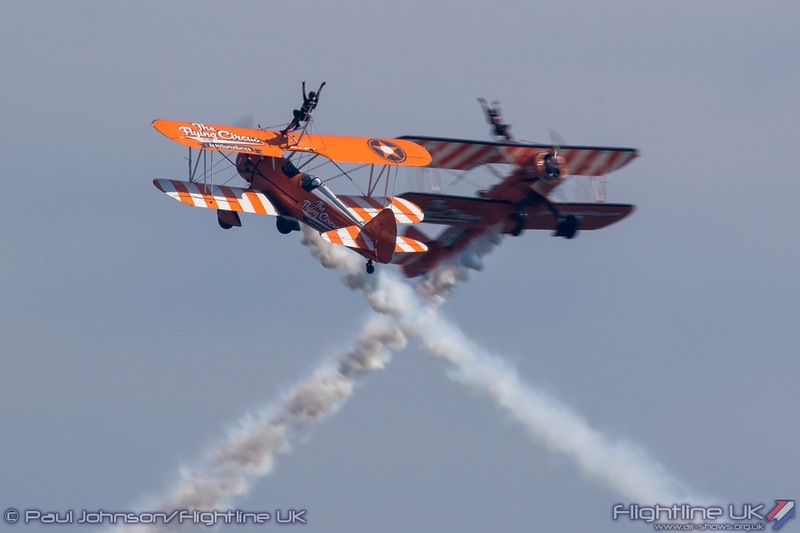 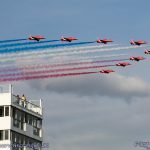 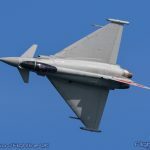 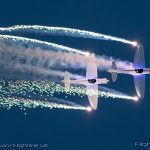 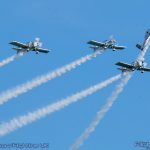 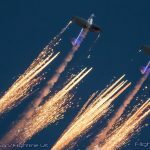 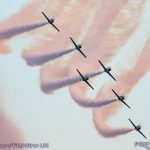 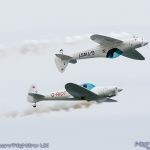 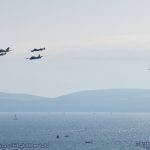 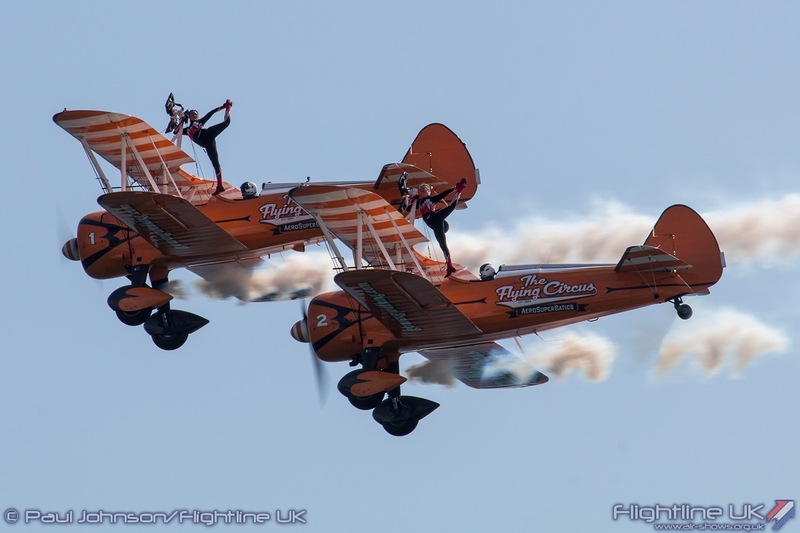 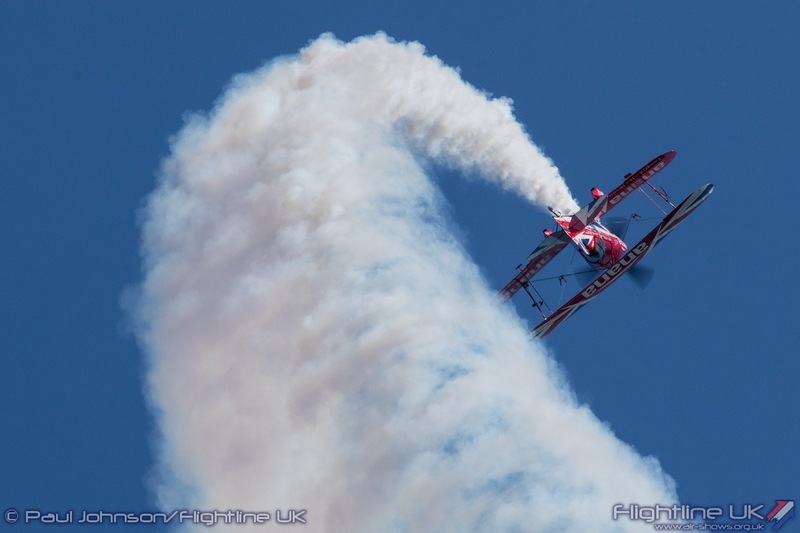 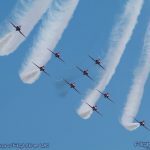 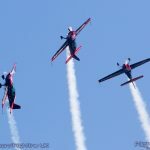 The 11th Bournemouth Air Festival brought the season of South Coast seaside airshows to a close over the first weekend in September. 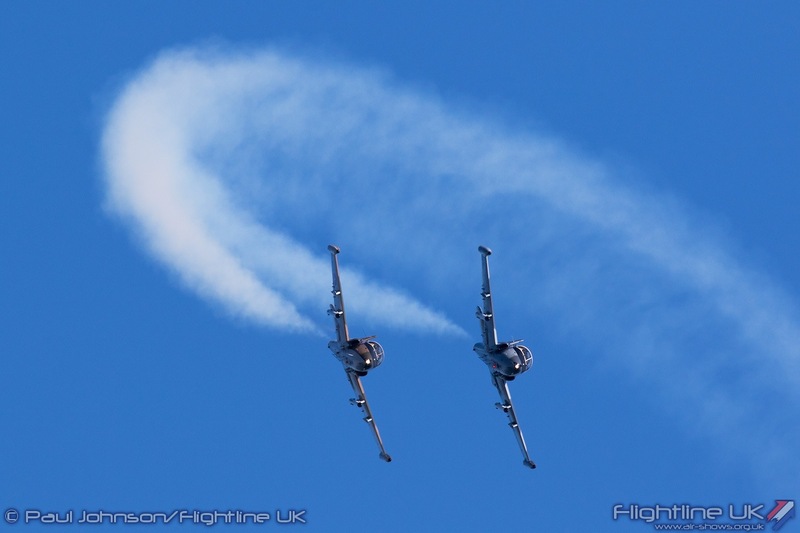 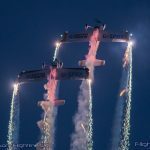 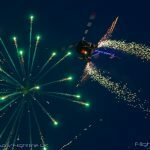 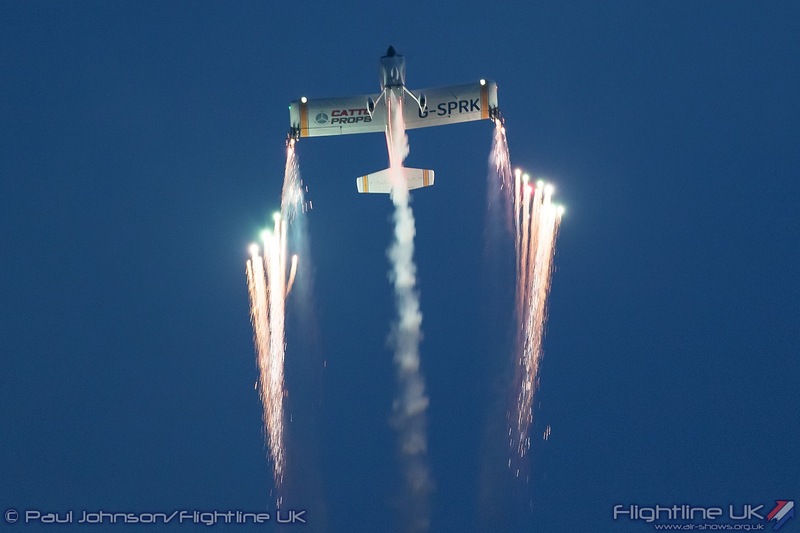 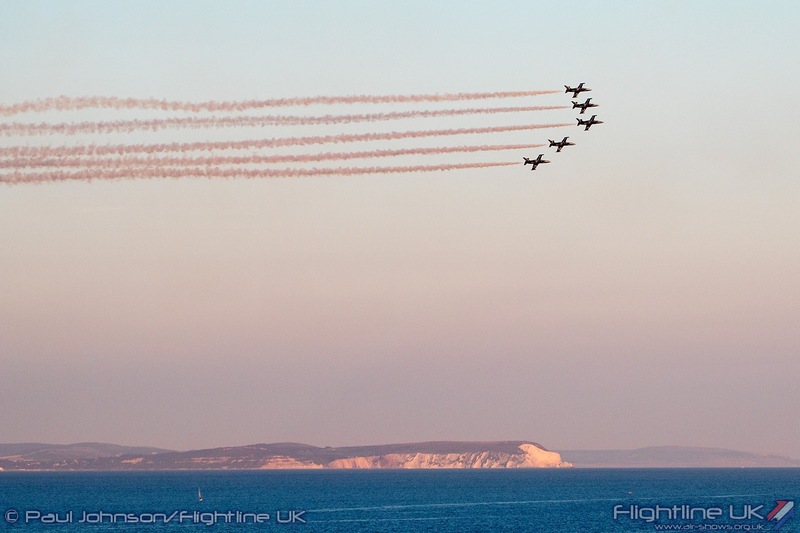 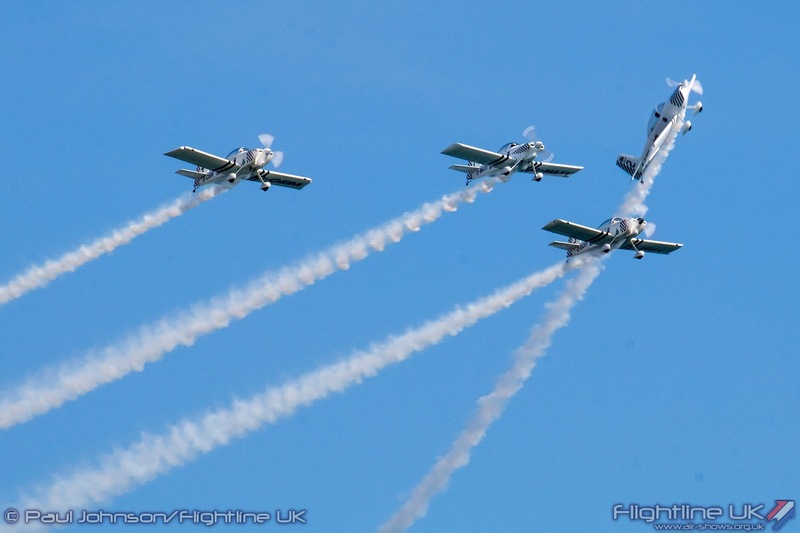 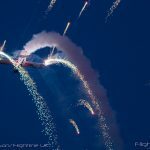 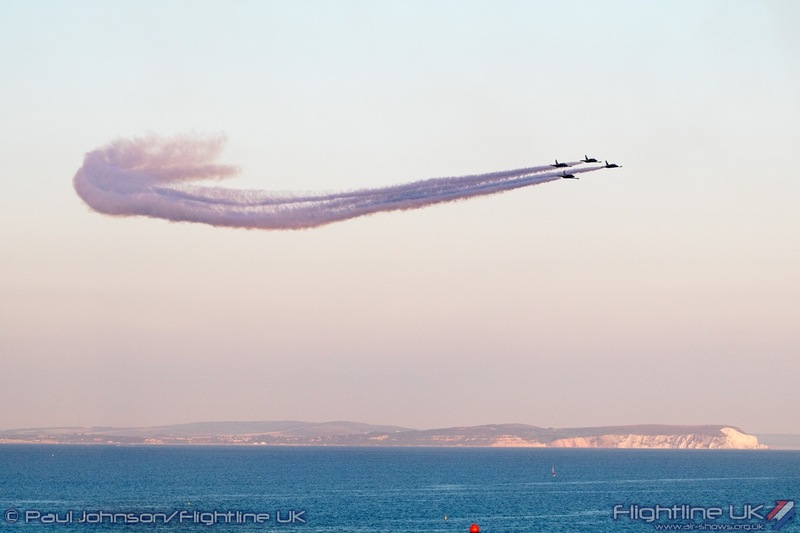 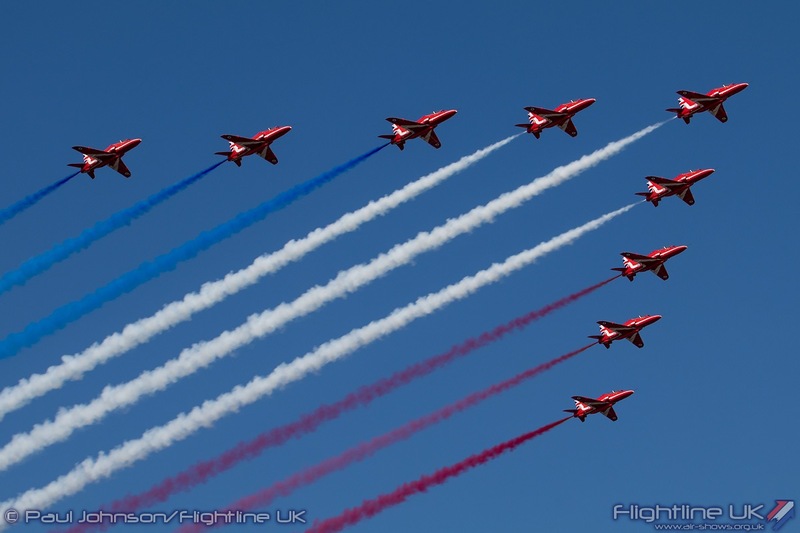 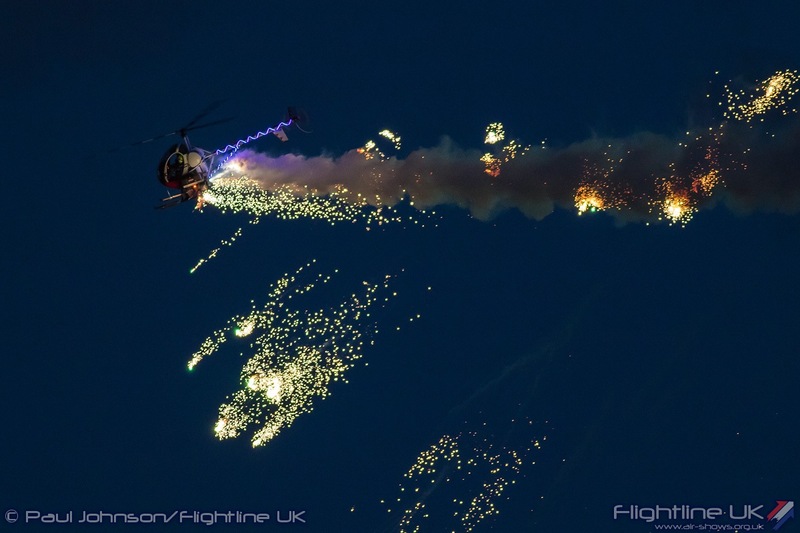 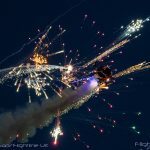 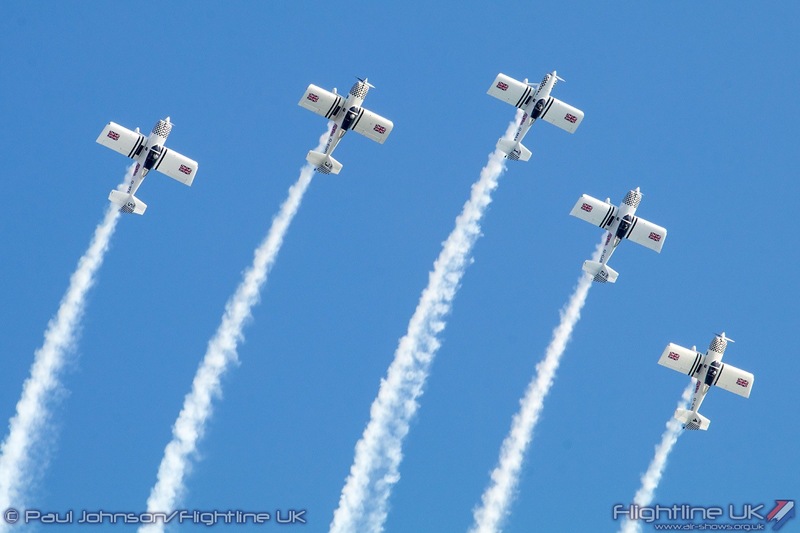 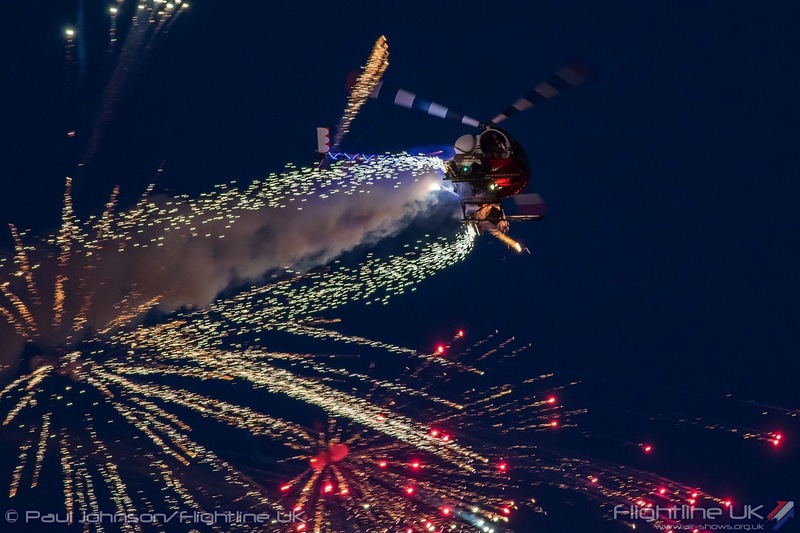 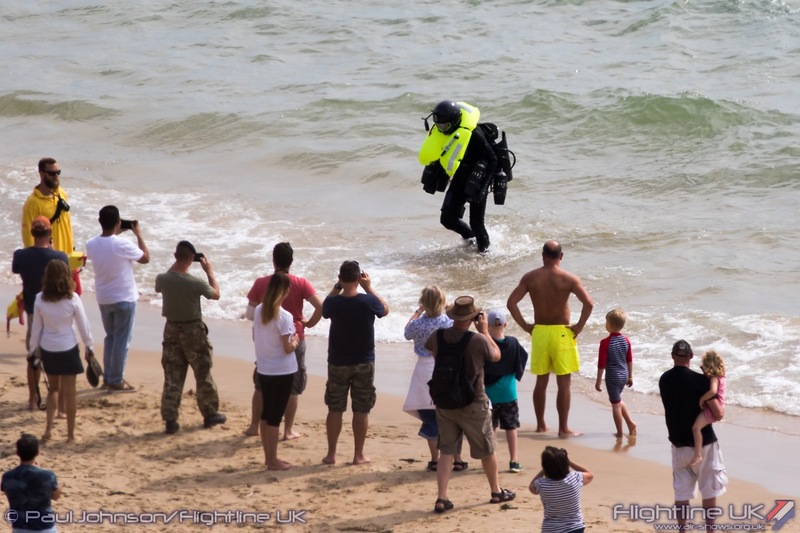 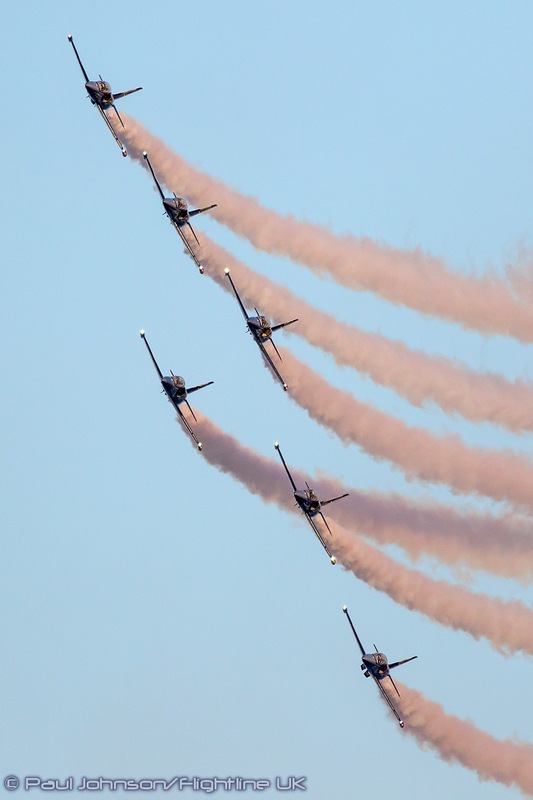 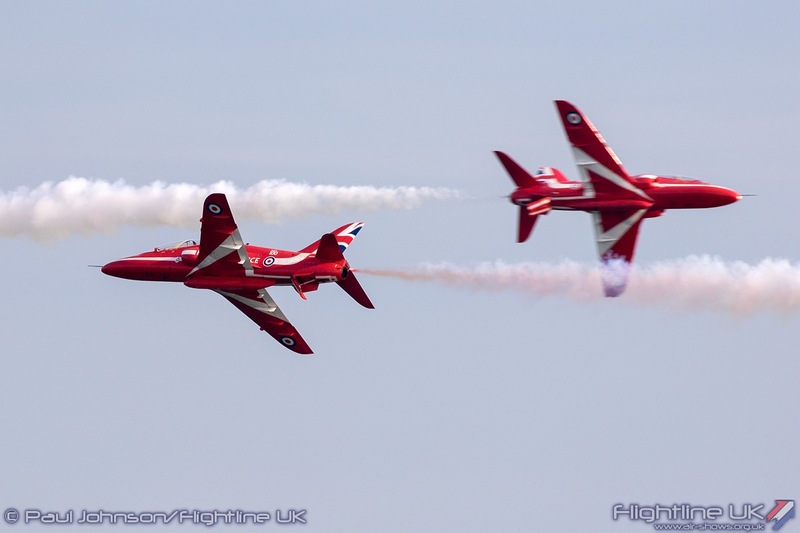 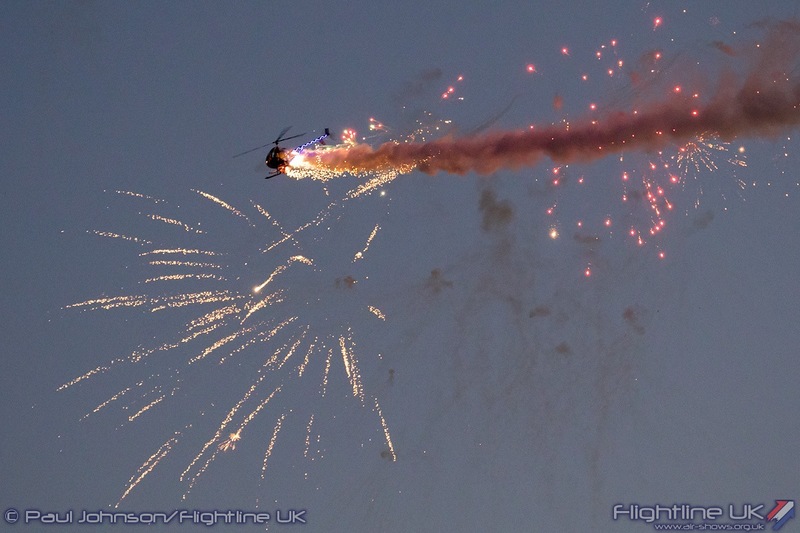 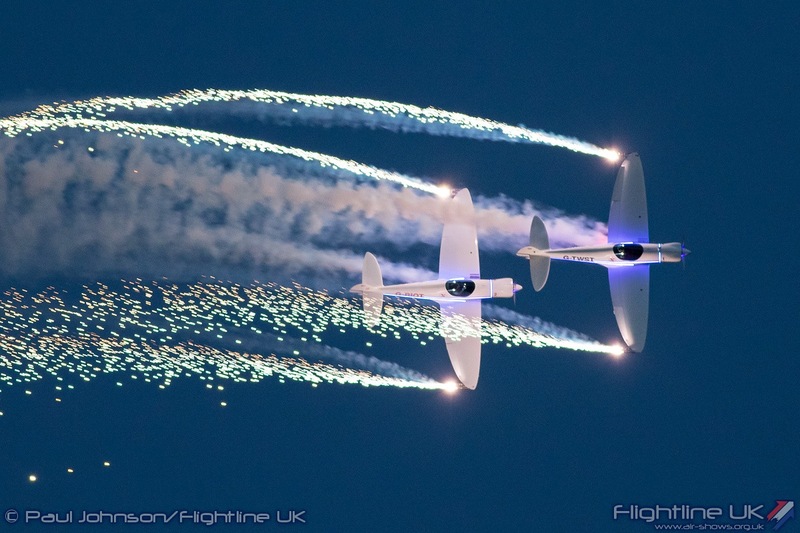 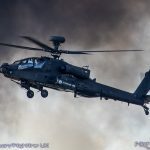 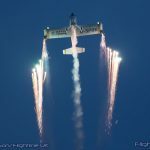 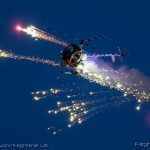 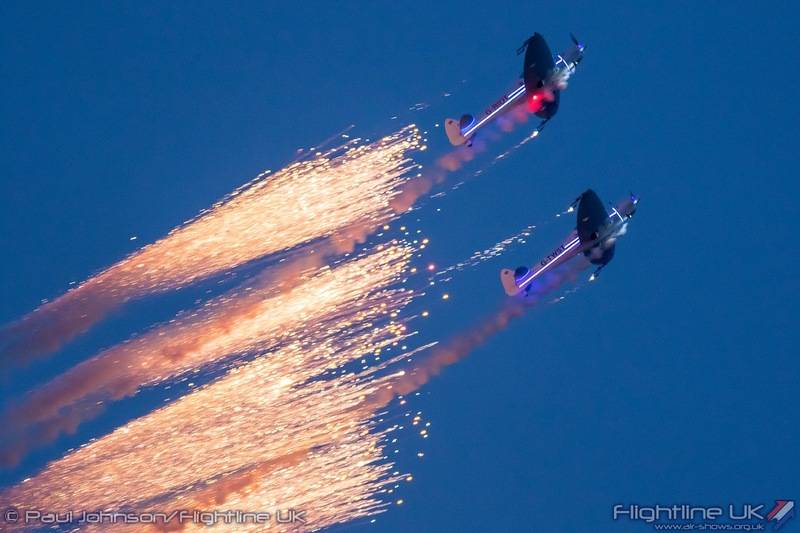 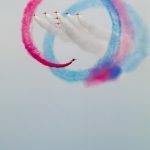 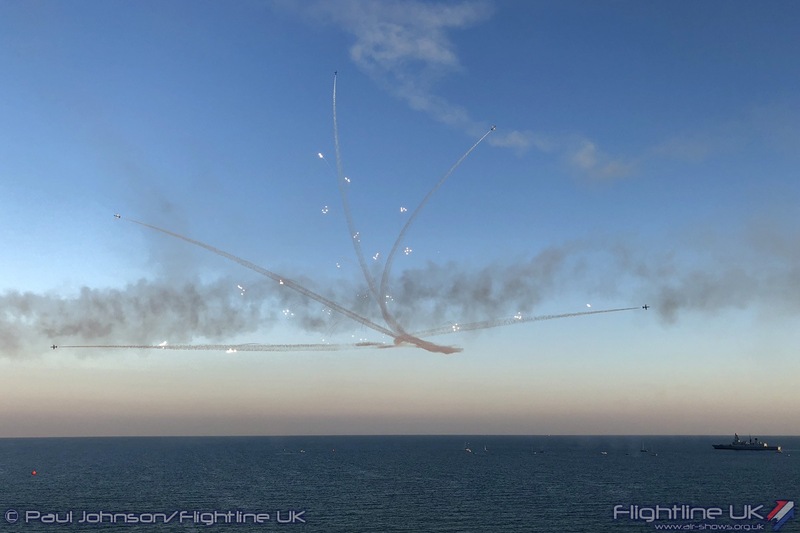 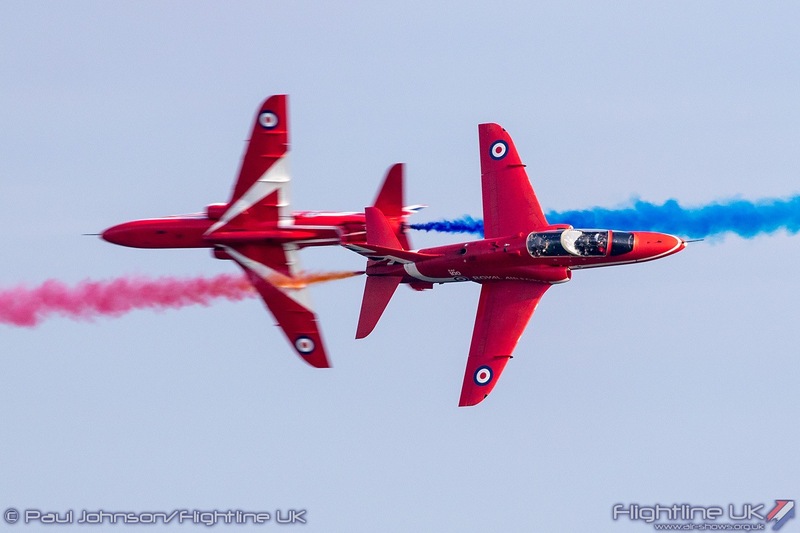 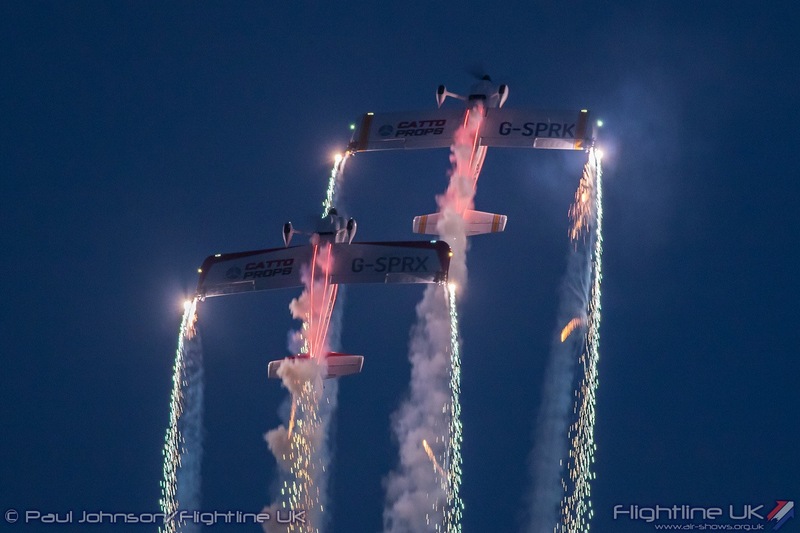 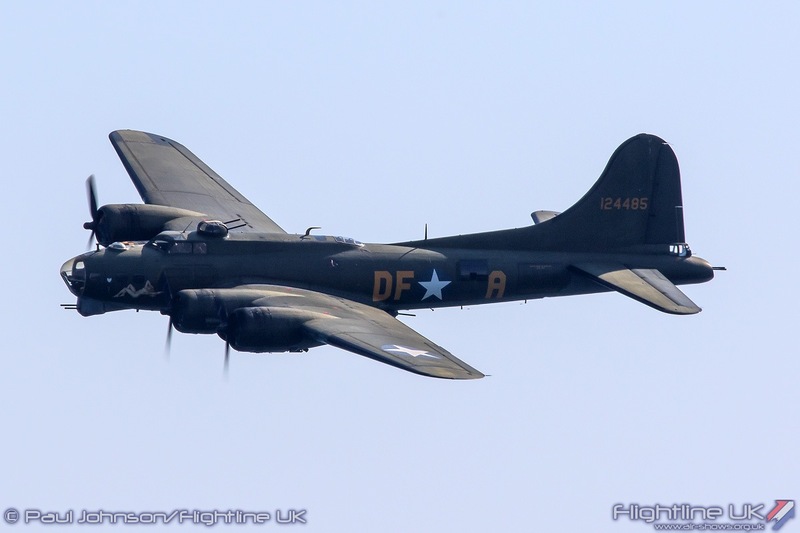 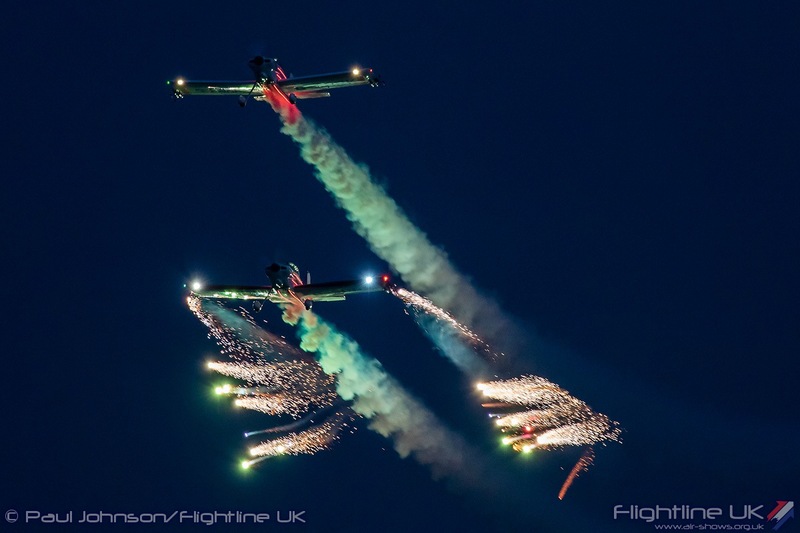 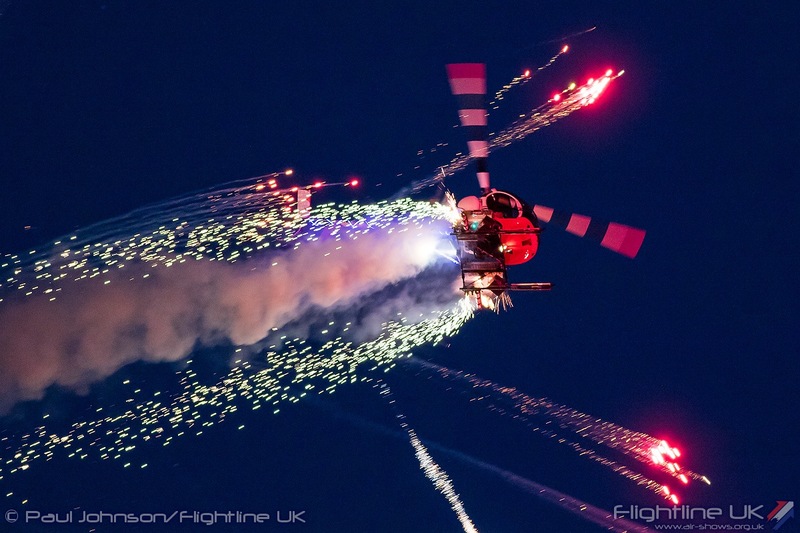 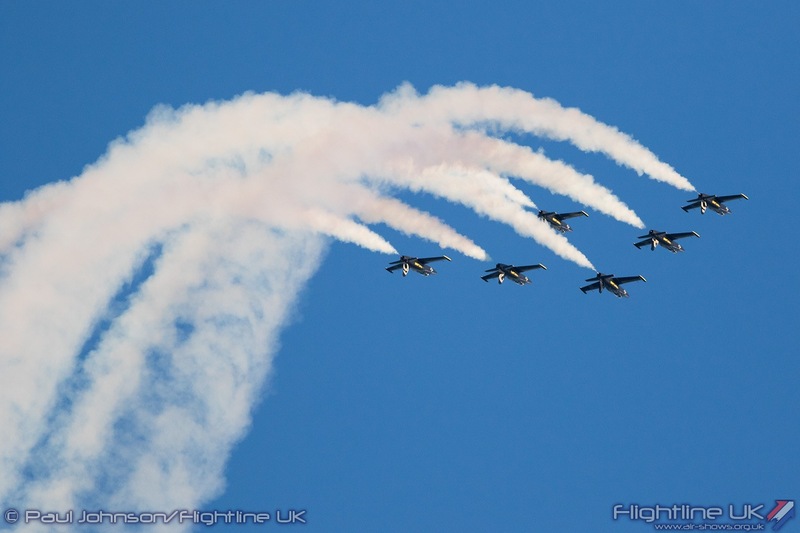 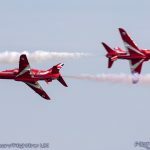 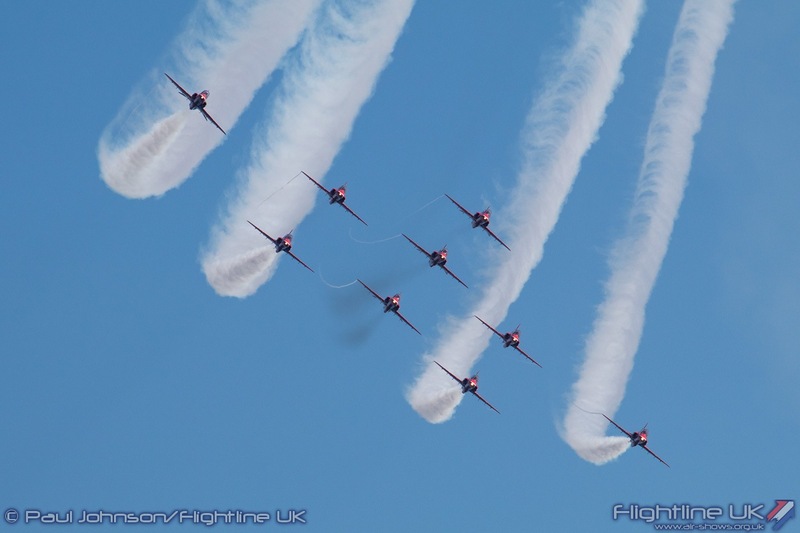 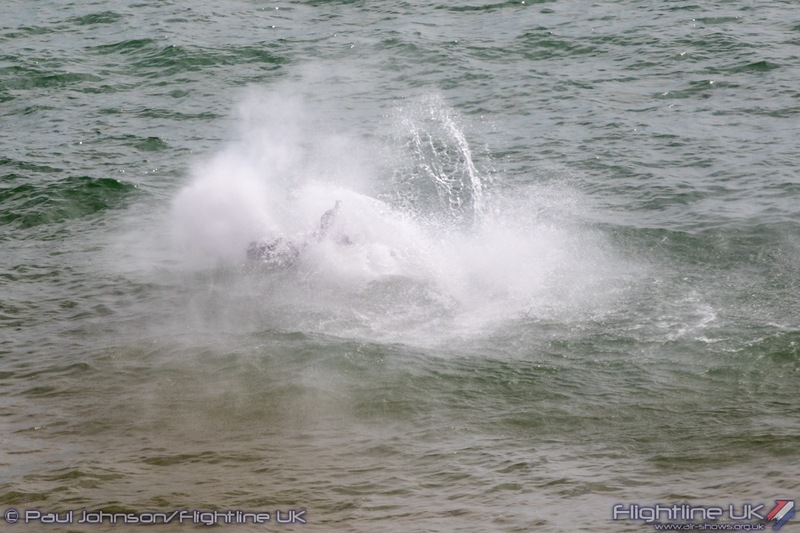 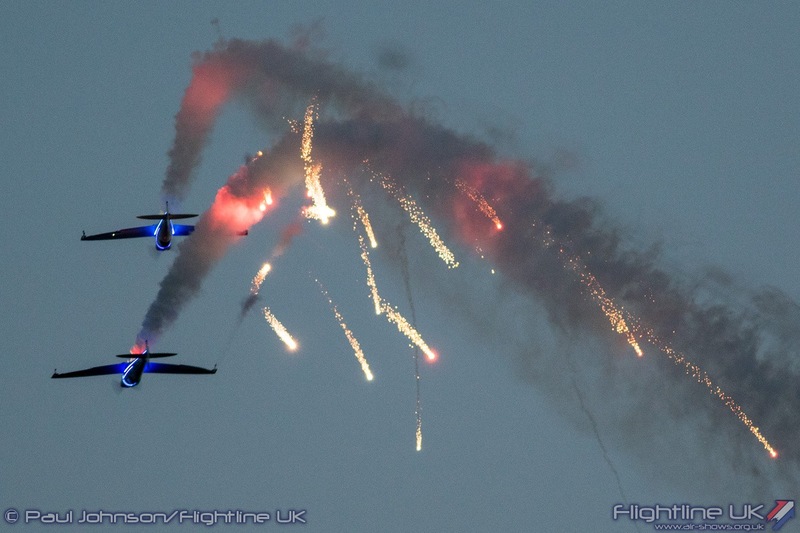 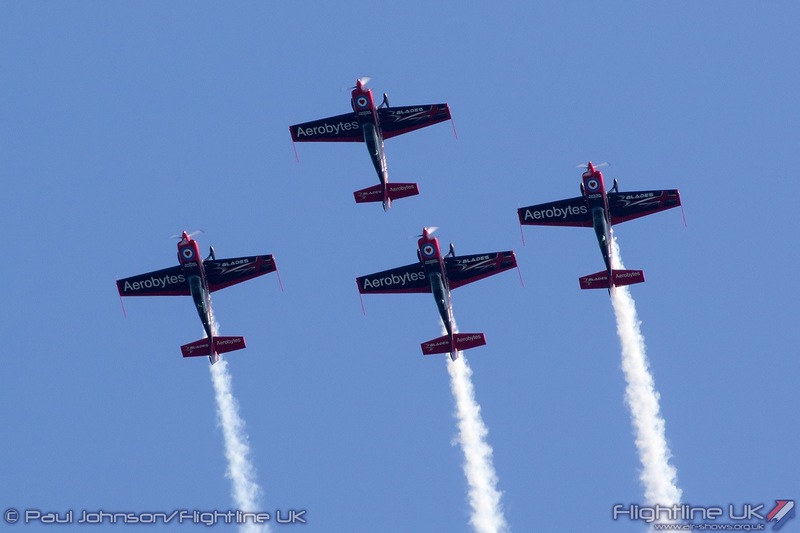 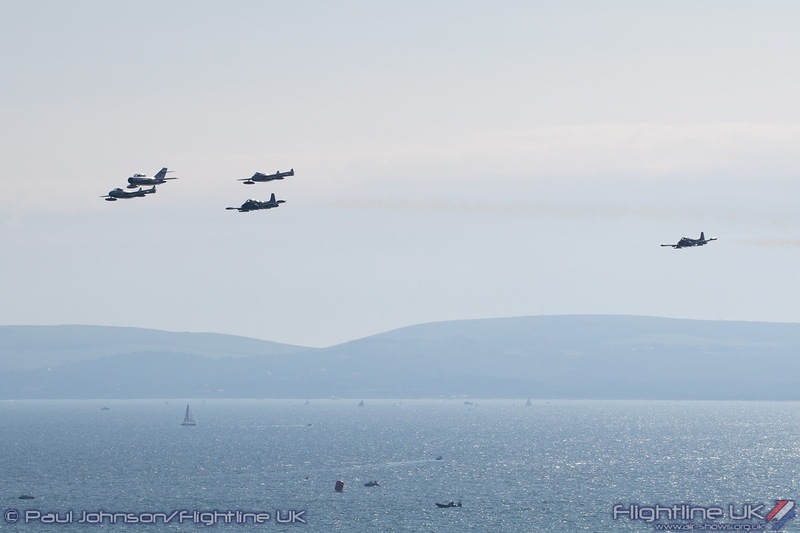 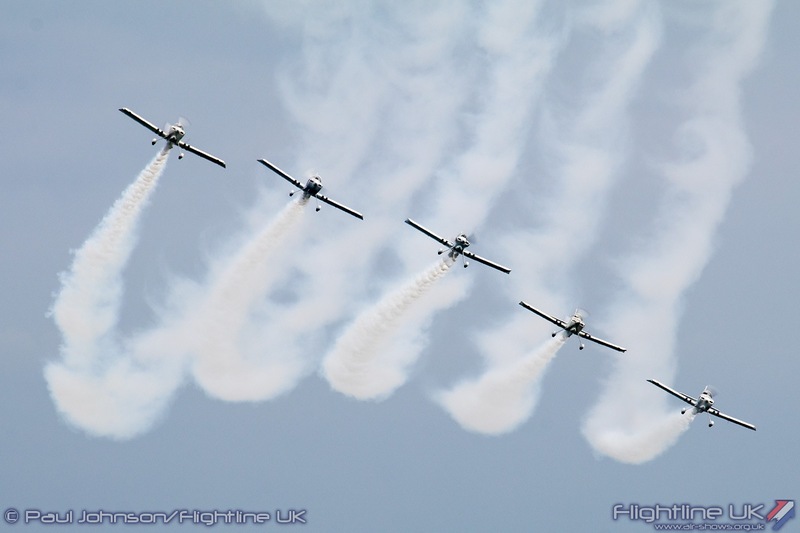 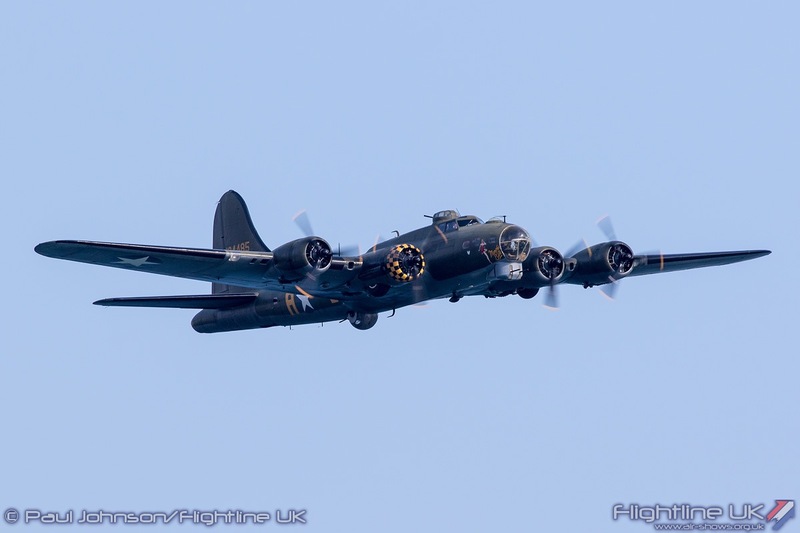 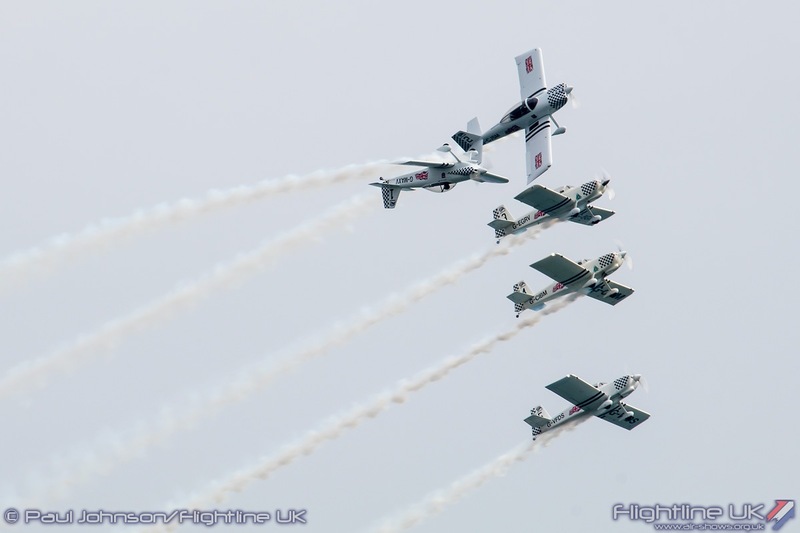 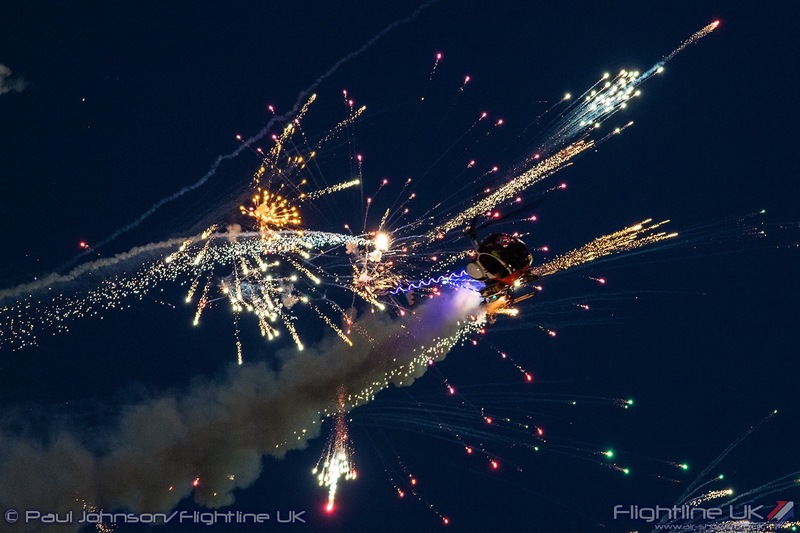 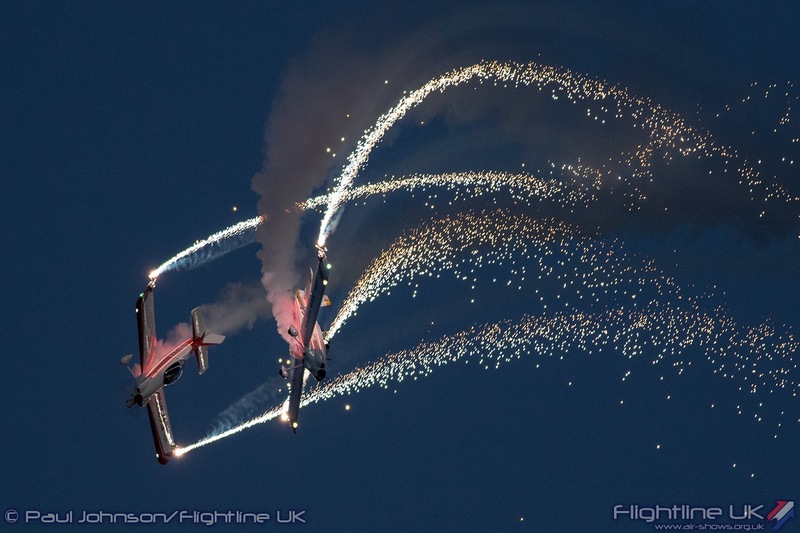 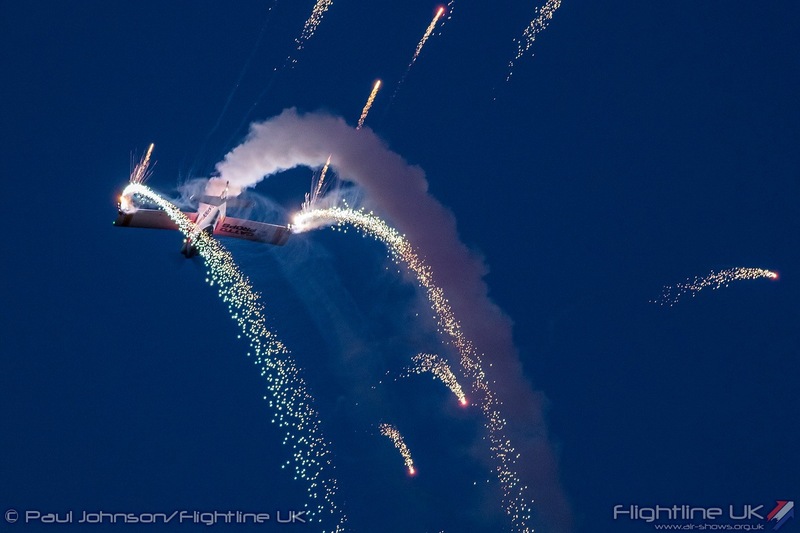 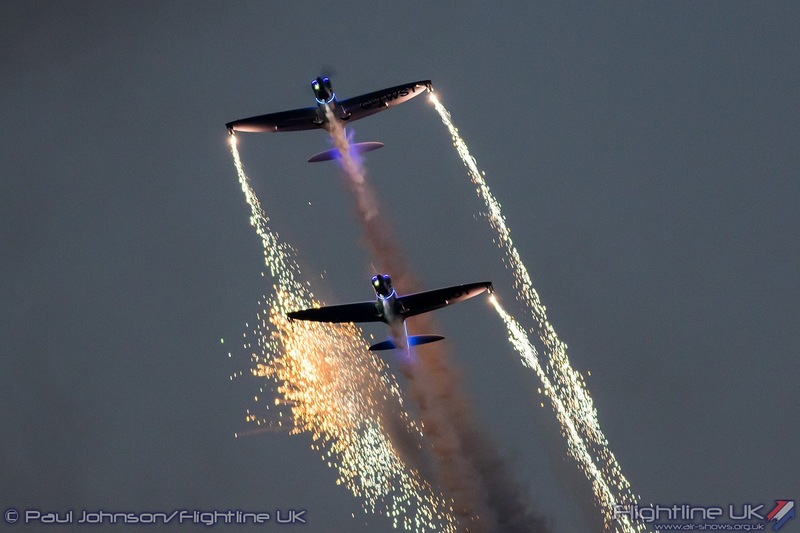 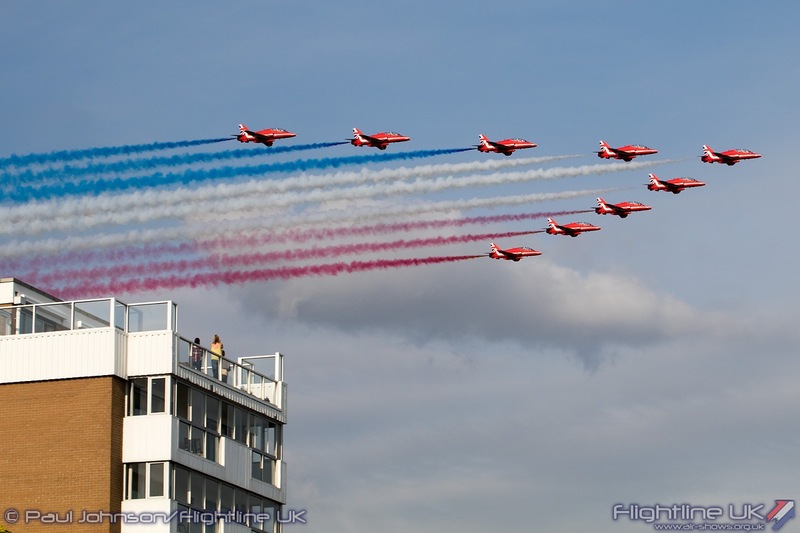 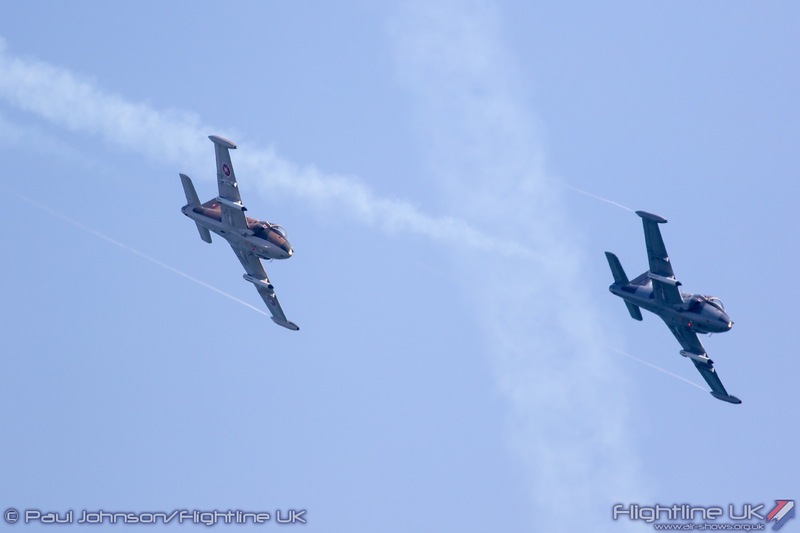 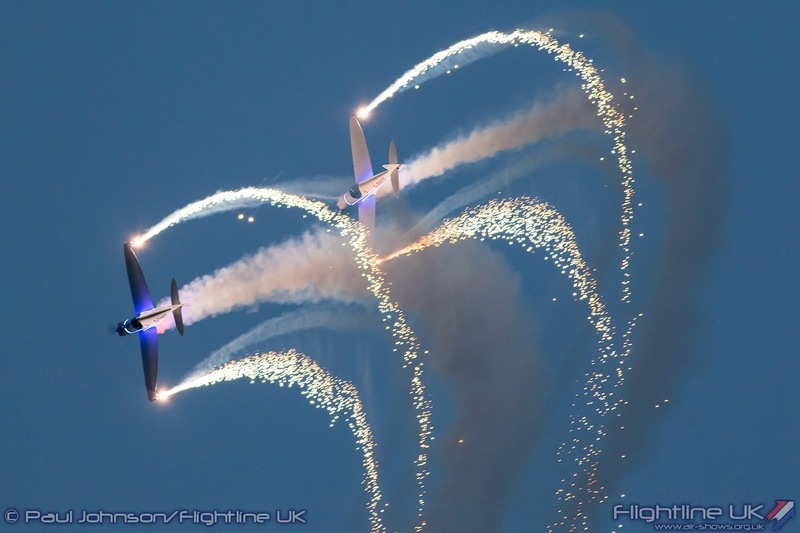 Bournemouth featured four full days of action with afternoon and twilight air displays supported by military displays, live music and other entertainment along the beaches and cliffs of the seafront. 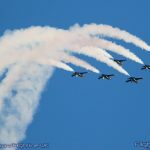 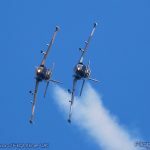 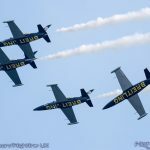 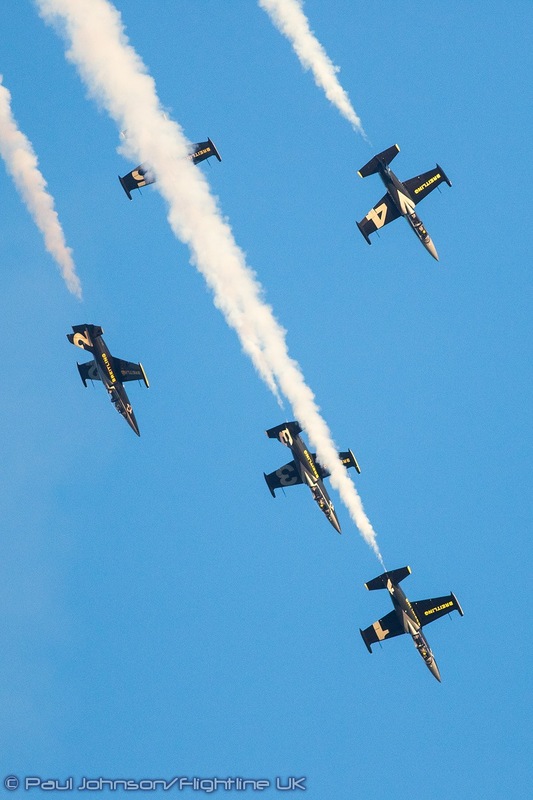 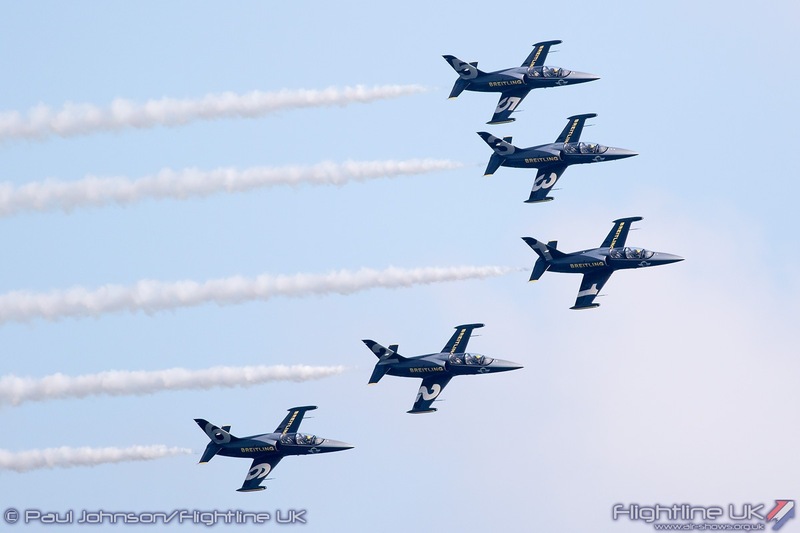 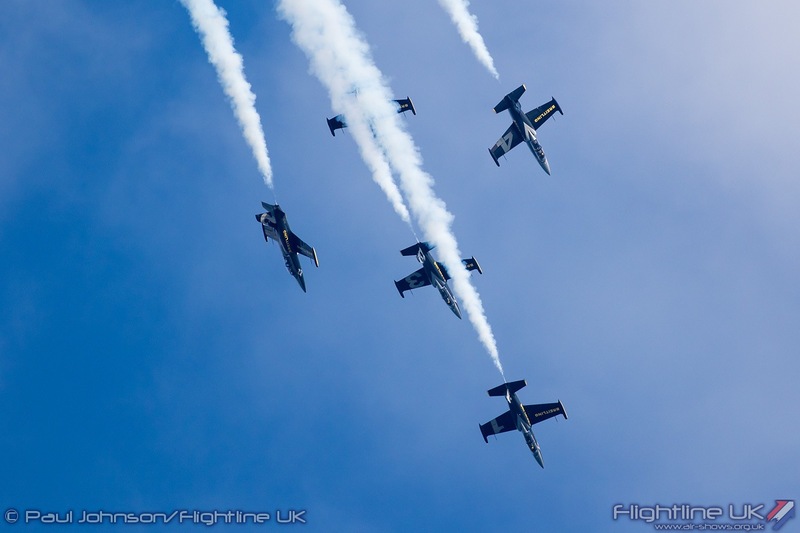 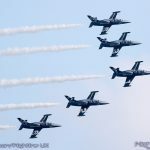 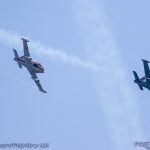 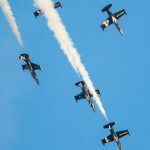 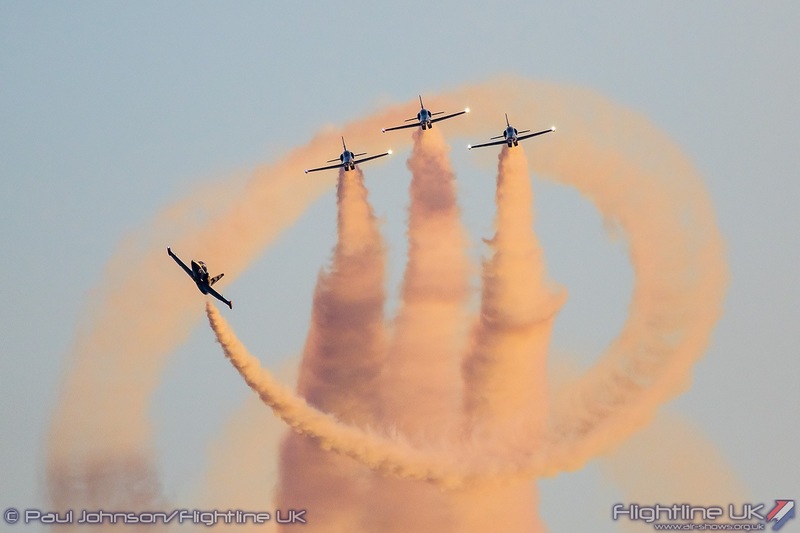 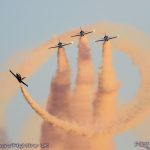 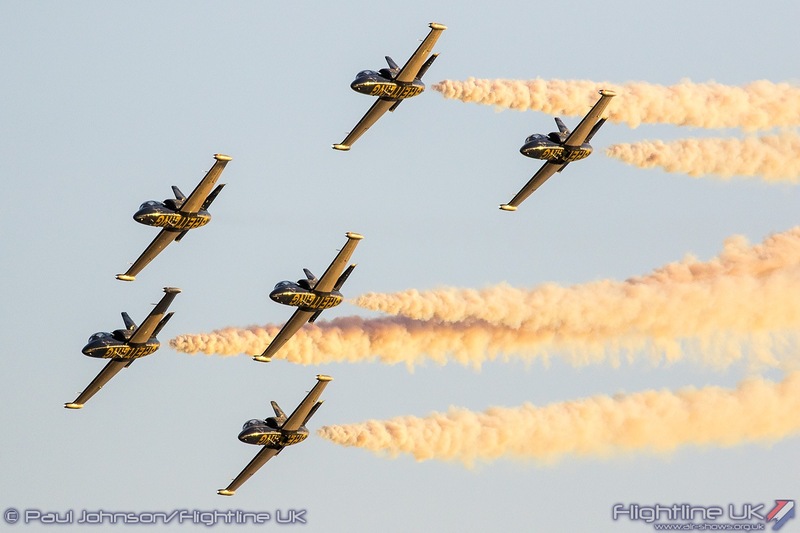 This year also saw the organisers achieve a long-held ambition to host the Breitling Jet Team who were making their only UK appearance of the year at Bournemouth. 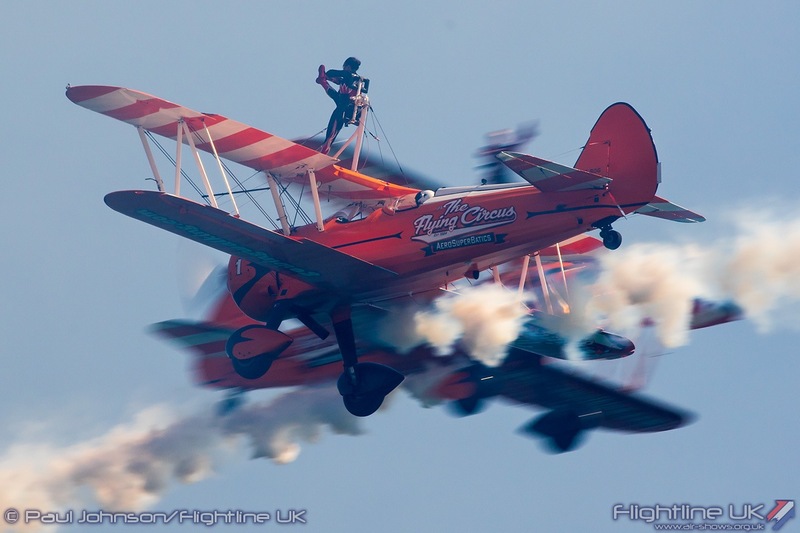 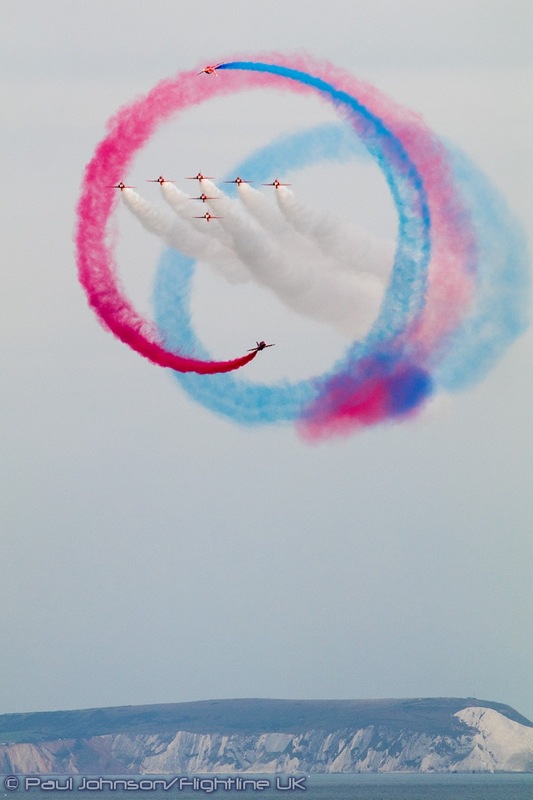 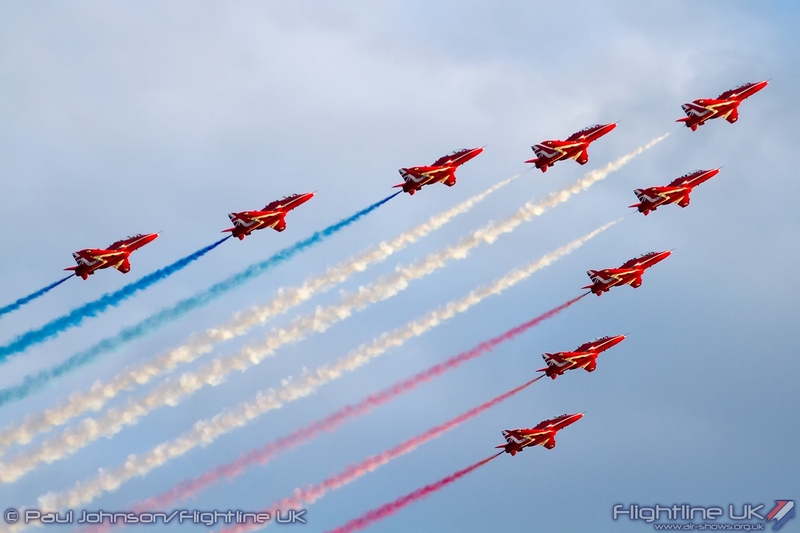 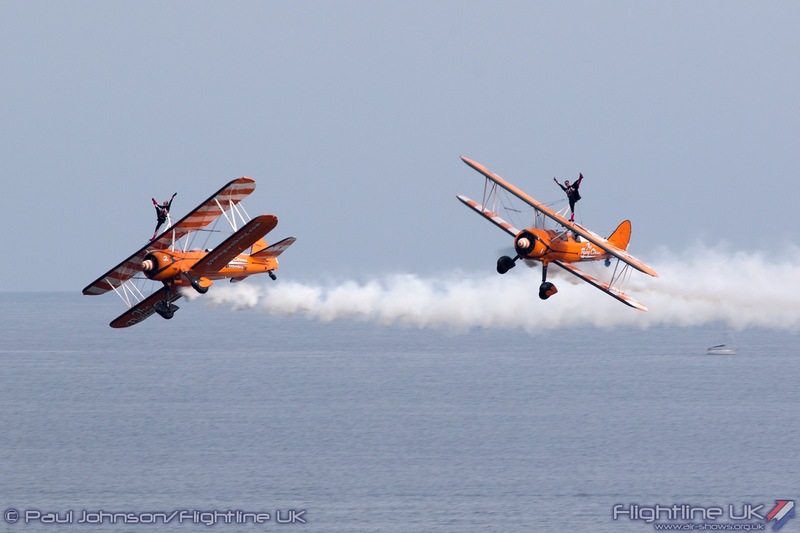 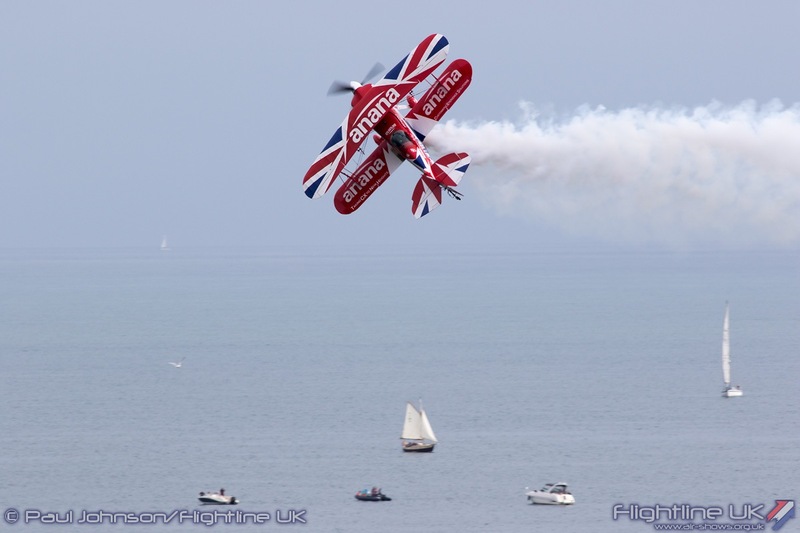 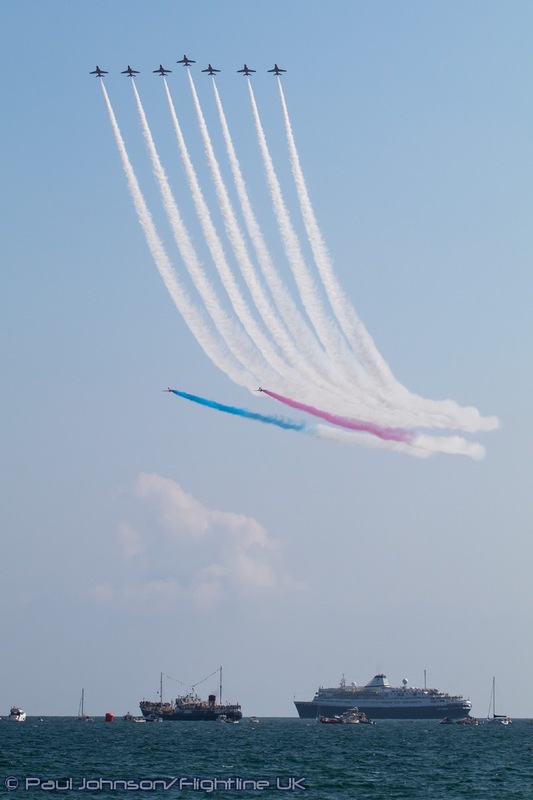 Bournemouth Air Festival is the largest seaside airshow of its kind in the UK. 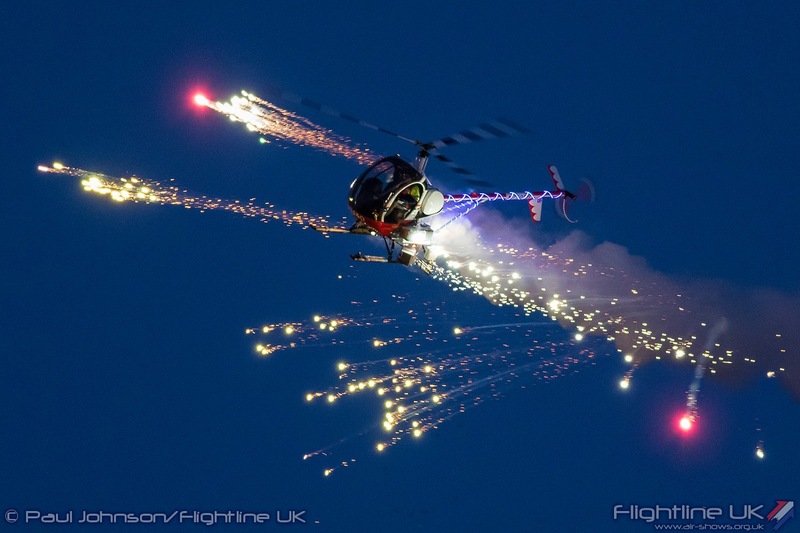 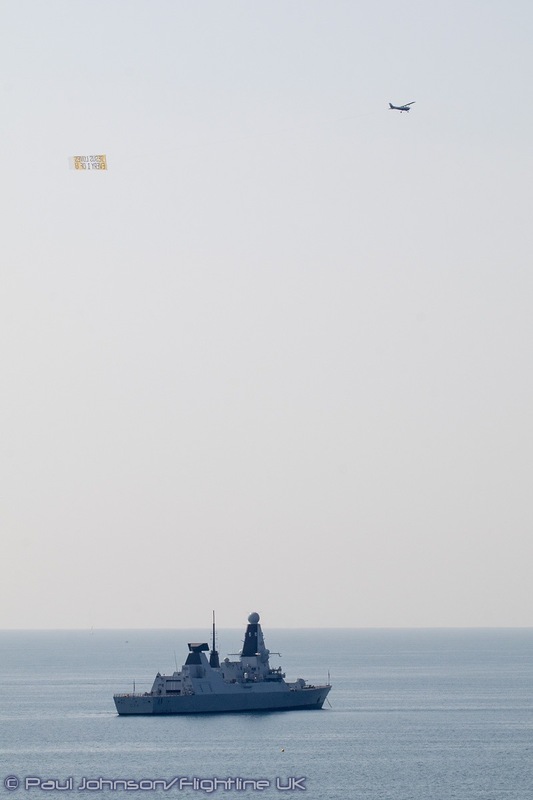 It offers entertainment throughout the four days on the ground, on the beaches and in the skies with good support from the UK armed services and local companies. 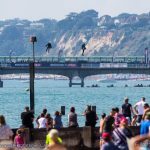 Bournemouth was long overdue a run of four days with good weather and 2018 was a scorcher with no rain and warm weather throughout. 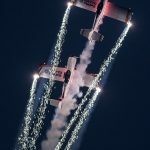 The good weather brought in massive crowds with the total figure reaching just over 1 million spectators over four days. 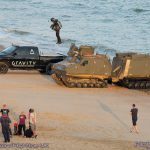 At the centre of the ground shows are UK armed services who have an entire village area on the promenade area near Bournemouth Pier. 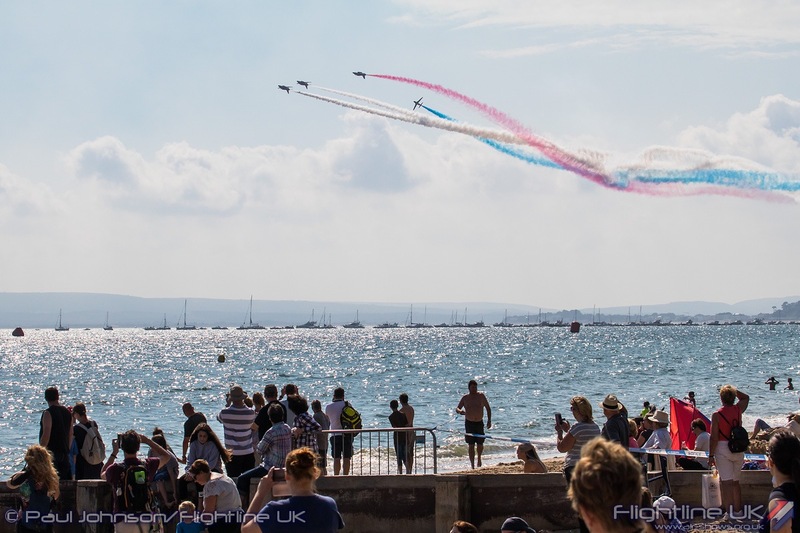 The Exhibition area extends along the beach promenade with further military displays, local traders and street food. 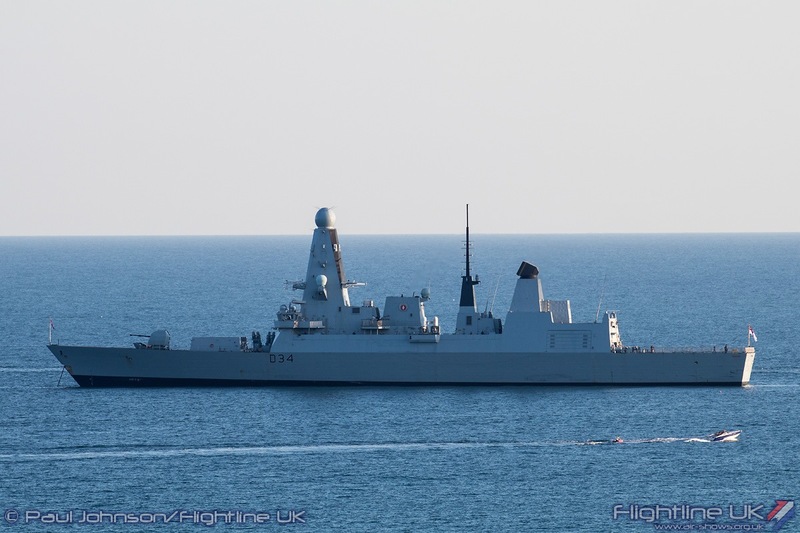 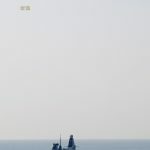 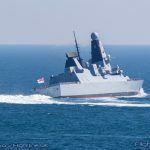 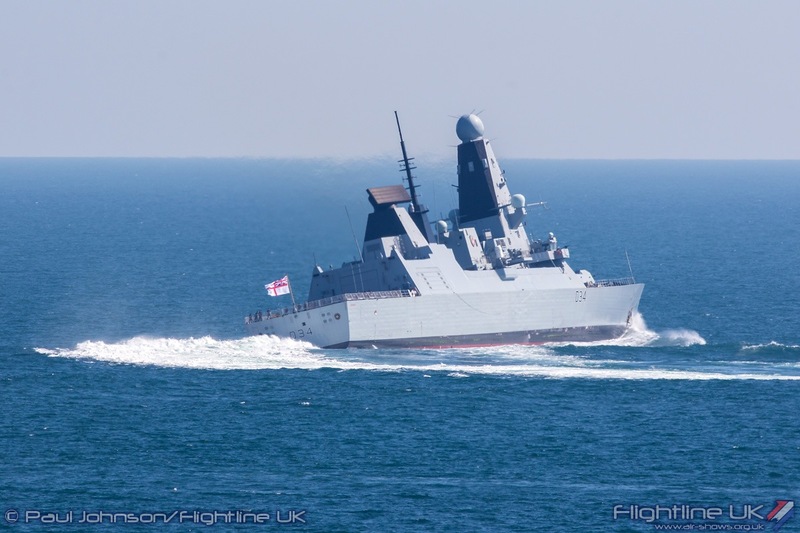 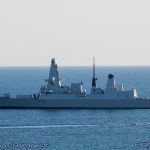 The Royal Navy have always been strong supporters of the event and despite not being able to mount a beach assault this year still had HMS Diamond, a Type 45 Frigate, moored in the bay and open for public tours. 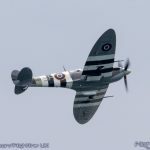 New for 2018 was “A Very Vintage Weekend” which combined classic cars, vintage traders and live music on the East Overcliff. 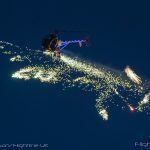 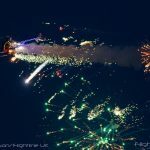 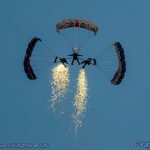 On the opening three days the entertainment continued into the evening with live music on the beach supported by the Night Air flying displays and fireworks. 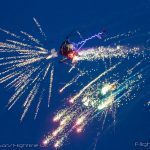 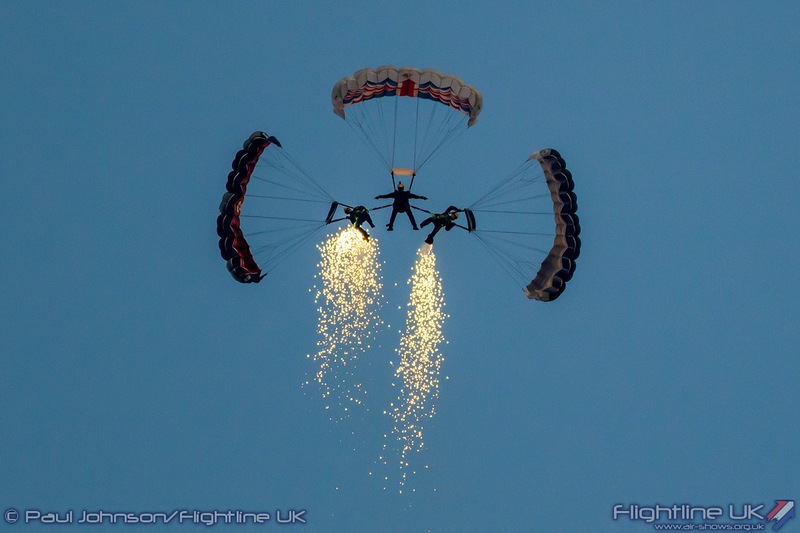 Though not strictly a flying display, a unique aerial display came from Gravity Industries who demonstrated a pair of Jetsuit for the first time in public. 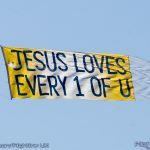 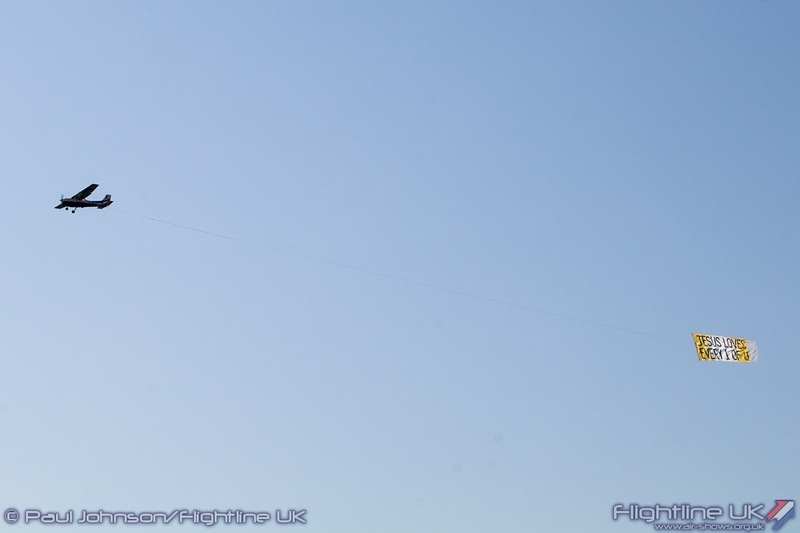 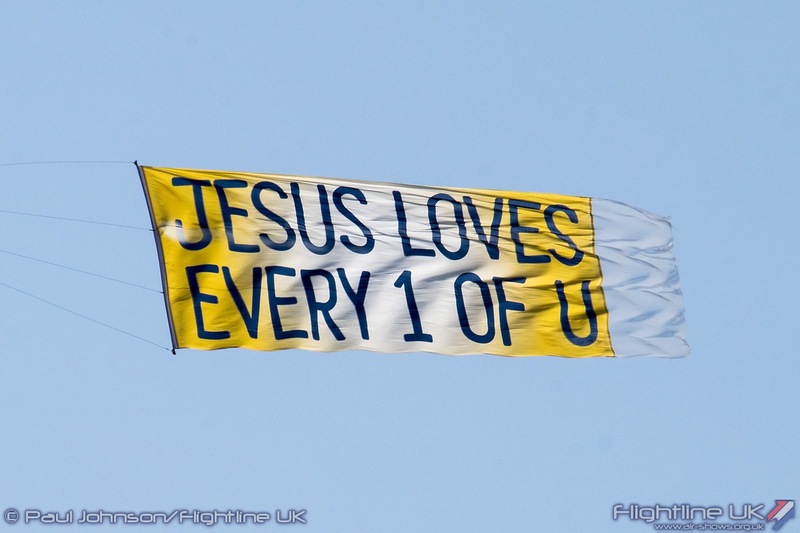 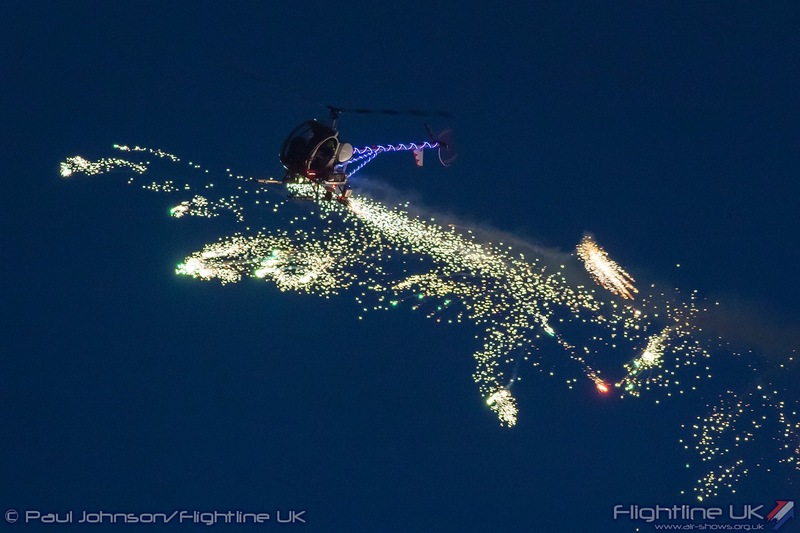 Creator Richard Browning was joined by Dr Angelo Grubisic in a display that flew down the seafront from Bouremouth Pier to the central area on the beach. 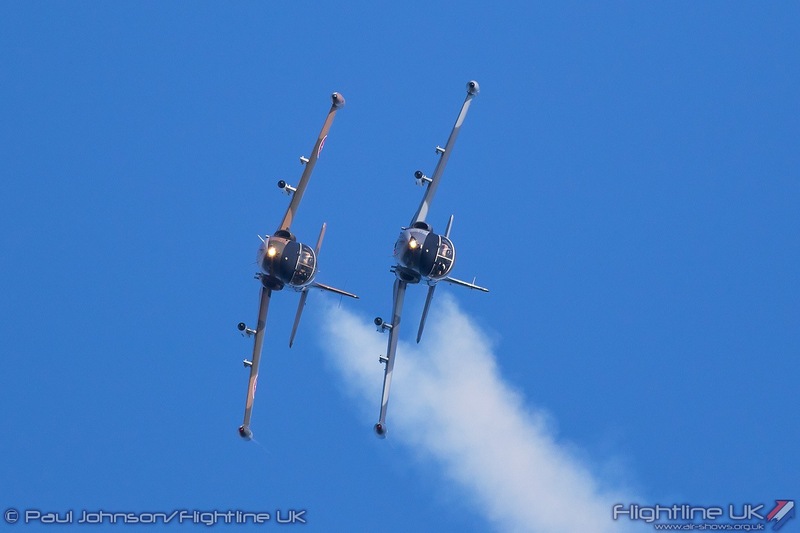 It was certainly an eye-catching sight during their first performance on Friday lunchtime. 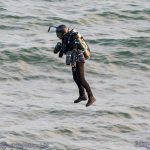 Unfortunately, the following displays didn’t quite go according to plan with Angelo taking a dip on Friday and Richard doing likewise on the Saturday. 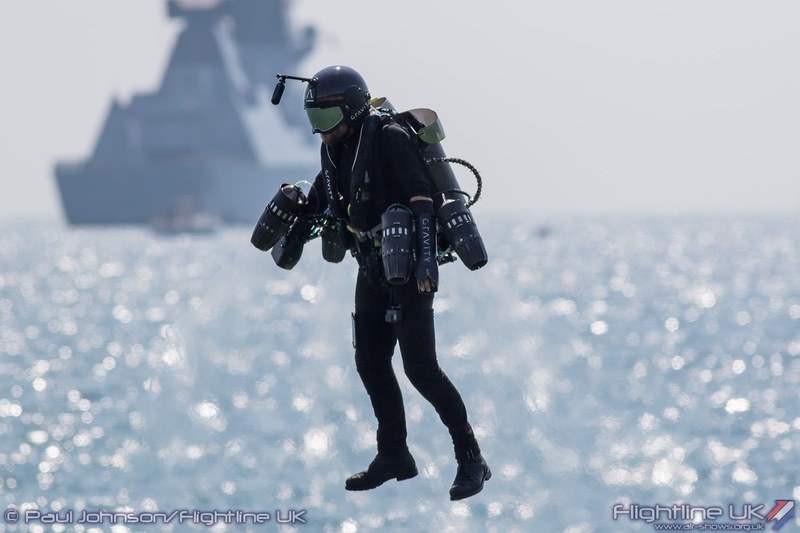 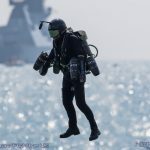 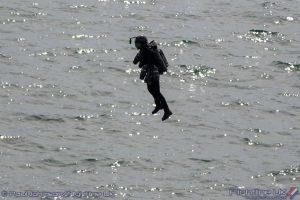 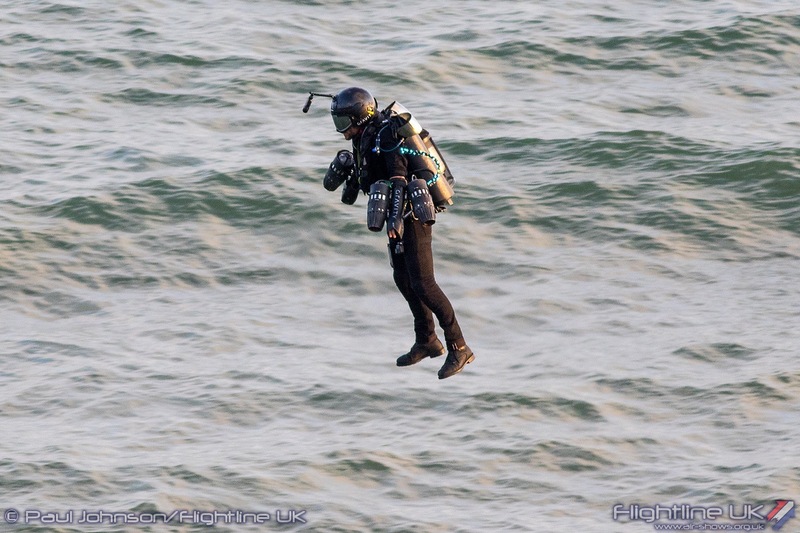 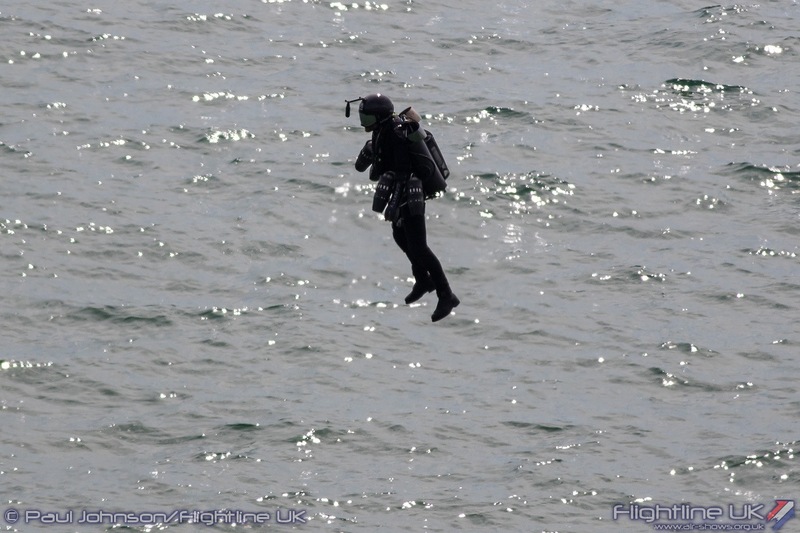 However in both cases the suit’s emergency systems worked quickly inflating a buoyancy aid allowing both pilots to make their own way to dry land without assistance. 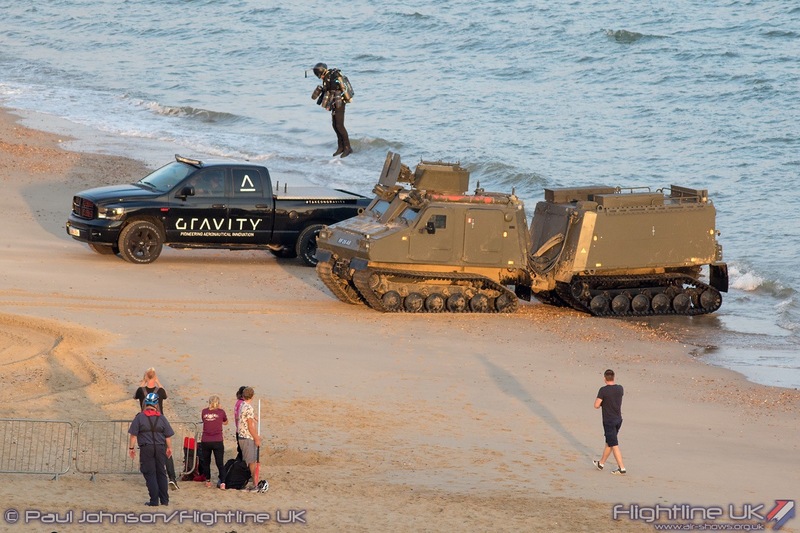 The suits are still in development and the flights at Bournemouth were the furthest the suits had flown in public. 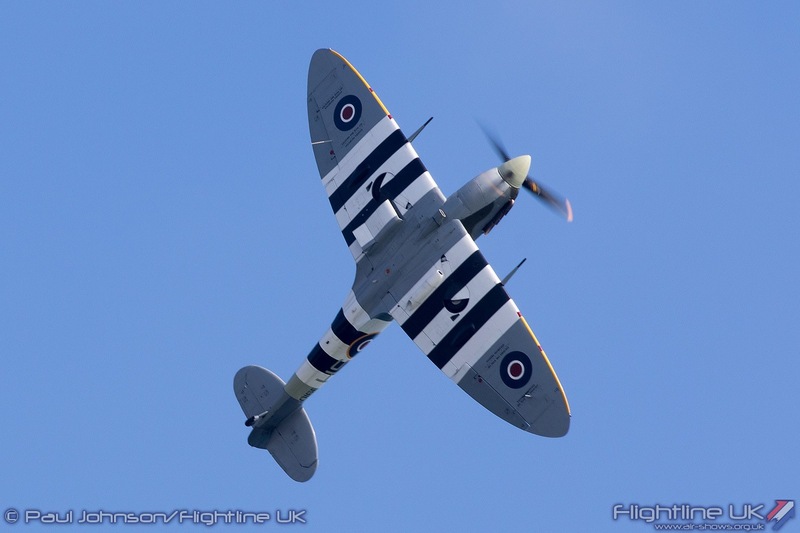 The four days of flying gradually build with the largest line-ups appearing over the weekend. 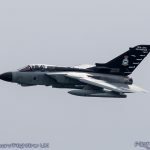 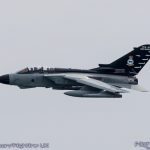 Thursday’s display however opened with a very special and rare airshow flypast from a 31 Squadron Panavia Tornado GR4 from RAF Marham. 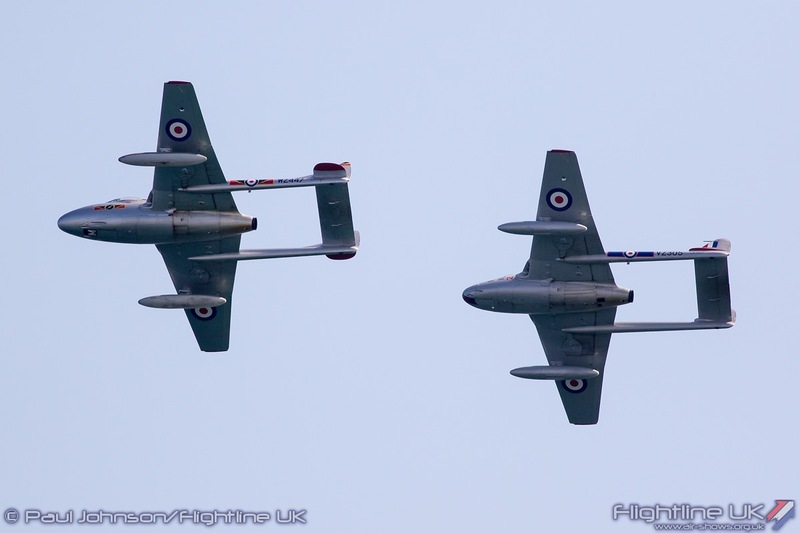 With the type due to retire early next year, this was the last ever appearance by the type at the Air Festival. 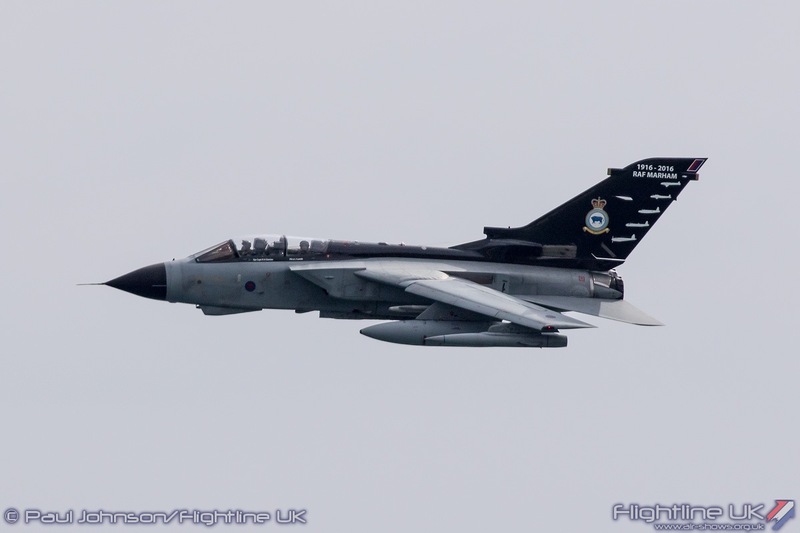 The Tornado was just one part of the Royal Air Force’s contribution to the Air Festival. 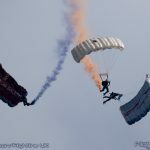 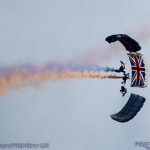 As in 2017, the RAF Events team faced the dilemma of splitting a small collection of acts across three big seaside airshows with events in Scotland and Northern Ireland over the same weekend. 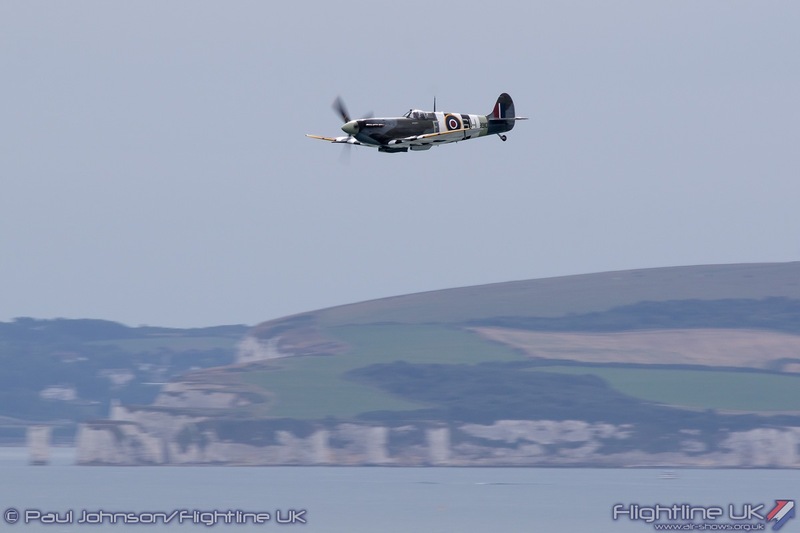 That meant the Typhoon and Tutor solos headed north once again missing the Air Festival. 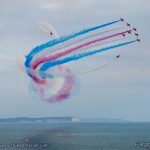 However, Bournemouth was allocated the Red Arrows for three days which is mark of just how high a regard the Air Festival had with the RAF. 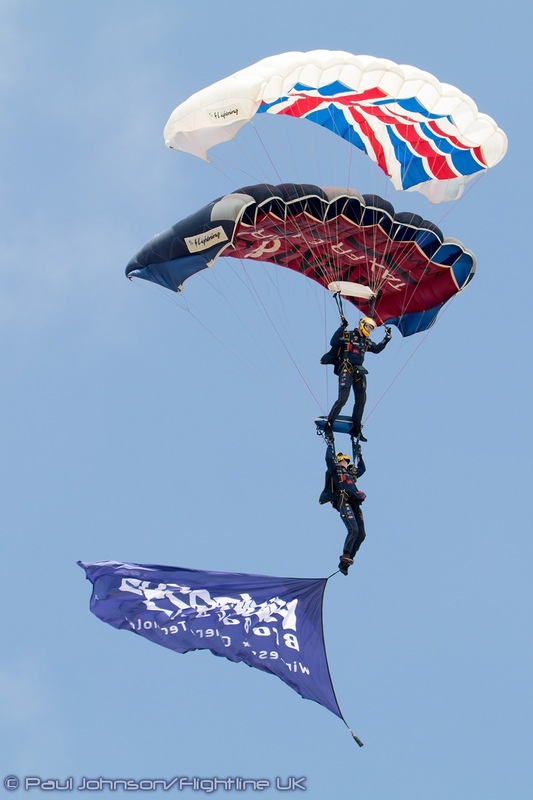 With good weather, the team got in three full performances over the weekend to the delight of the spectators ending each appearance with the beautiful centenary pass. 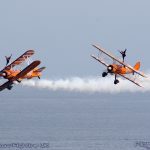 They really bring in the crowds too and Saturday’s early performance really filled both the beaches and the cliff top roads. 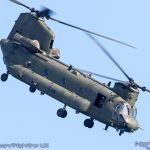 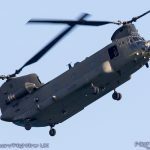 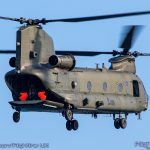 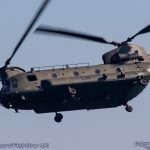 The RAF Chinook Display Team also committed to three days of displays at Bournemouth rounding off their 2018 season. 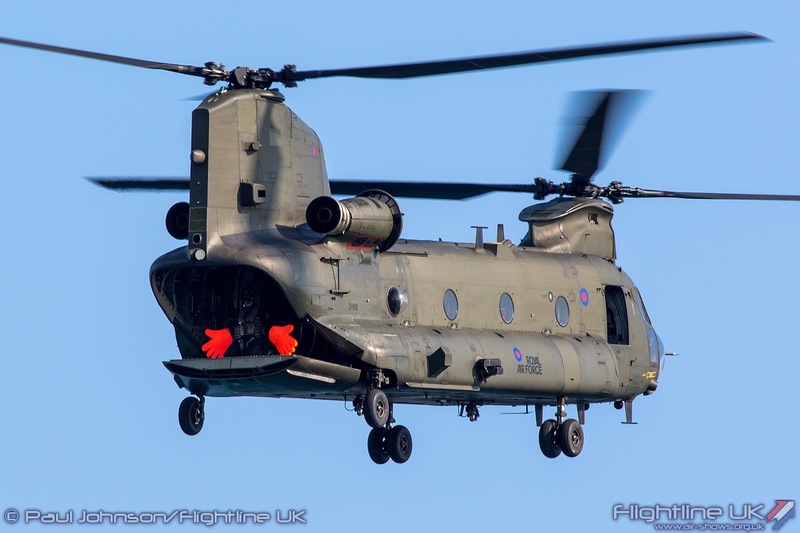 This year has seen the Boeing Chinook HC6A variant displayed for the first time by the team who have had a very busy summer fitting in displays around their normal operations from RAF Odiham in Hampshire. 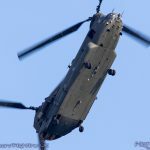 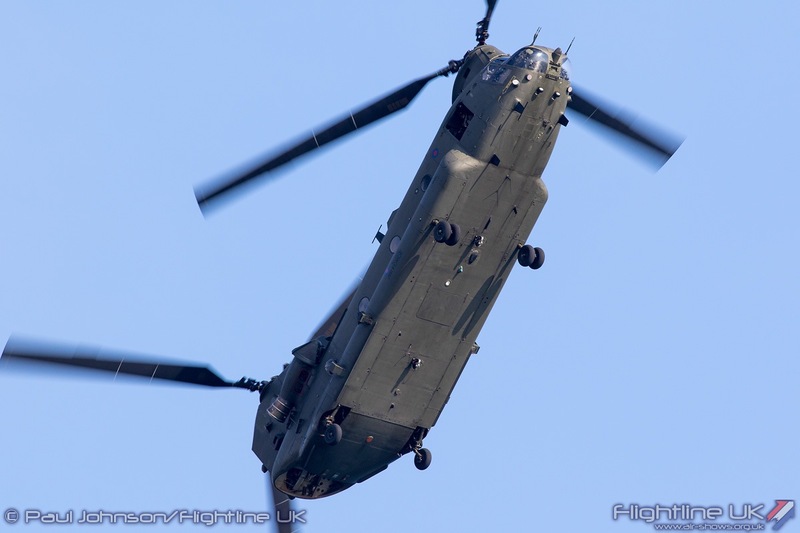 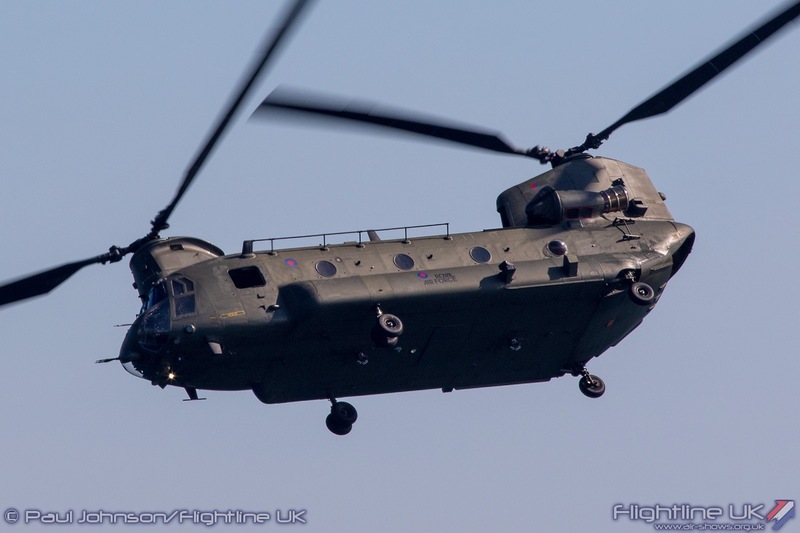 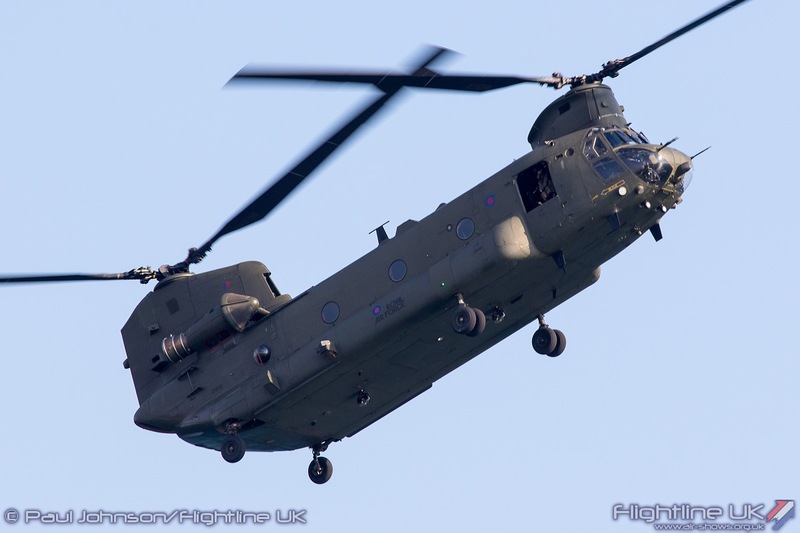 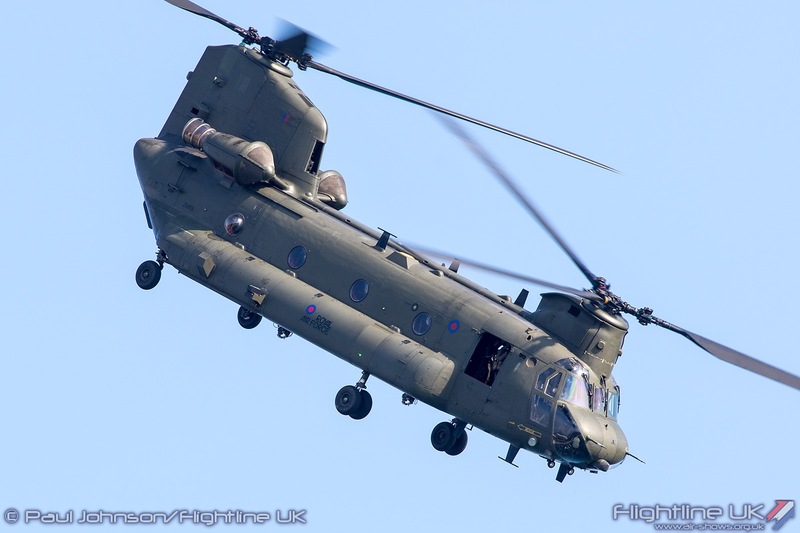 The Chinook displays have been tamed over recent years but it is still an impressive beast at any airshow with its size and trademark ‘bladeslap’ turning heads skywards. 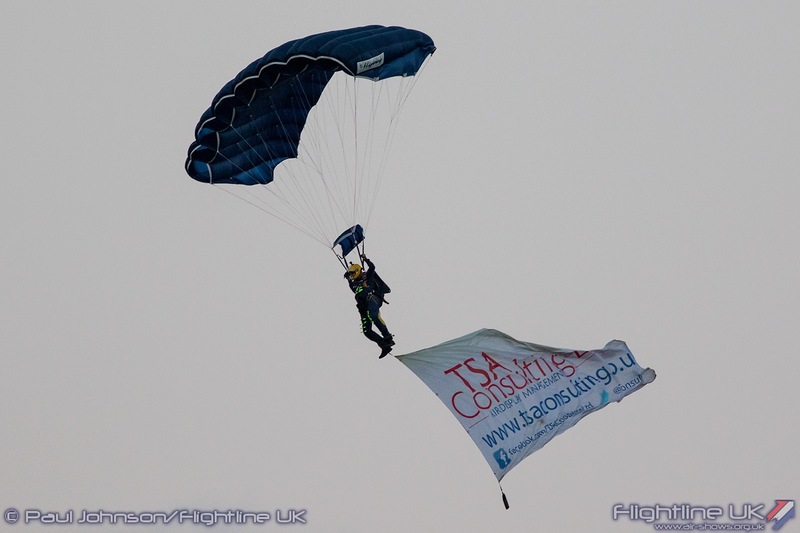 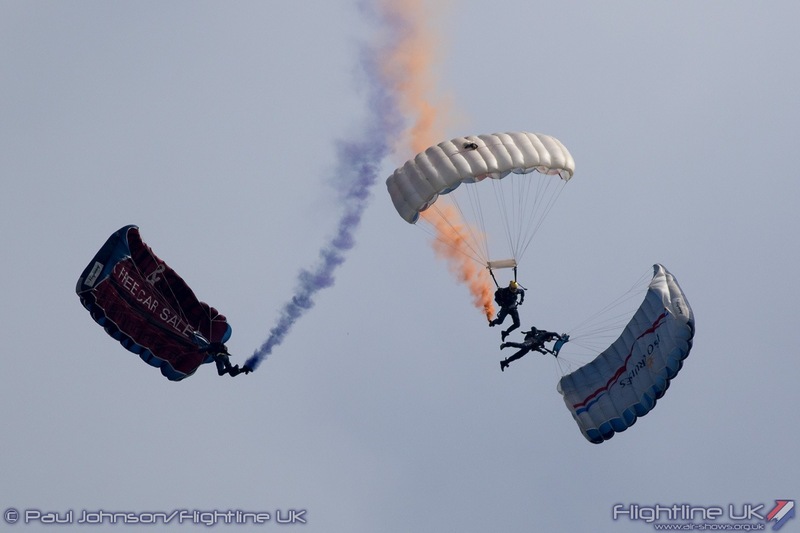 The Tigers Army Parachute Display Team from the Princess of Wales Royal Regiment are part of the fabric at Bournemouth Air Festival having appeared since the first event. 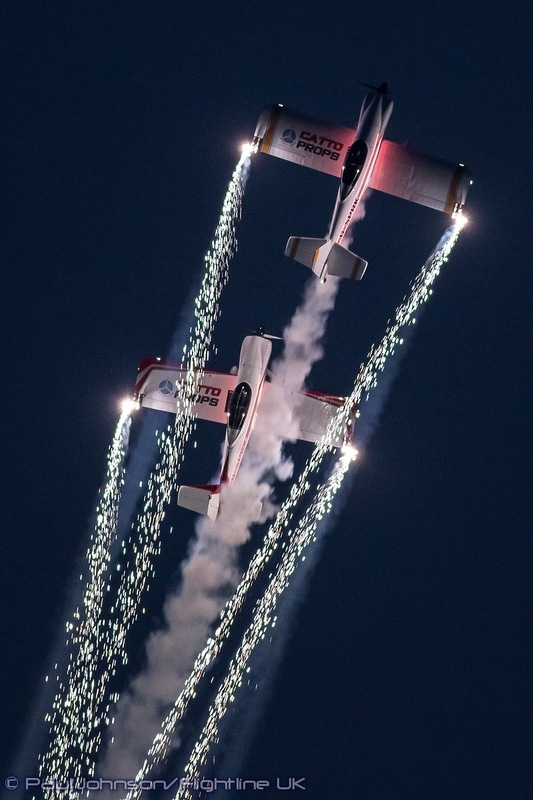 The team fully entered into the spirit of the event dropping five times over the four days including an appearance during Night Air. 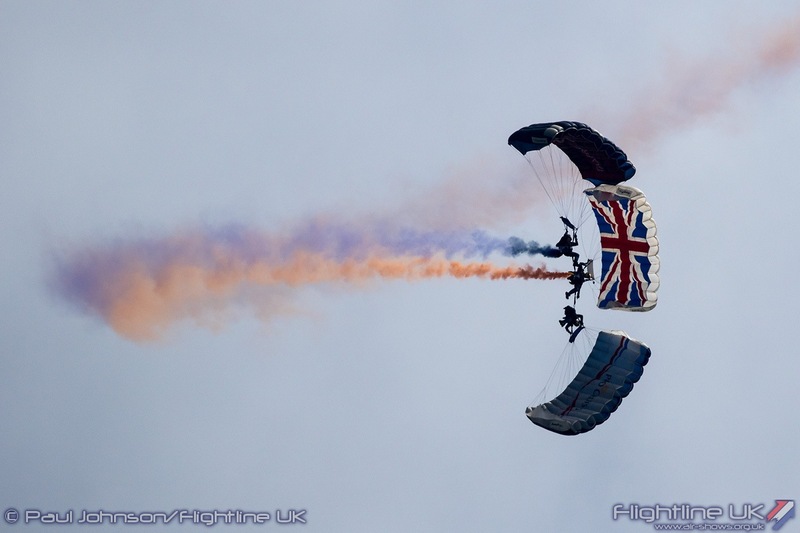 Every display they did was slightly different with variations on canopy work and also different flags. 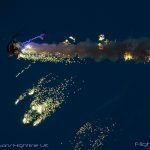 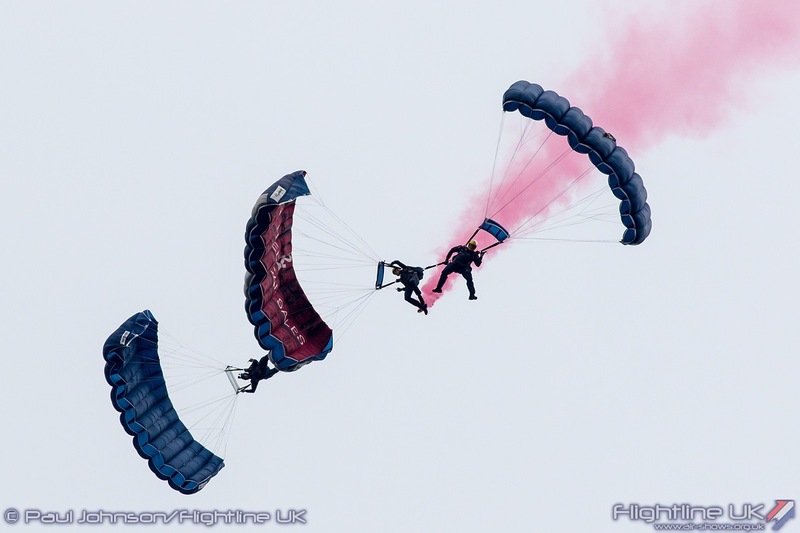 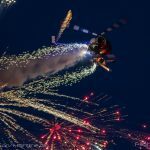 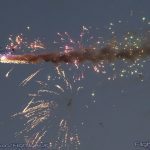 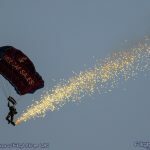 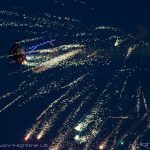 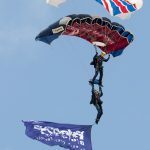 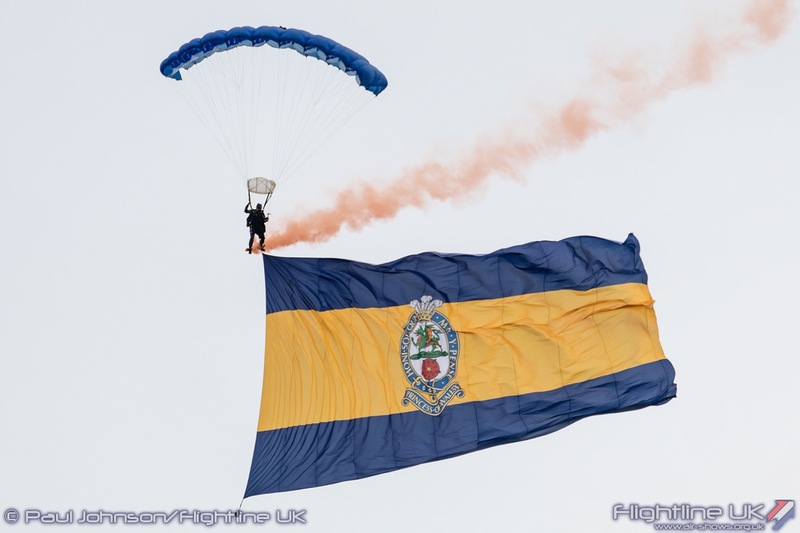 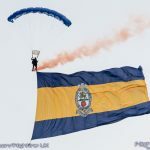 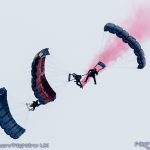 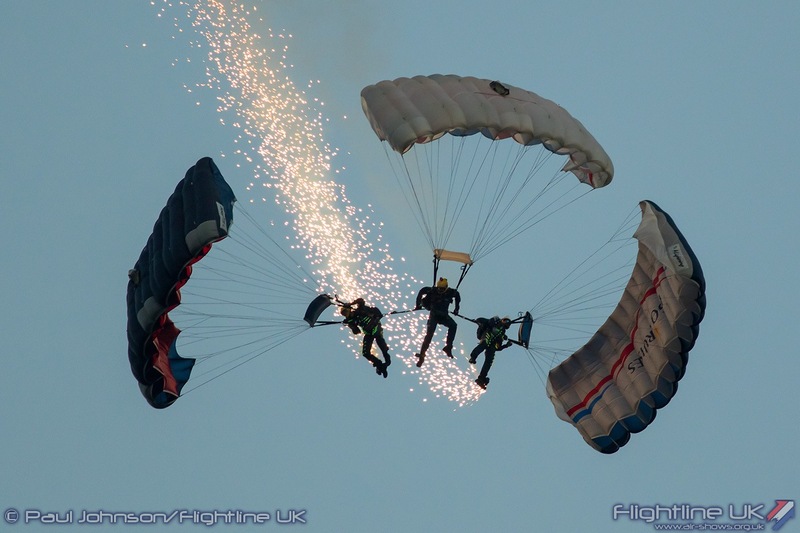 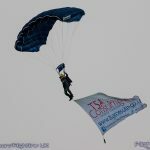 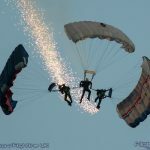 Bournemouth saw the first public jump with a 2000 square foot regimental flag on the Thursday plus a stunning evening jump with pyrotechnics streaming from the parachutists feet on Friday. 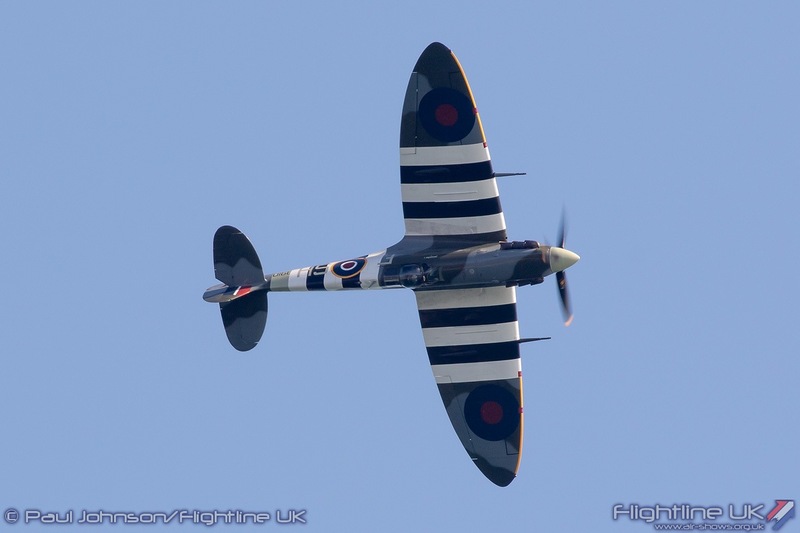 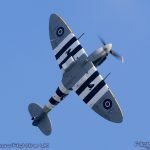 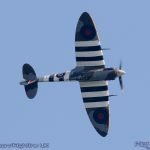 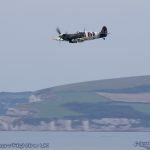 In the Royal Air Force and Armistice centenary year, the Air Festival took on a significant commemorative and heritage theme. 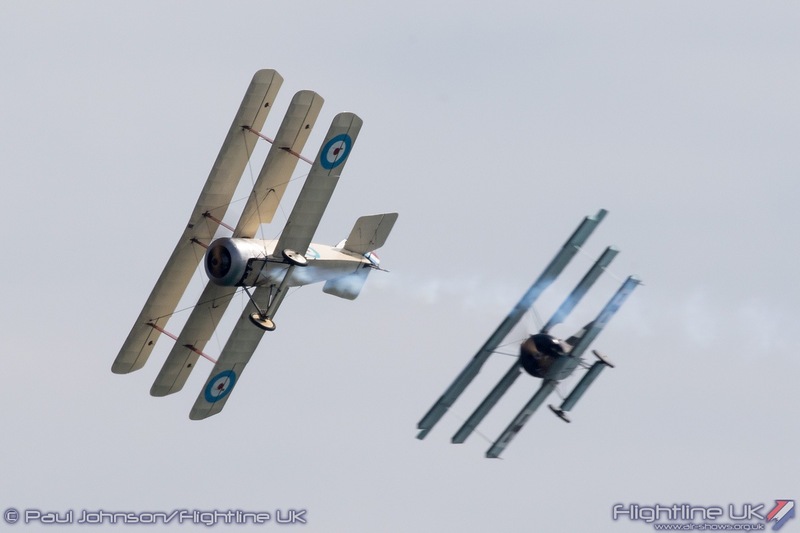 Both themes were represented on the Saturday and Sunday by the Bremont Great War Display Team. 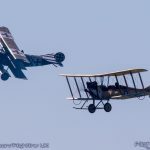 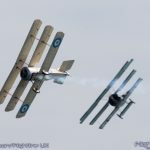 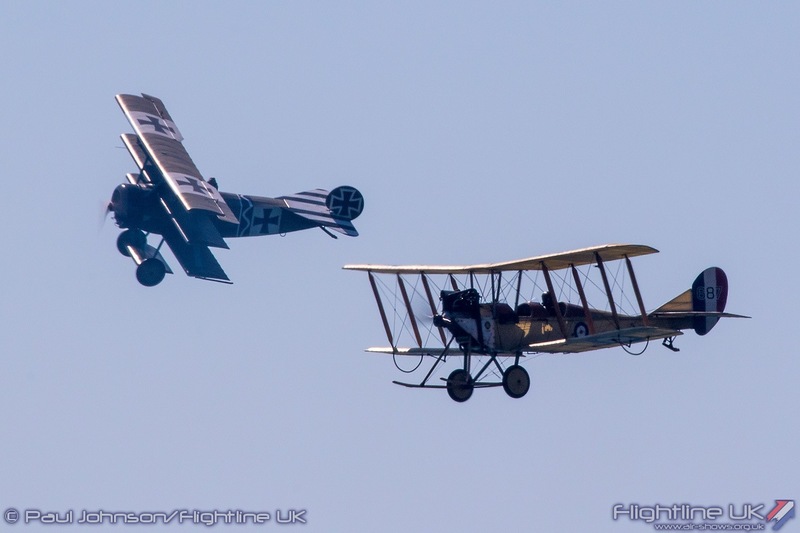 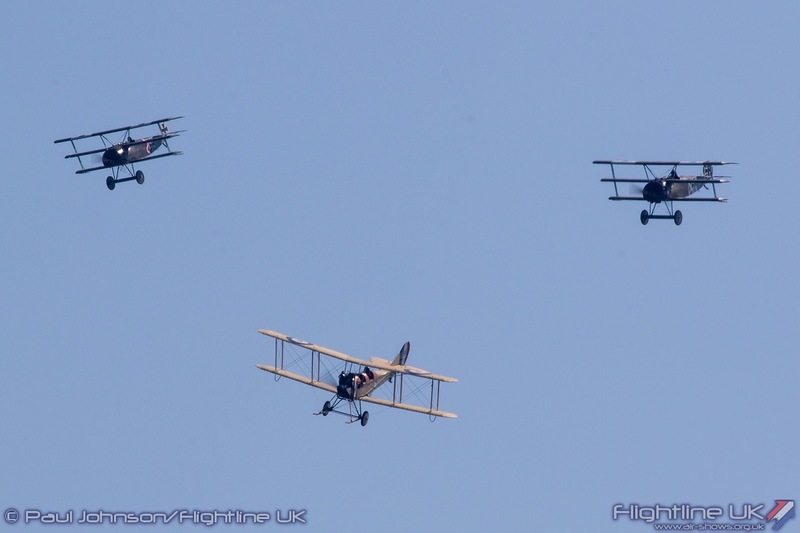 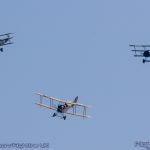 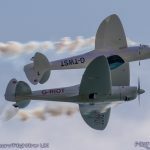 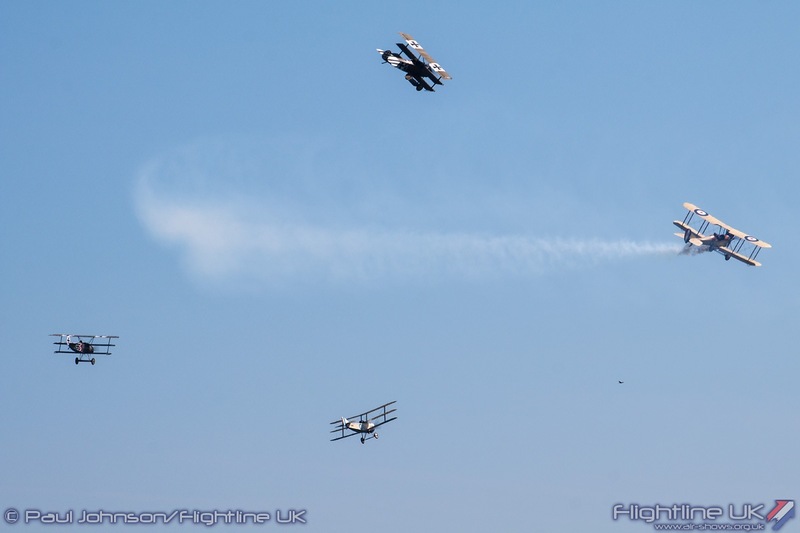 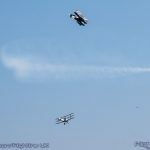 Their display featured eight aircraft including three RAF SE5as, a RAF BE2c, Sopwith Triplane, Junkers CL1 and a pair of Fokker Dr1s which recreated a swirling dogfight over the blue waters. 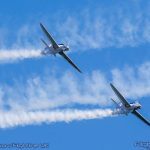 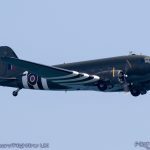 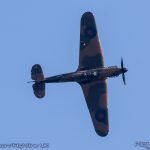 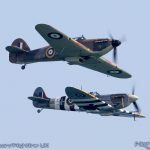 The Royal Air Force’s contribution to the Second World War was remembered with the Battle of Britain Memorial Flight which sent two displays to Bournemouth. 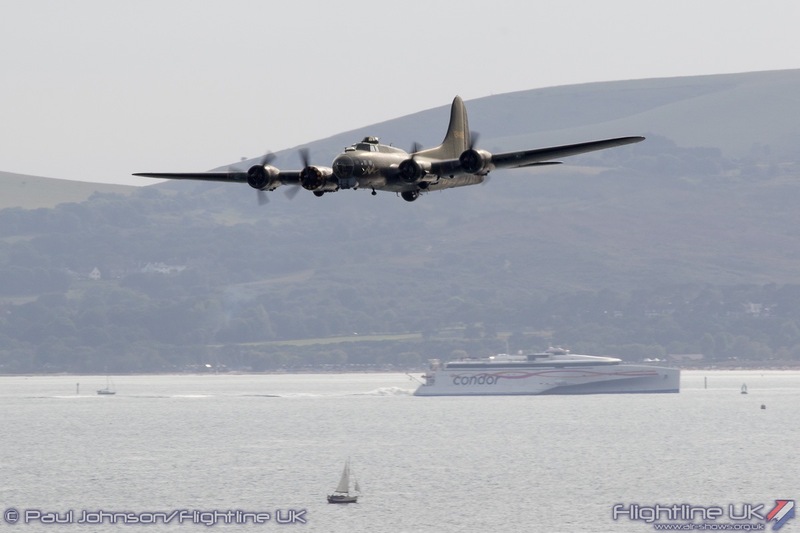 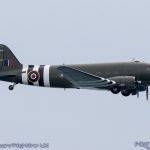 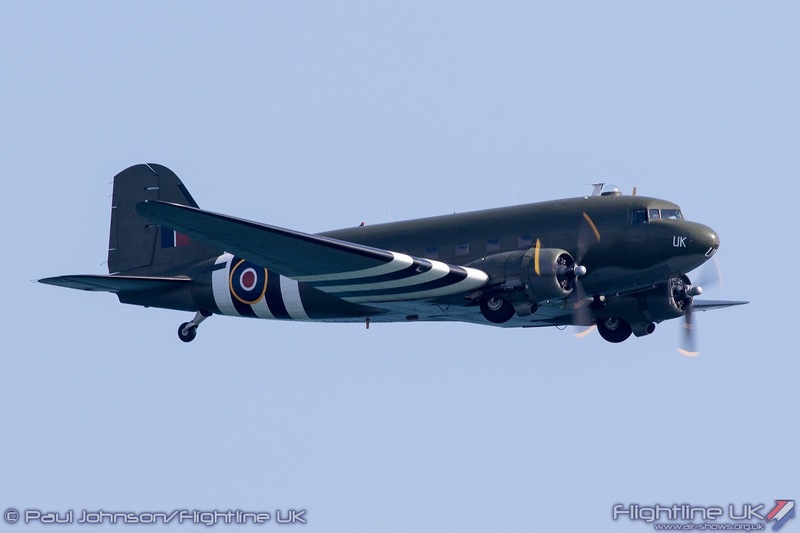 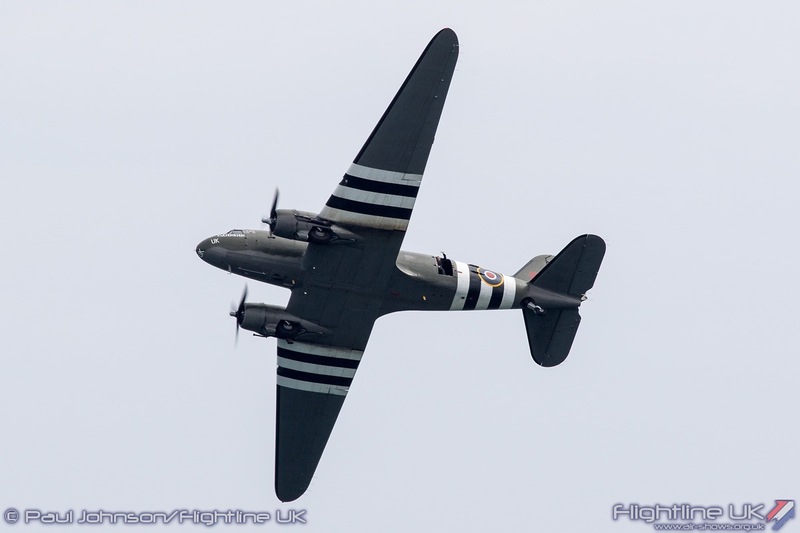 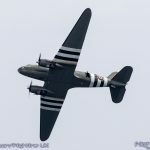 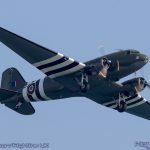 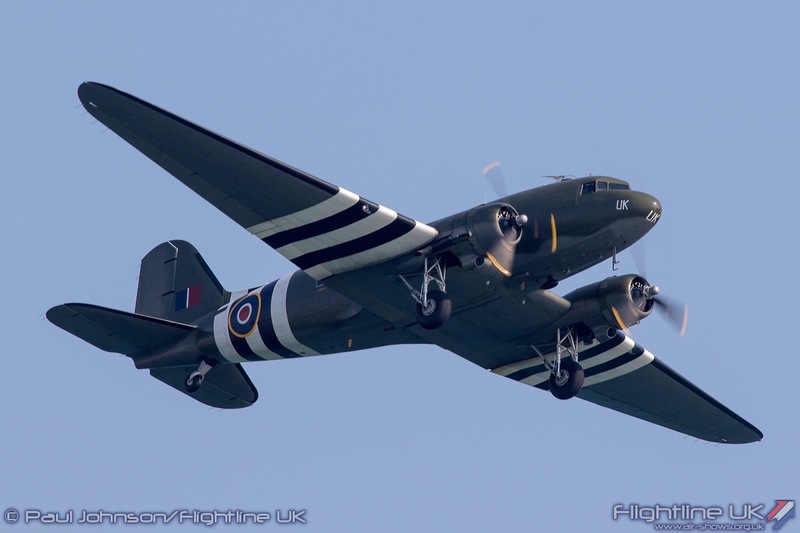 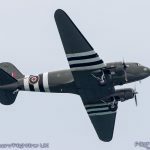 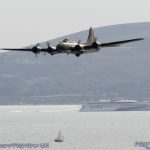 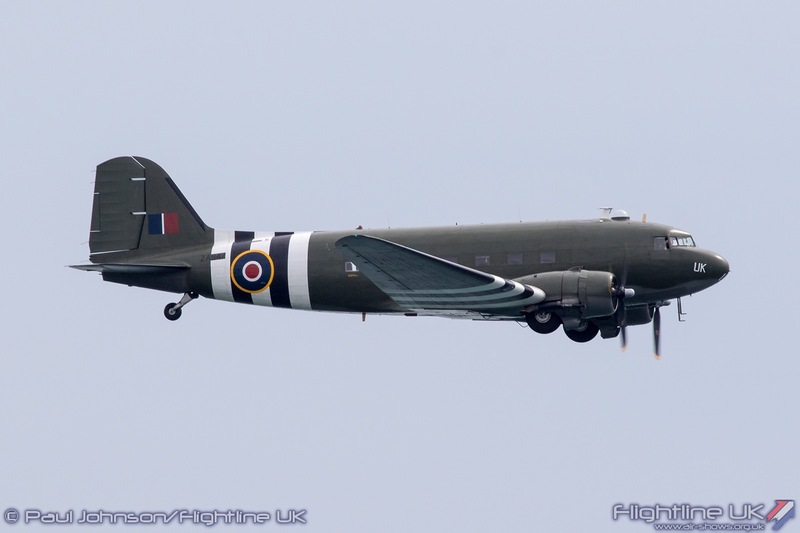 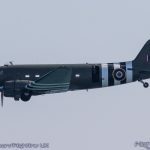 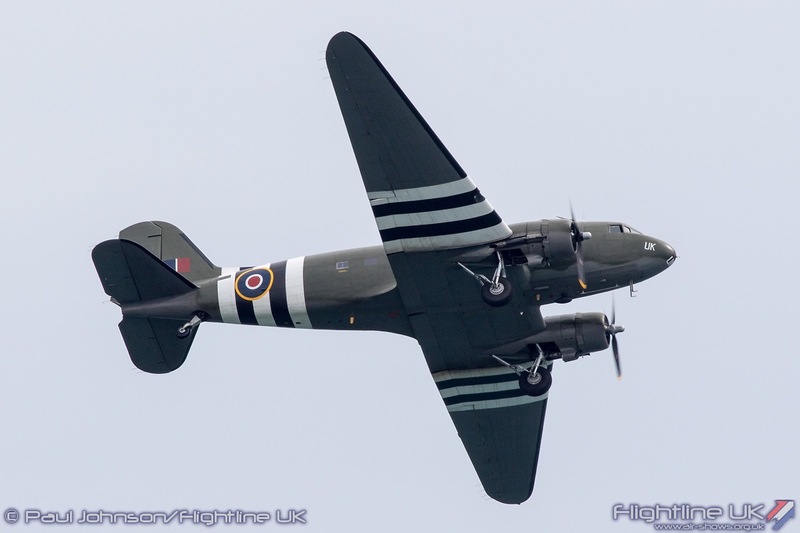 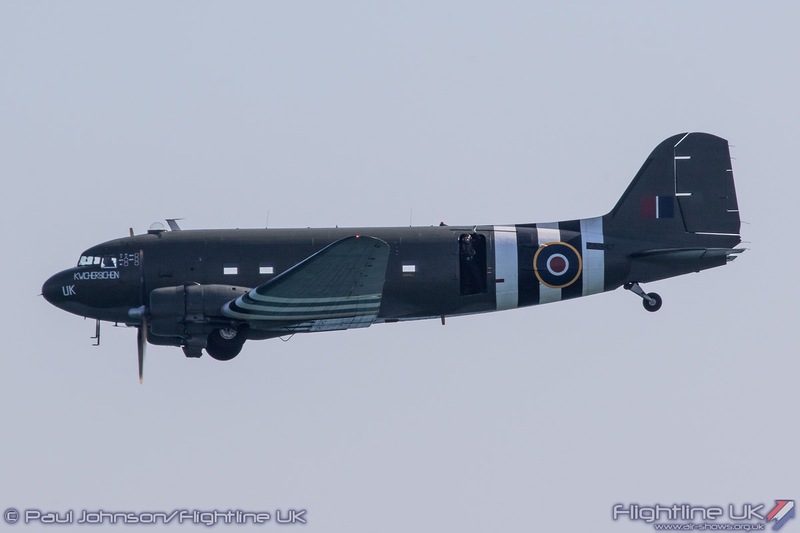 The flight’s Douglas Dakota III made a rare solo appearance on all four days of the festival remembers the D-Day landings, the ill-fated Arnhem airborne assault plus the Berlin Air Lift. 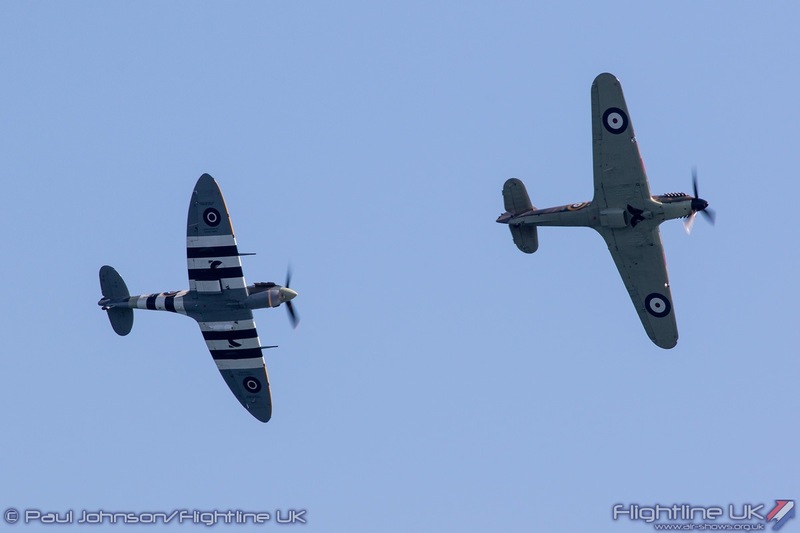 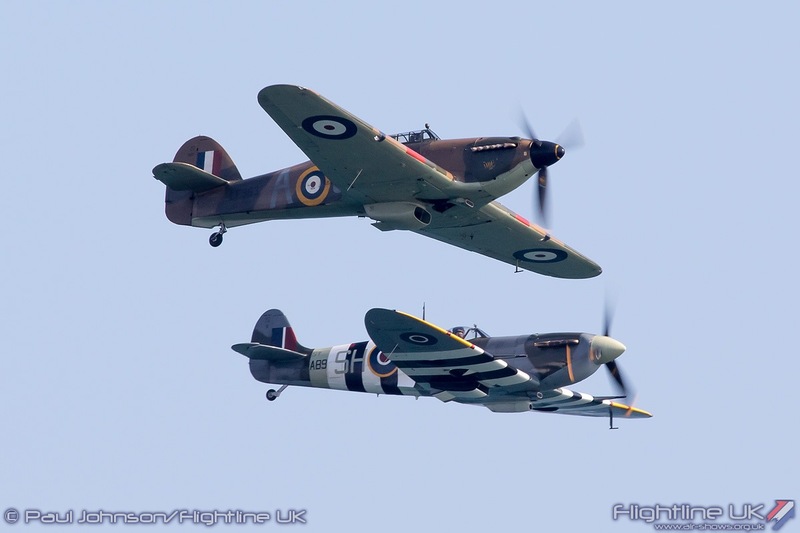 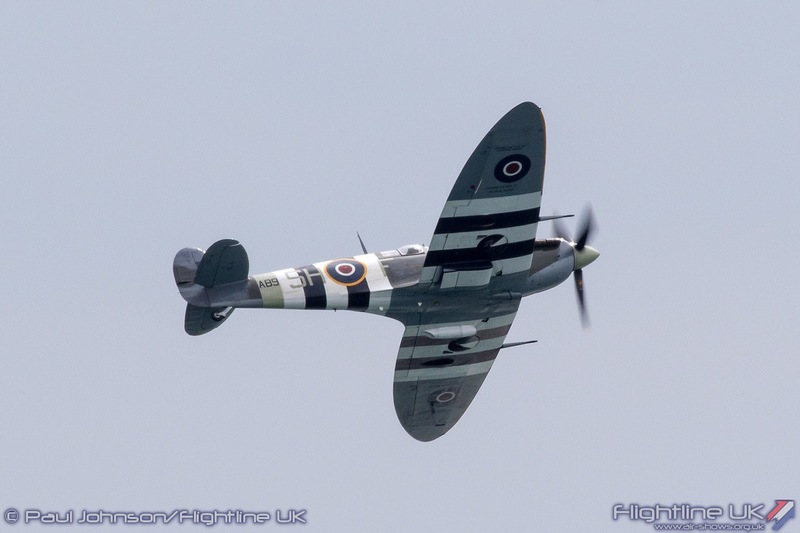 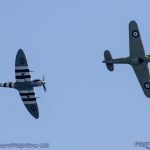 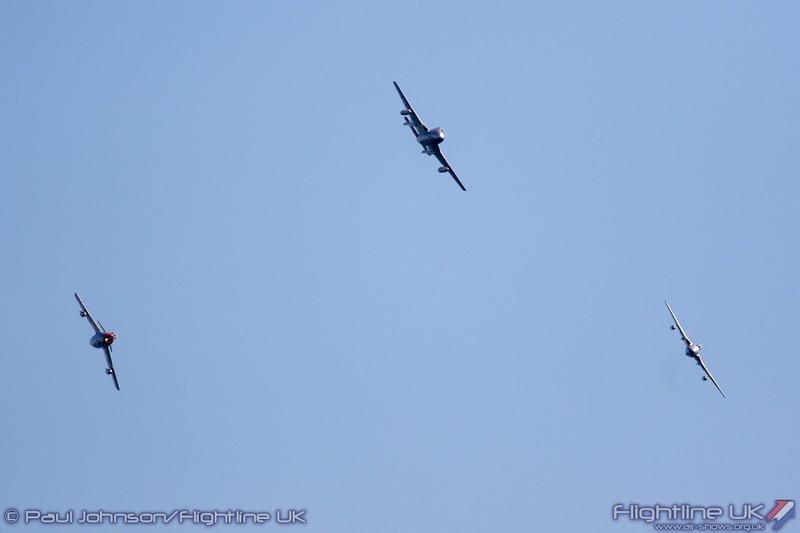 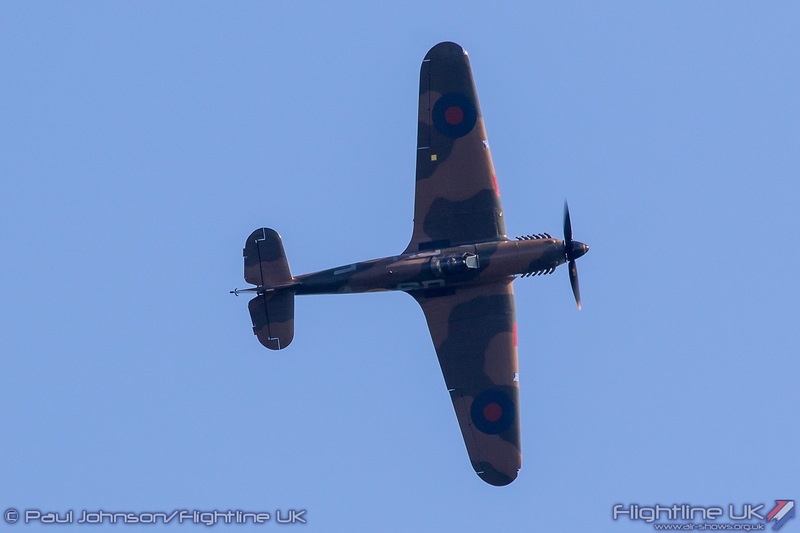 The flight also sent a traditional pair of fighters to Bournemouth with Supermarine Spitfire Vb AB910 and Hawker Hurricane IIc LF363 displaying throughout the event. 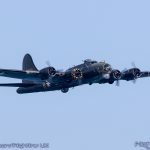 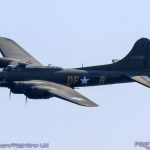 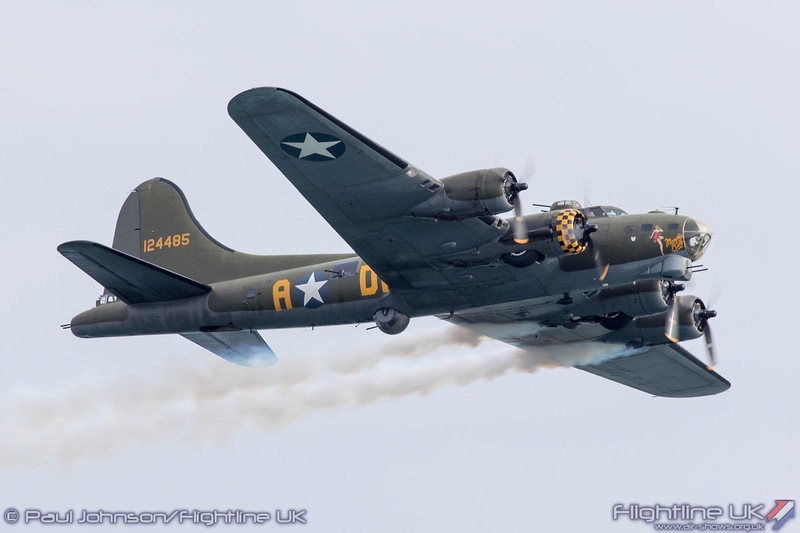 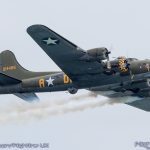 The United States Army Air Force was also remembered in each day’s display with a poignant display by Boeing B-17G Flying Fortress Sally-B. 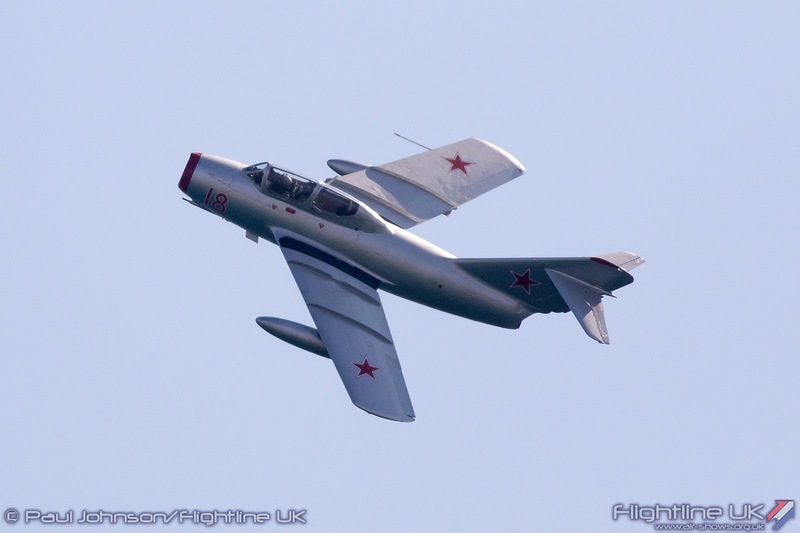 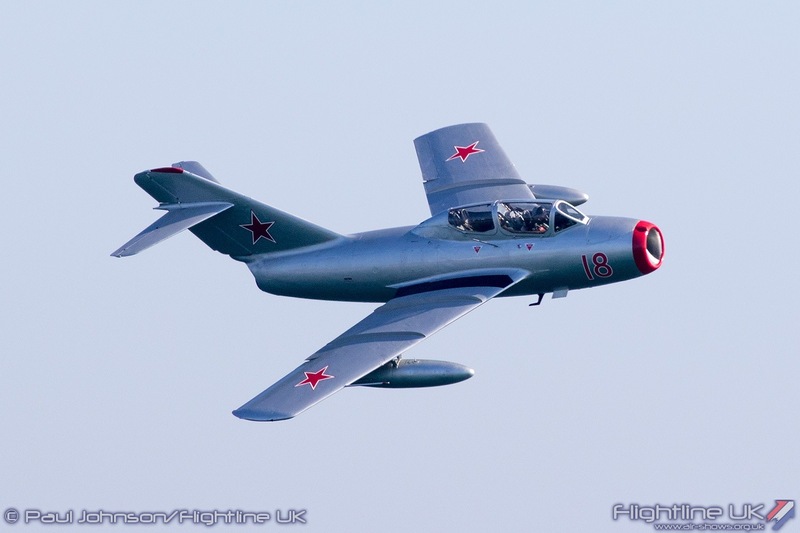 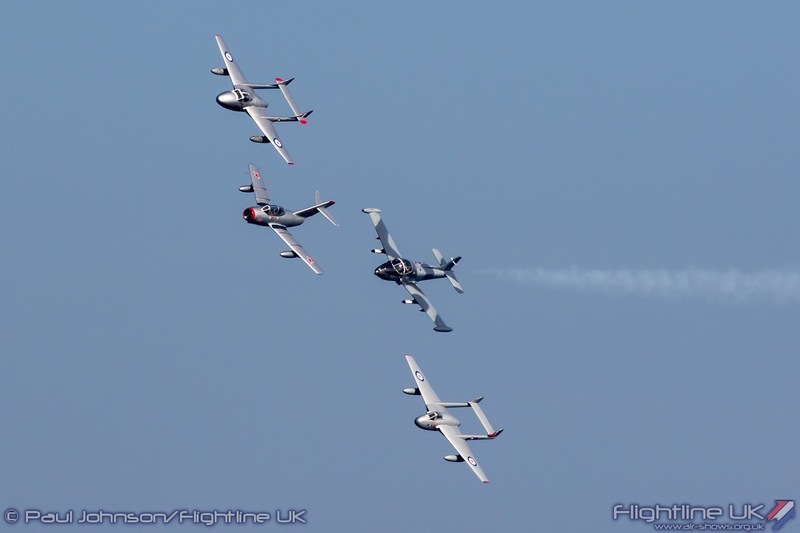 The Jet age was certainly celebrated in style with five classic jets in the displays. 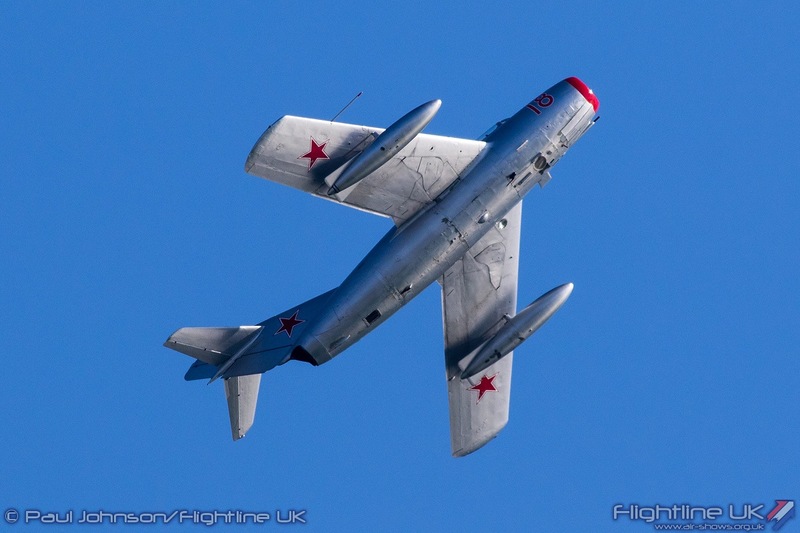 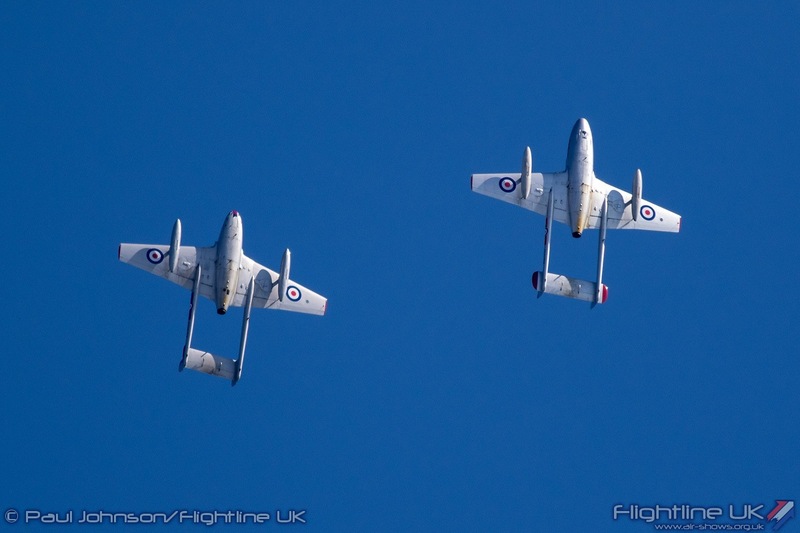 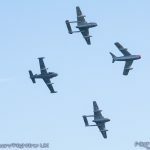 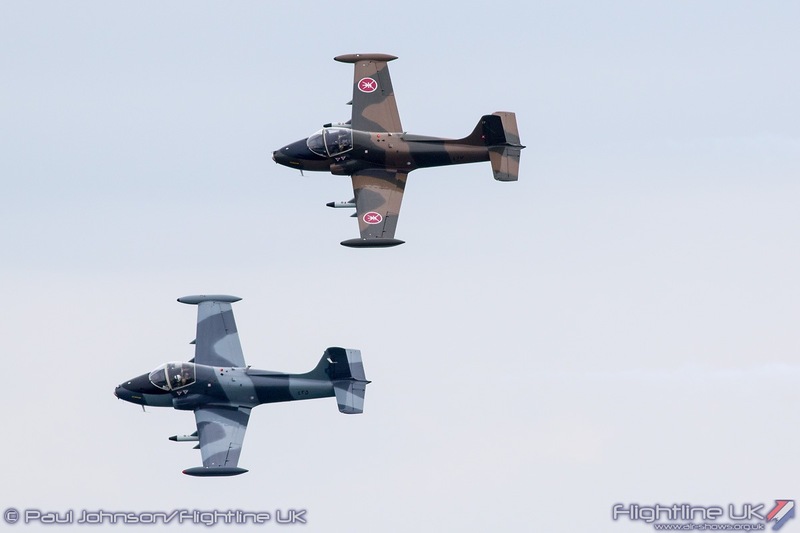 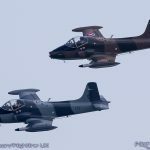 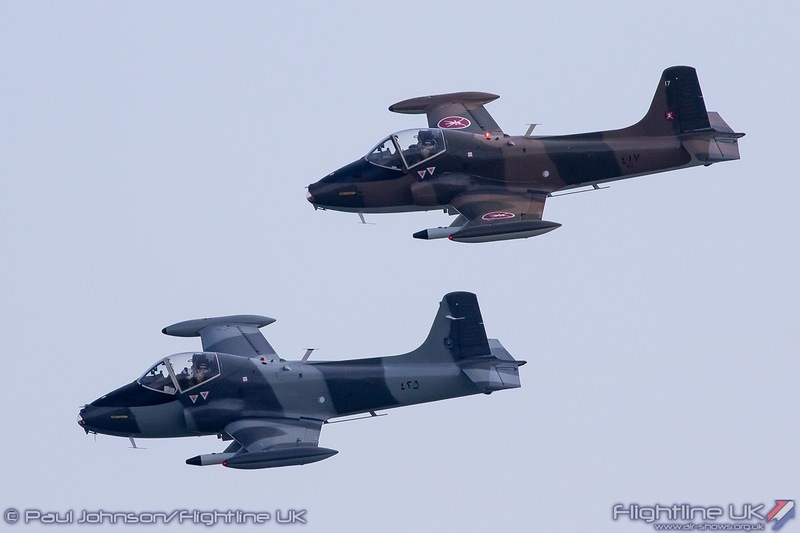 Bournemouth was one of the first public outings for the Strikemaster Pair from North Wales Military Aviation Services. 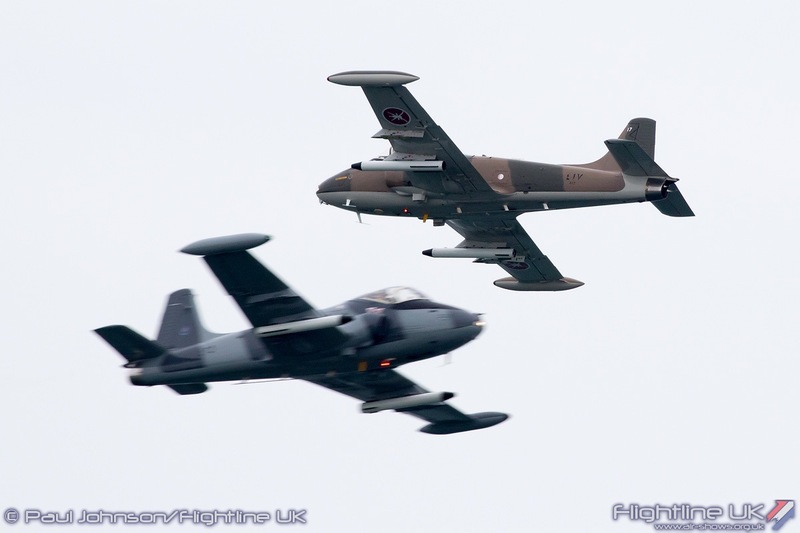 Mark Petrie led the pair in his familiar BAC Strikemaster Mk82a G-SOAF and was joined by NWMAS’s latest fleet member Strikemaster Mk80 G-RSAF flown by Ollie Suckling. 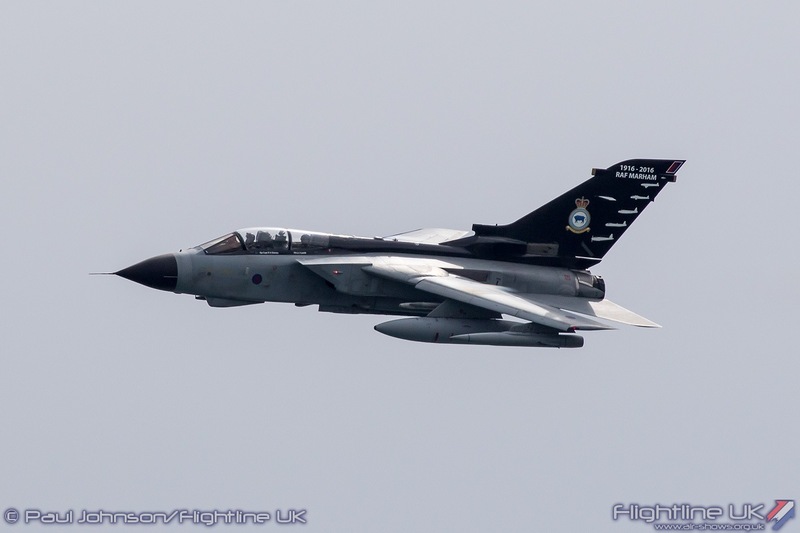 G-RSAF as the registration suggests is a former Royal Saudi Air Force aircraft but was also flown by the Sultan of Oman’s Air Force whose colours it now wears. 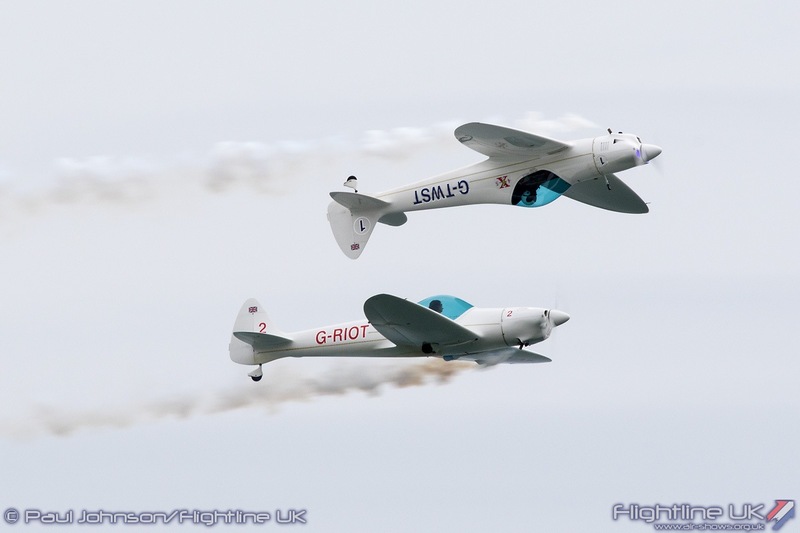 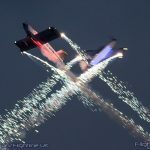 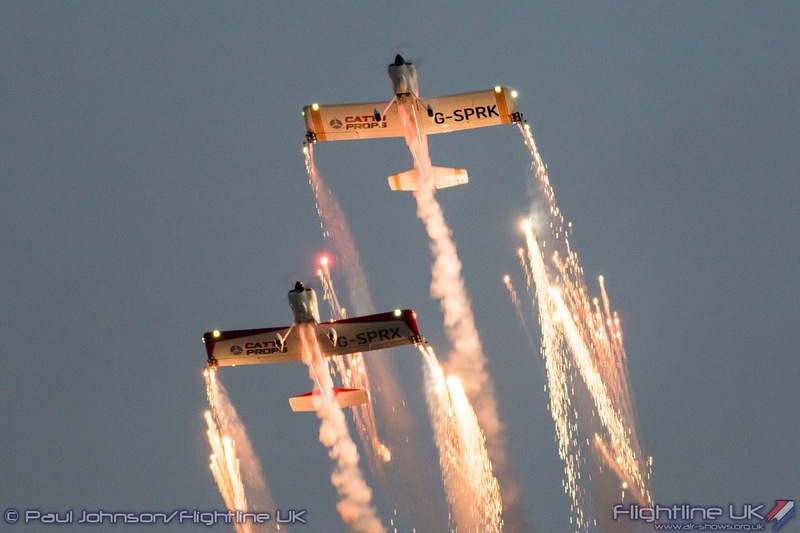 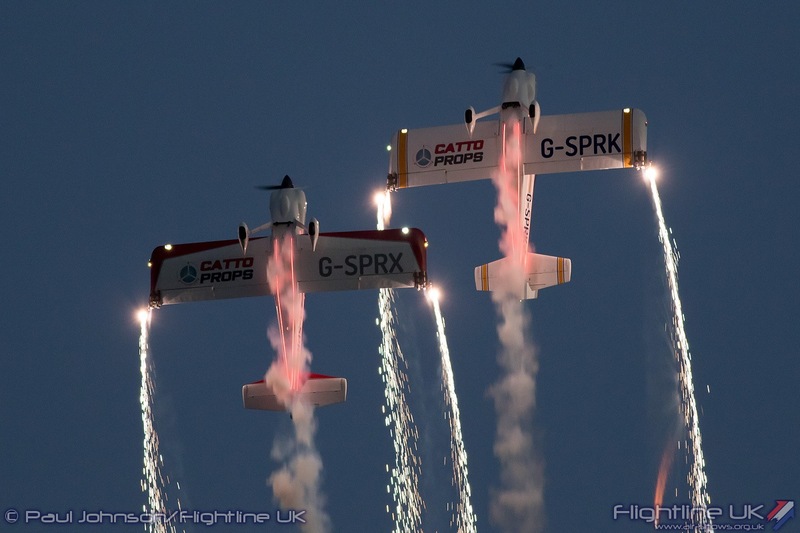 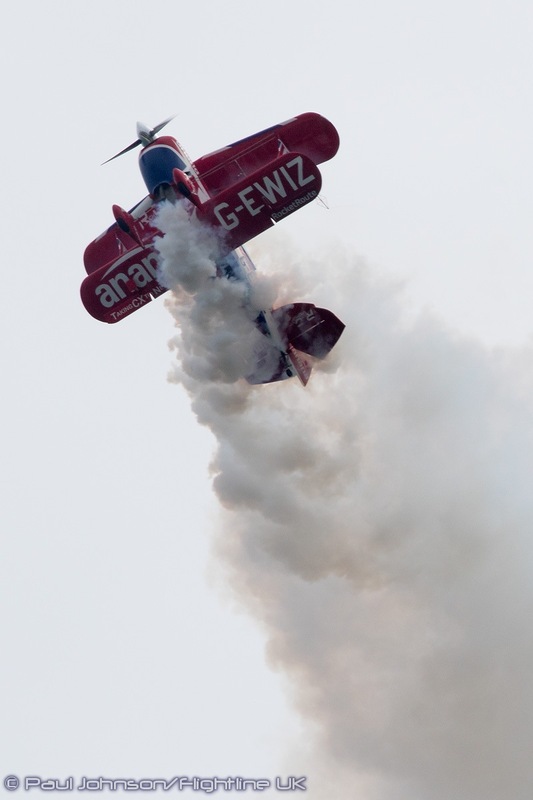 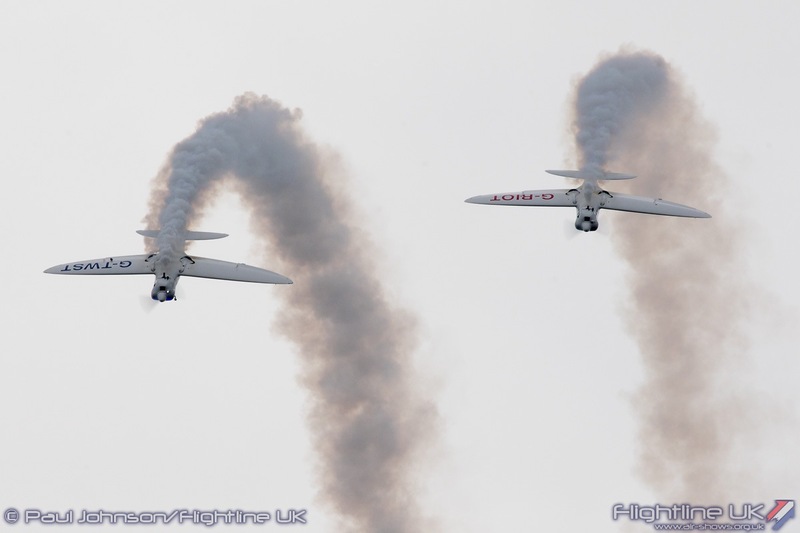 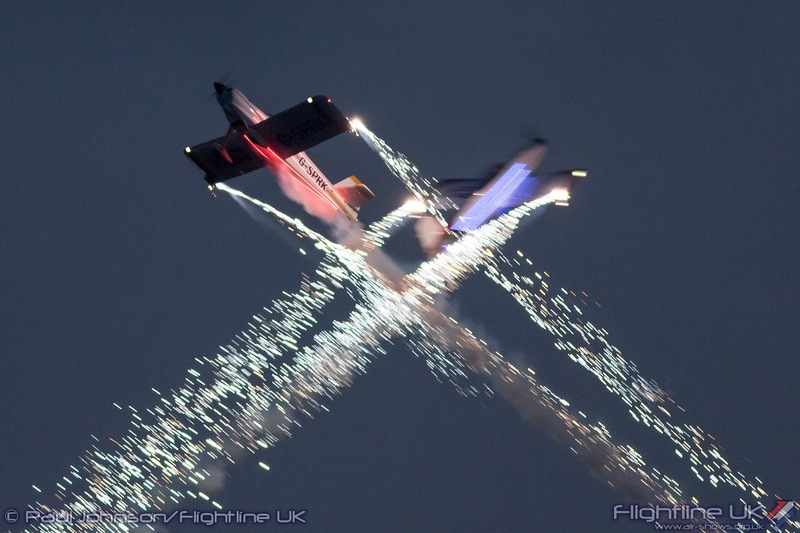 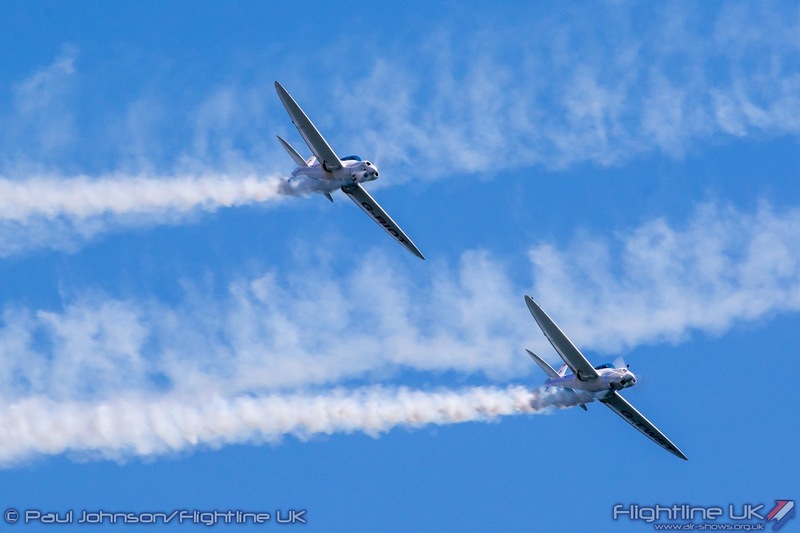 Mark and Ollie’s routine combined close formation flying and some very graceful tail-chase aerobatics. 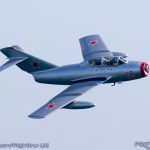 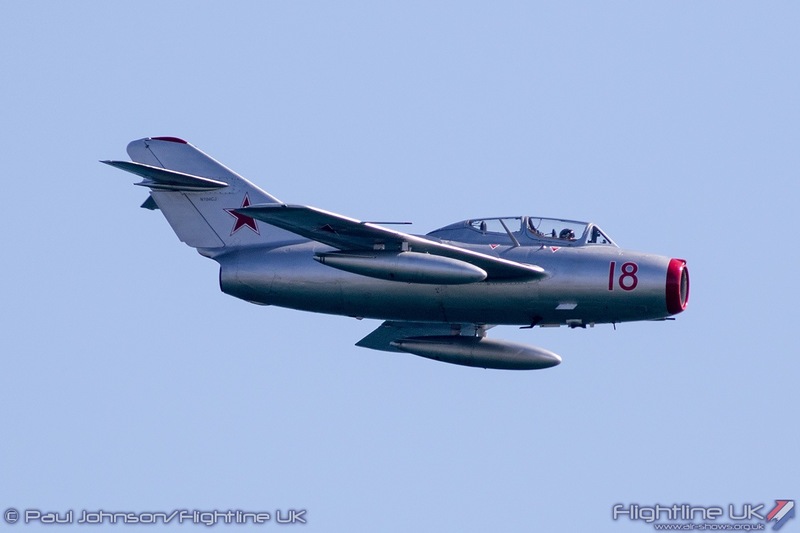 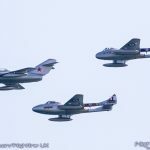 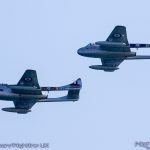 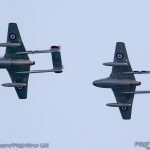 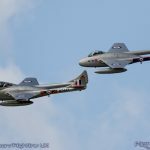 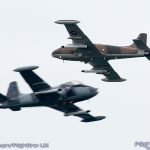 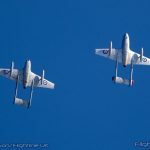 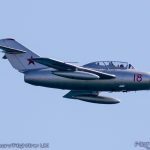 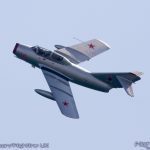 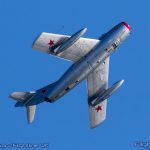 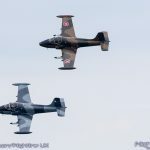 The Norwegian Air Force Historical Squadron were back at Bournemouth with their full fleet of de Havilland Vampire FB52 and T55 plus the Mikoyan-Gurevich MiG-15UTi. 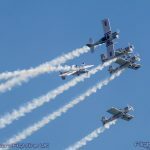 On Saturday they performed a combined routine with all three aircraft starting with a solo by Kenneth Aarkvisla in the MiG. 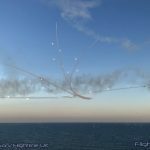 He was then joined by the Vampires for a short tail-chasing dogfight before a formation pass and a final pairs routine from the Vampires. 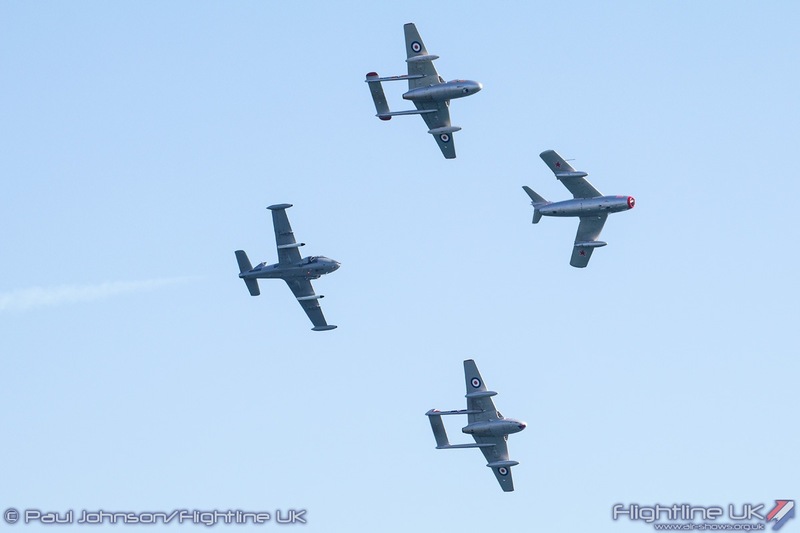 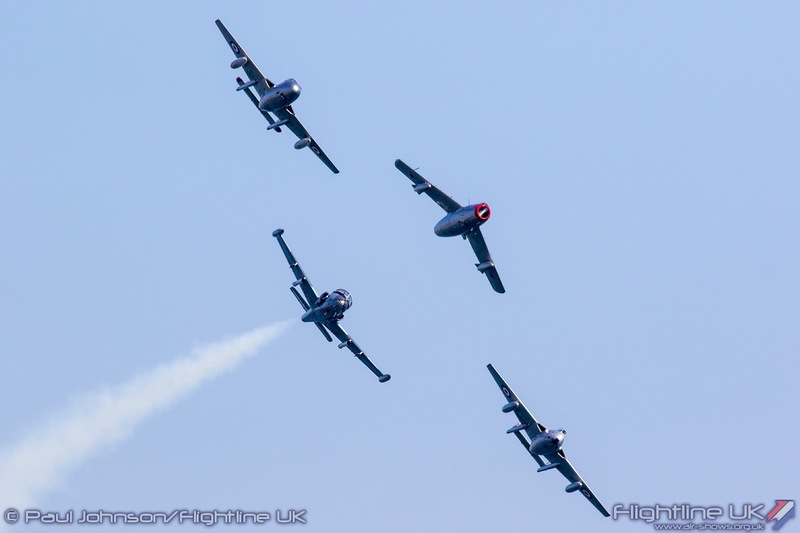 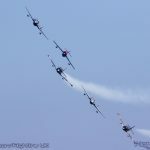 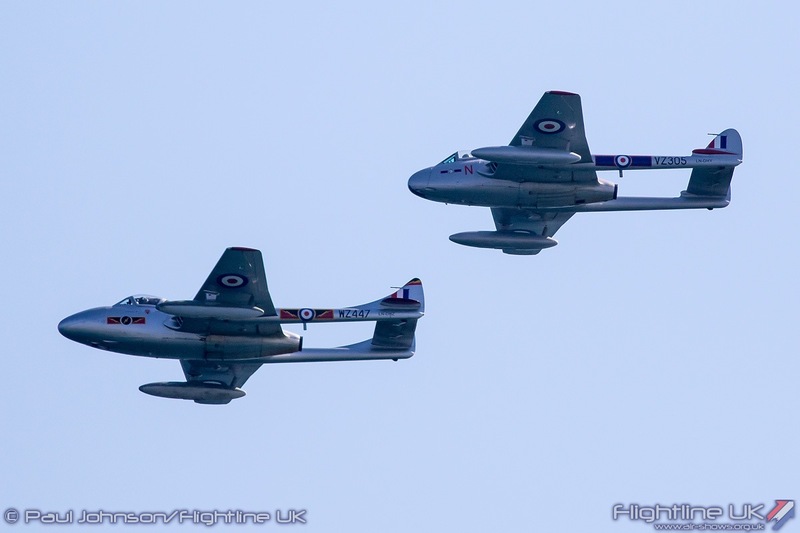 On Sunday however, the classic jets closed the Air Festival and ahead of the show closing Vampires pairs routine the Strikemasters joined the Historical Squadron for a very rare mixed formation of heritage jets. 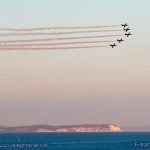 Bournemouth has been hoping to present such a formation for a number of years only to be beaten by serviceability and weather. 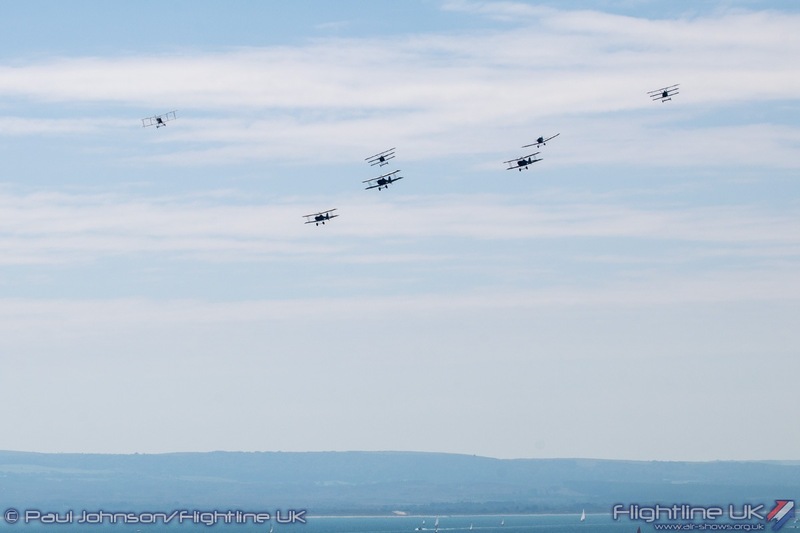 However, this year all the stars aligned and Bournemouth’s crowd were treated to a very unique series of flypasts which was a superb way to bring the flying action to a close. 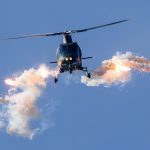 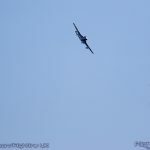 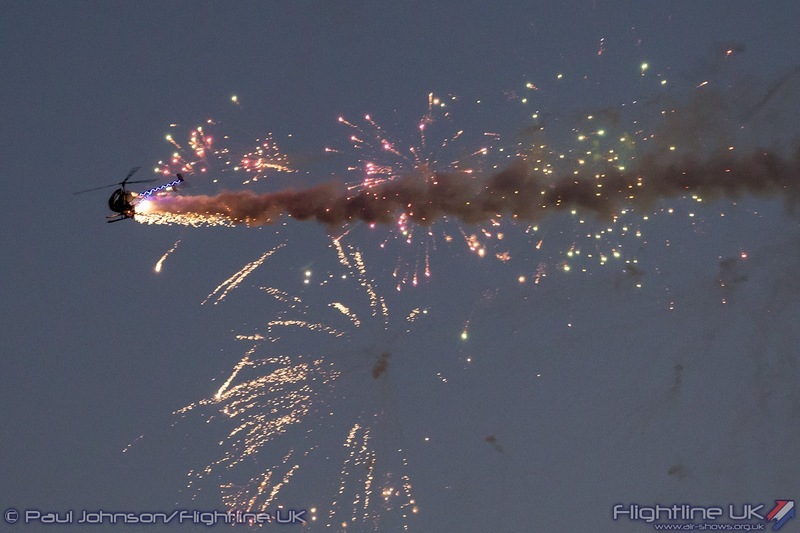 The show was not just about the military with some of the best civilian displays. 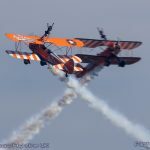 The Aerosuperbatics Wingwalkers made a welcome return to the Air Festival flying on all four days with their formation pairs display. 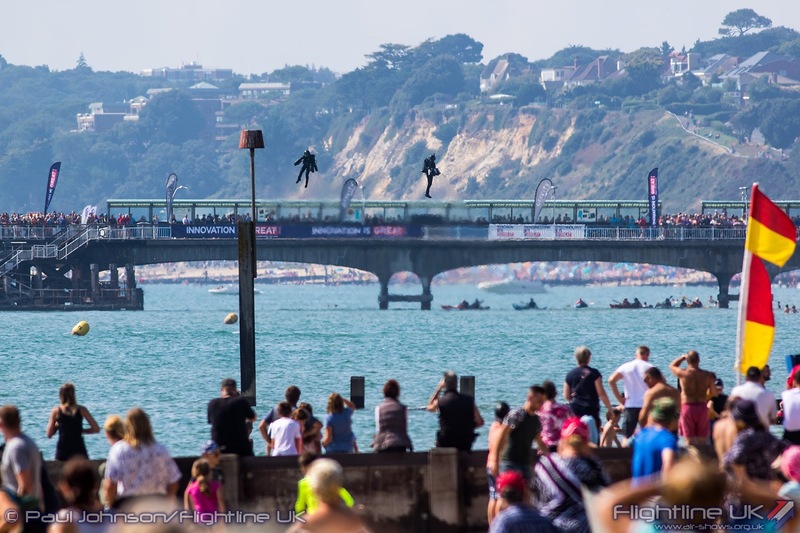 Bournemouth is great venue for the team who display at eye-level with those watching from the cliff top promenade giving a unique view on their display. 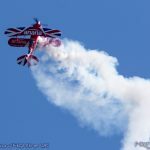 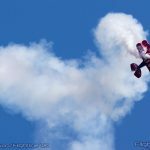 Rich Goodwin certainly made an impression on the Bournemouth crowds with his incredible aerobatic antics in his Pitts S-2S Special. 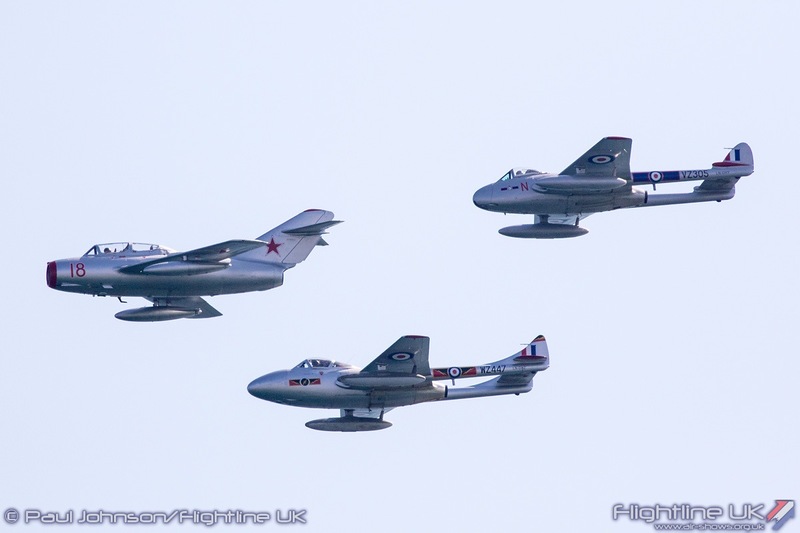 He was joined by two really great formation teams. 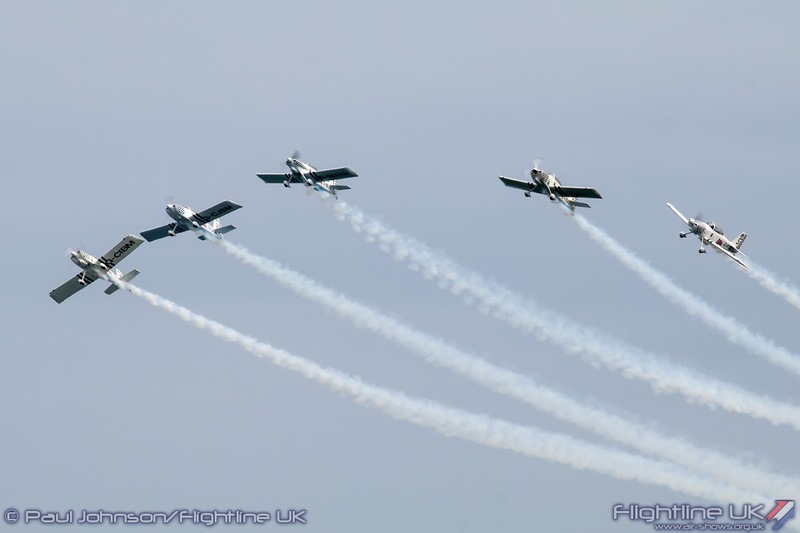 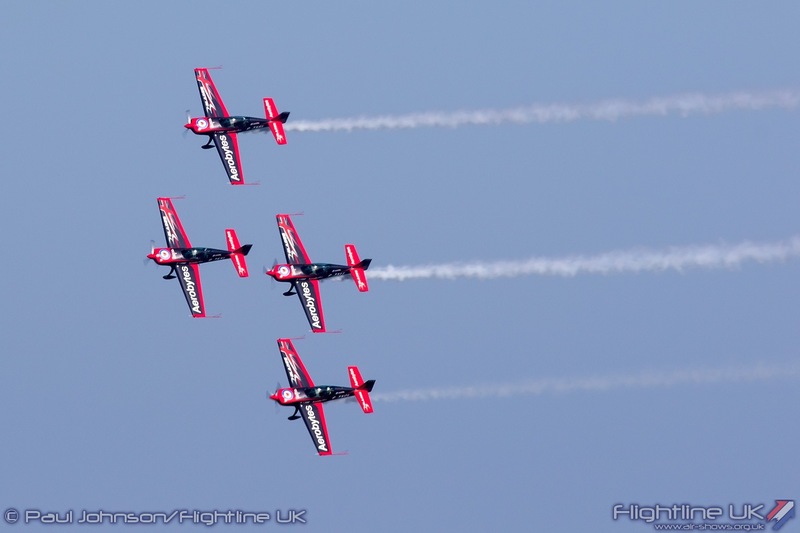 Team Raven really impressed at Bournemouth with their five-ship of Vans RV4 and four RV8s. 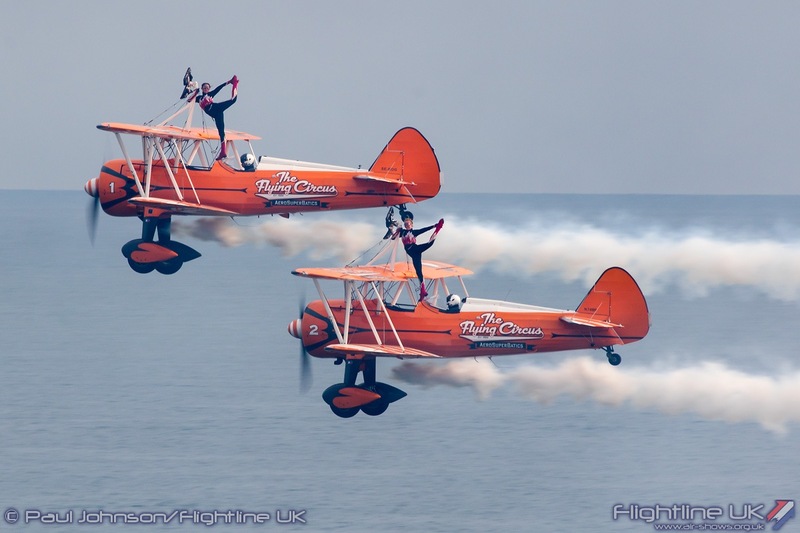 Their routine is a real crowd pleaser painting graceful shapes in the sky and keeping action in front of the crowd at all times. 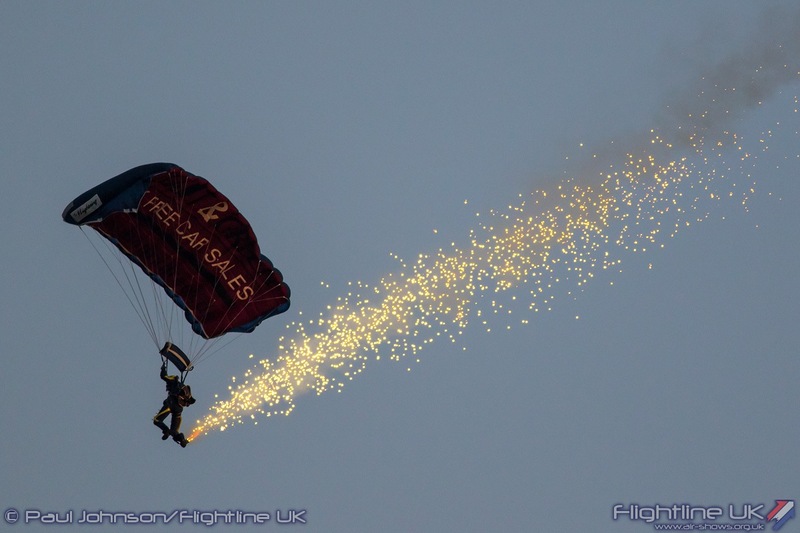 Some of their display figures are really unique such as their trademark twizzle which is very photogenic. 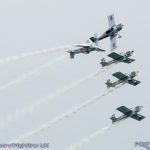 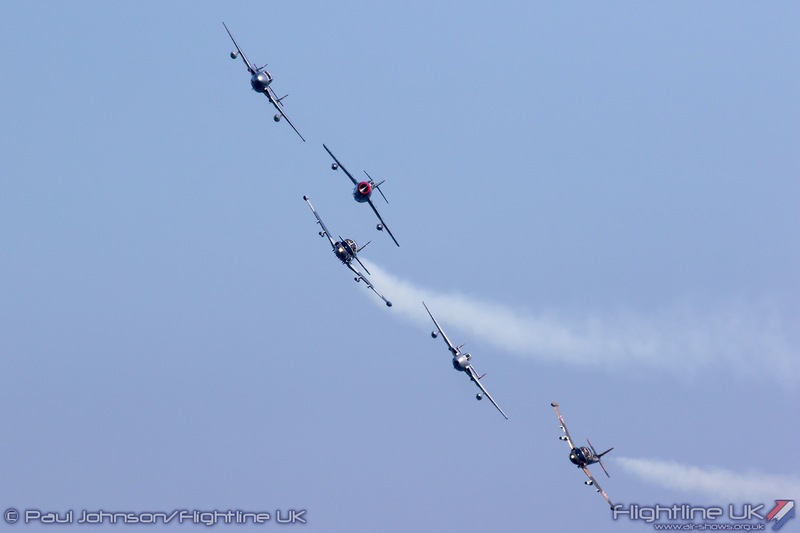 Saturday and Sunday’s displays saw the return of The Blades who are amongst the very few teams to have performed at every Air Festival. 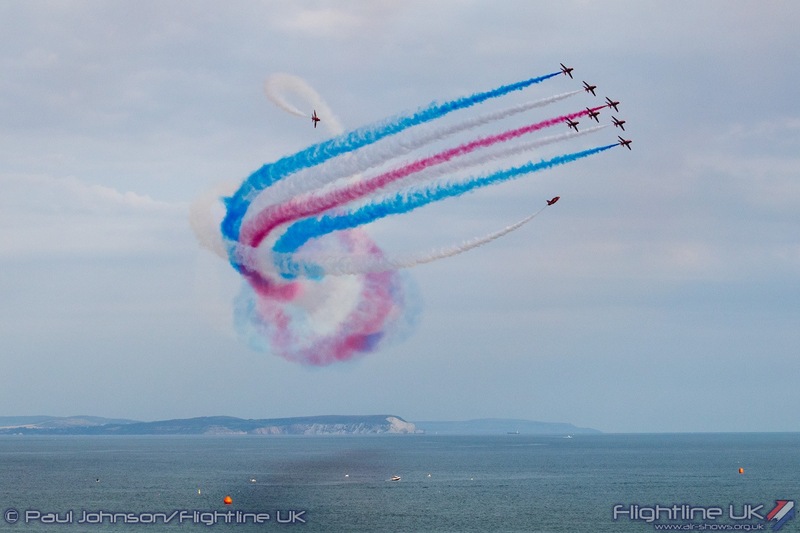 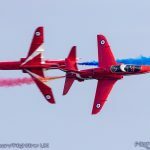 As for many of the display acts, Bournemouth marked the final public display for the team who have changed considerably in 2018 with a new display routine, new patriotic colour schemes on their aircraft and new pilots. 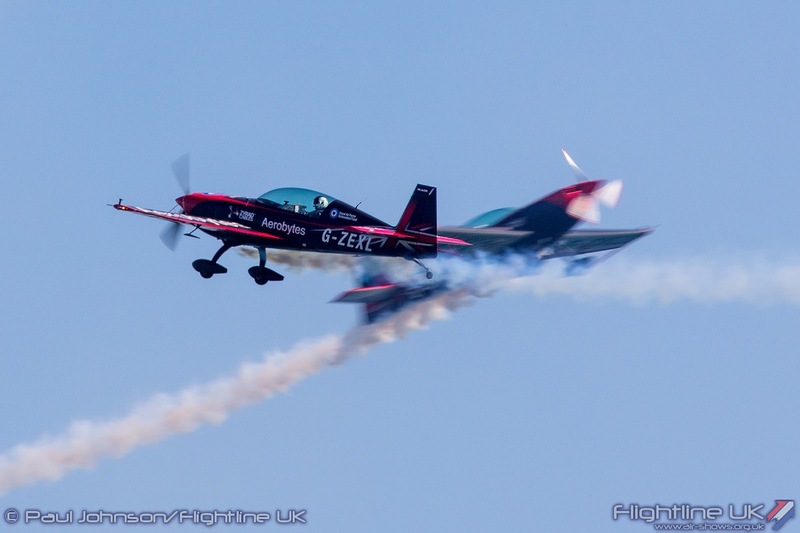 Two of the new pilots were displaying at Bournemouth with James MacMillan flying Blade 2 and UK Unlimited Aerobatic Champion Gerald Cooper flying as Blade 4. 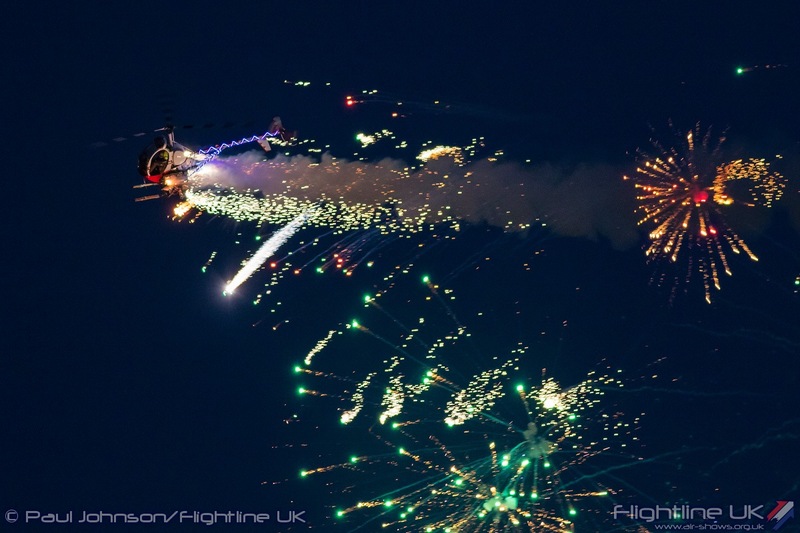 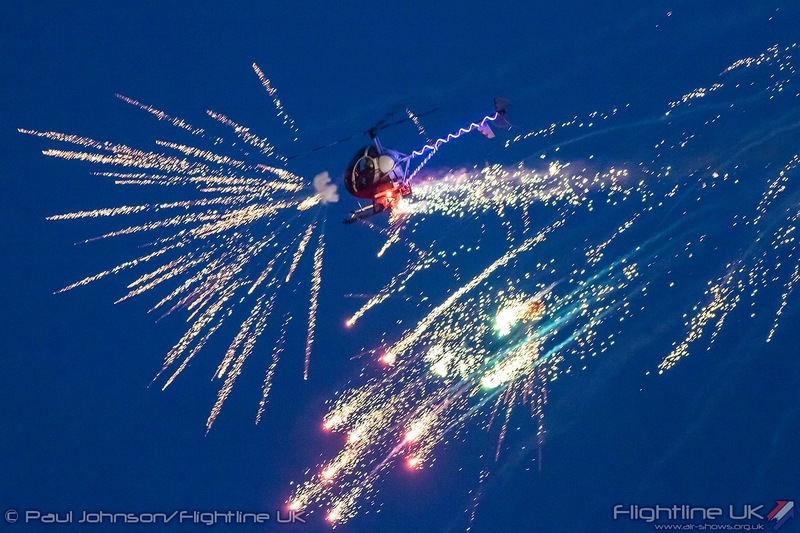 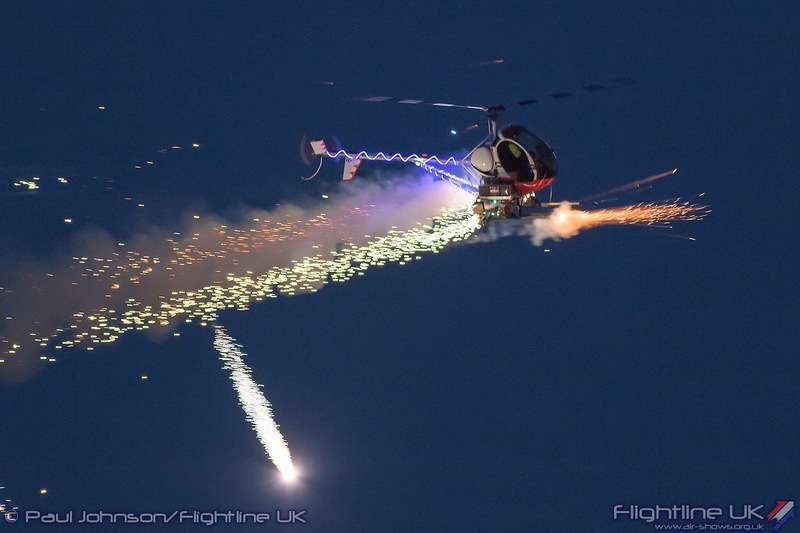 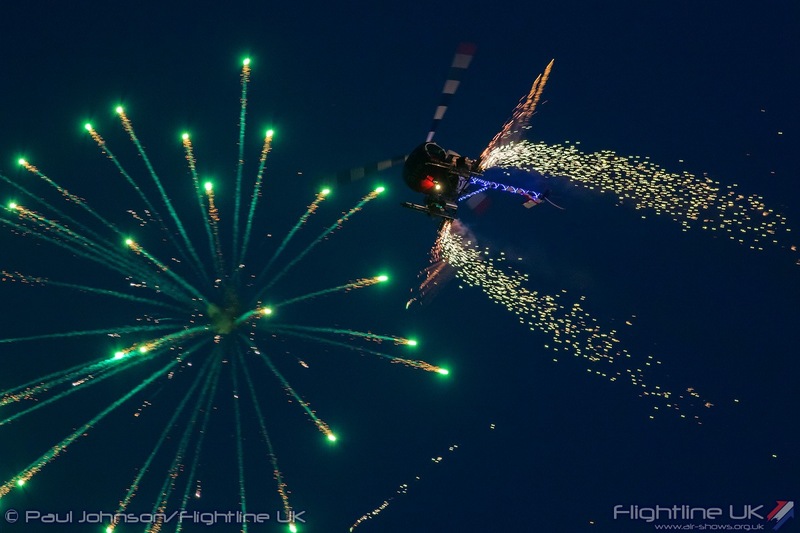 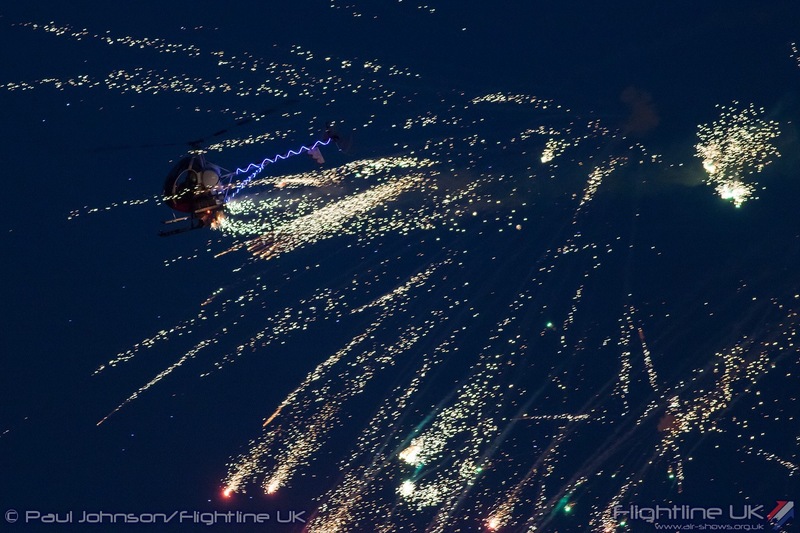 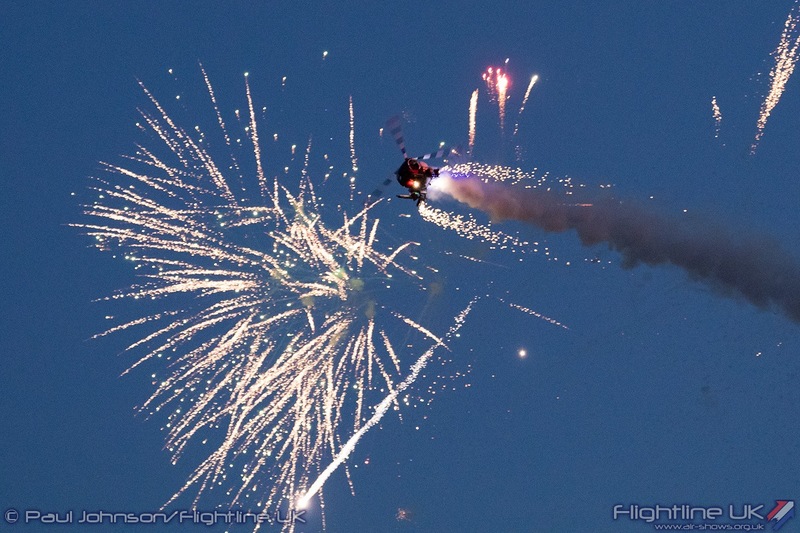 Bournemouth would not be the same without the Night Air flying displays. 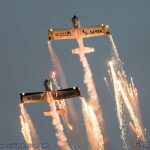 This year, they comprised of the Twister Aerobatics Team, the Fireflies Aerobatic Team and OTTO the Helicopter. 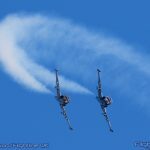 The Twisters also flew daytime shows on the Thursday and Friday. 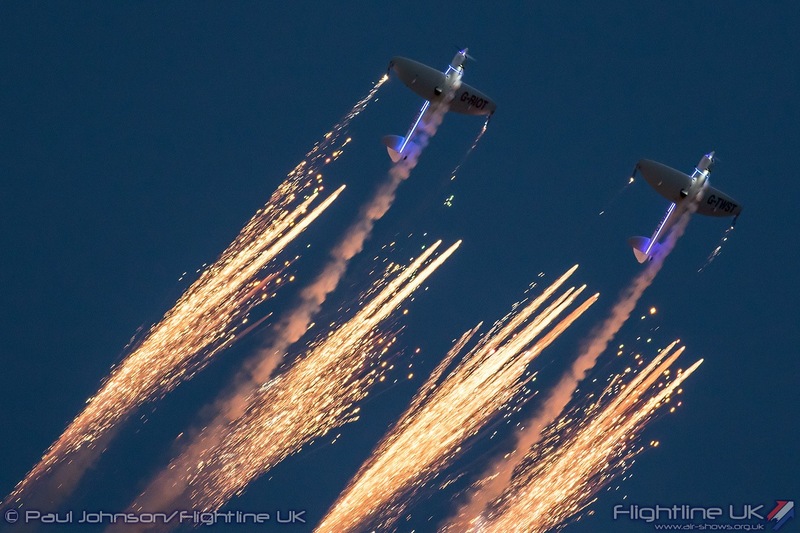 For Night Air however, the Twisters and Fireflies combined to present a unique four-ship pyrotechnic show with the teams arriving as one out of the sunset over the Purbeck coastline. 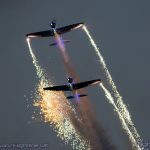 After two big formation passes the two duos split presenting a very sharp combination of both their usual twilight displays with fireworks streaming from their wingtips. 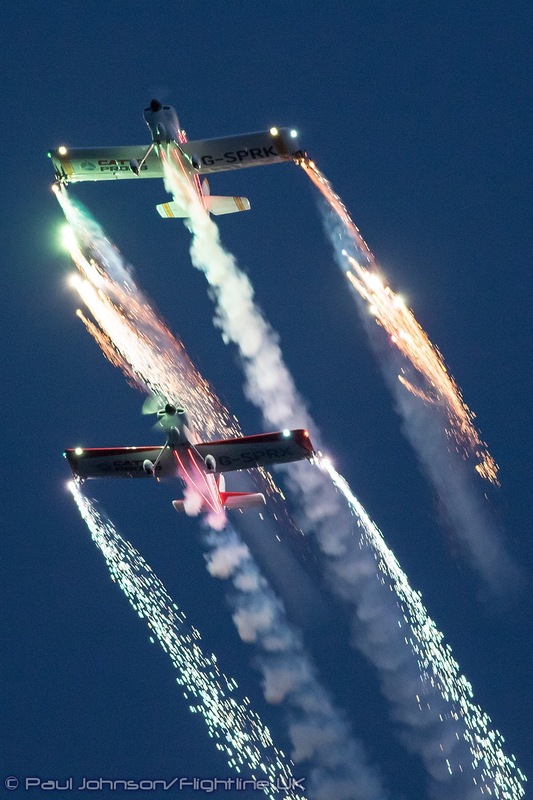 Brendan O’Brien closed each Night Air with OTTO for a colourful and explosive finale. 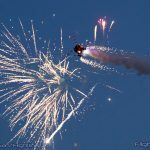 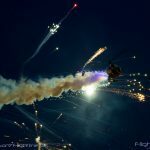 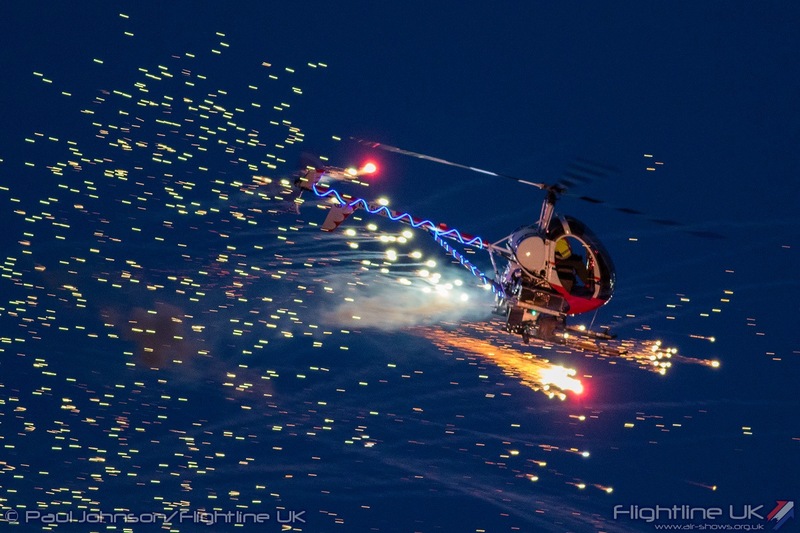 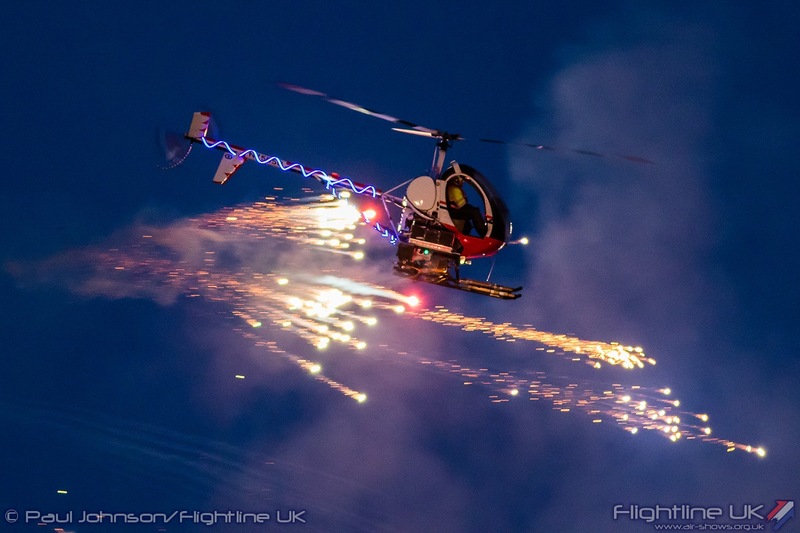 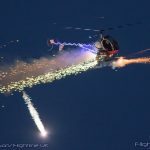 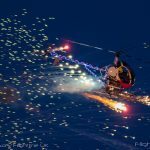 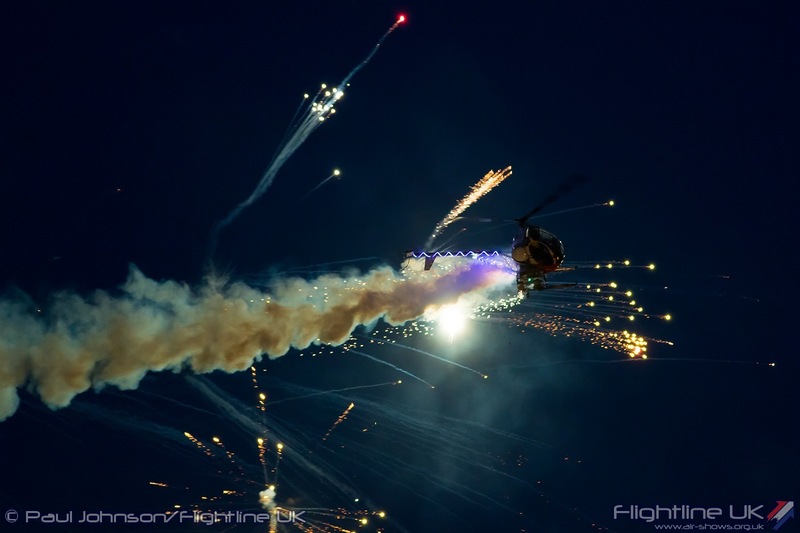 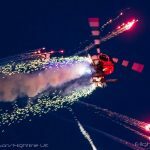 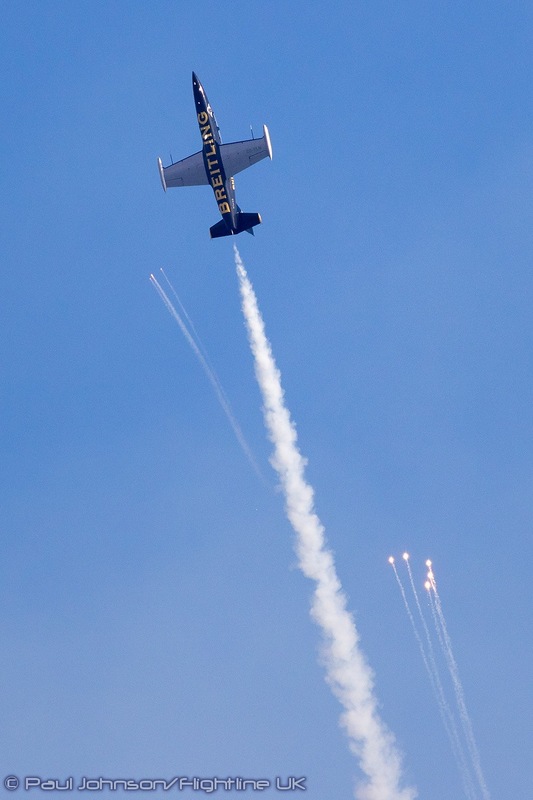 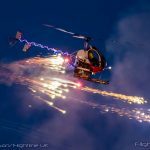 OTTO, a Schweizer 300C, has been modified for display work and can carry a dizzying array of different pyrotechnics which light up the skies for several minutes. 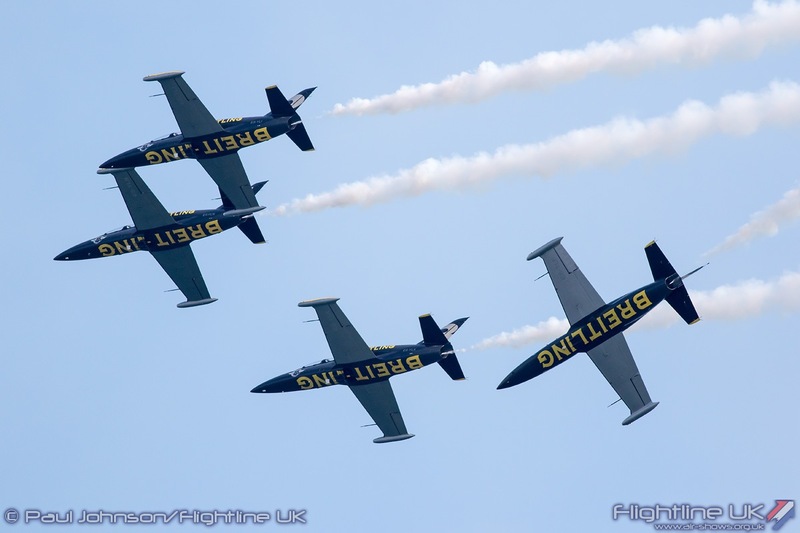 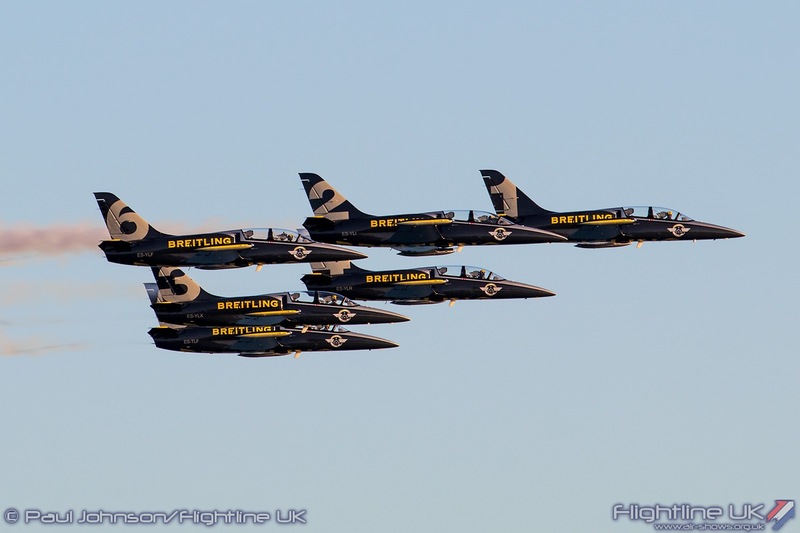 The highlight of the Air Festival line-up was the Breitling Jet Team who appeared from Friday through to Sunday. 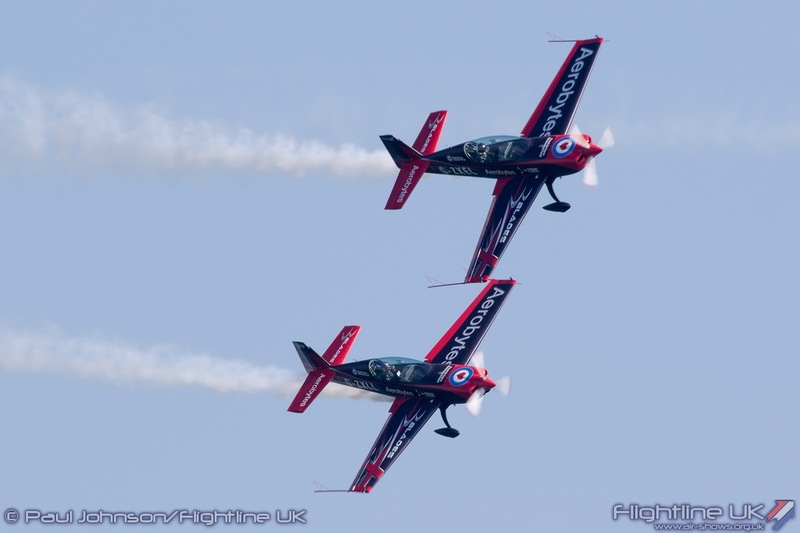 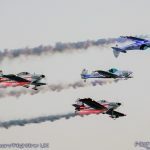 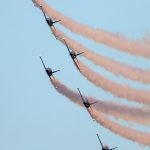 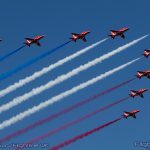 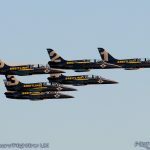 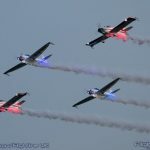 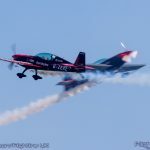 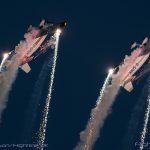 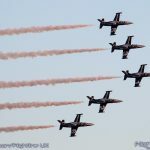 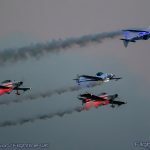 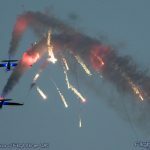 The French team led by Jacques Bothelin have been absent from the UK for over four years after last appearing at the 2014 Royal International Air Tattoo. 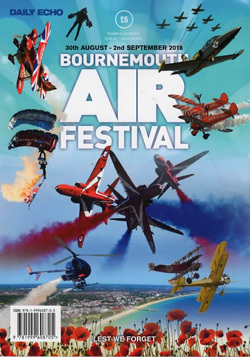 Bournemouth has long held ambitions to host the team at the Air Festival and this year thanks to the sponsorship of Morgan Sindall finally was able to bring them over. 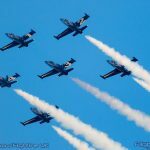 The team fly the Aero Vodochody L-39C Albatross jet trainer and with the exception of Jacques are all ex-French Air Force fast jet pilots. 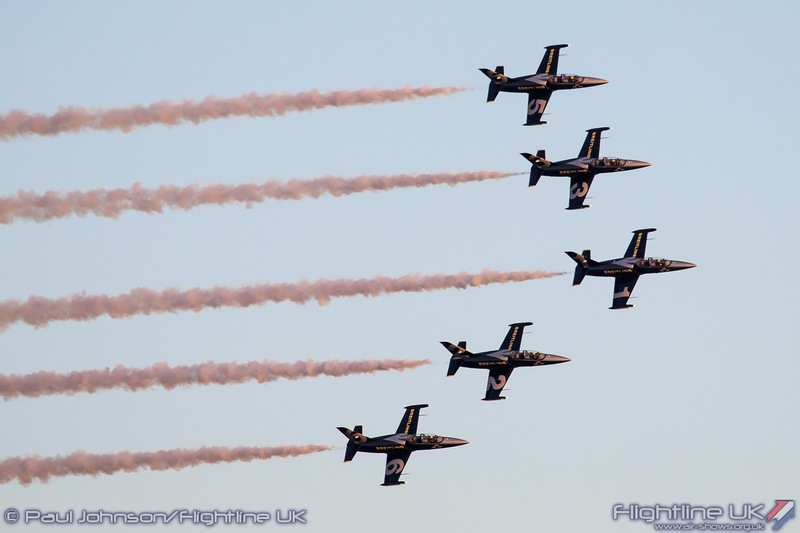 Many of them have previous display experience either on fast jet solo displays or with the Patrouille de France. 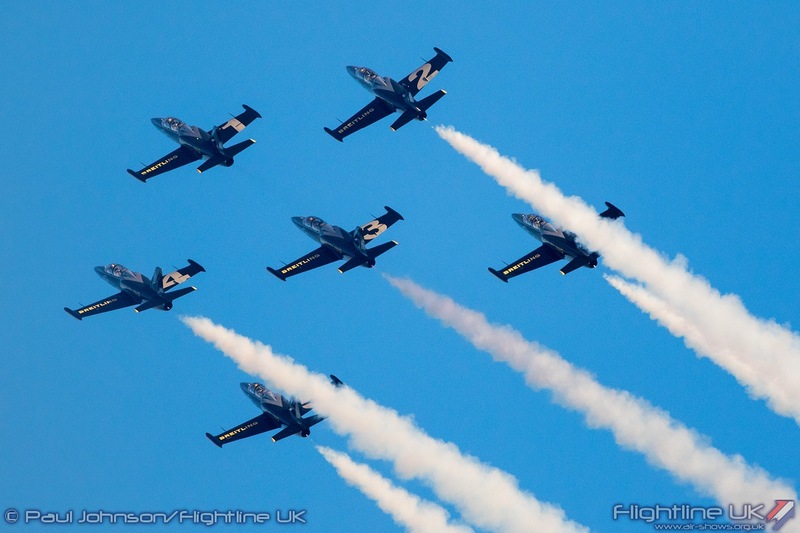 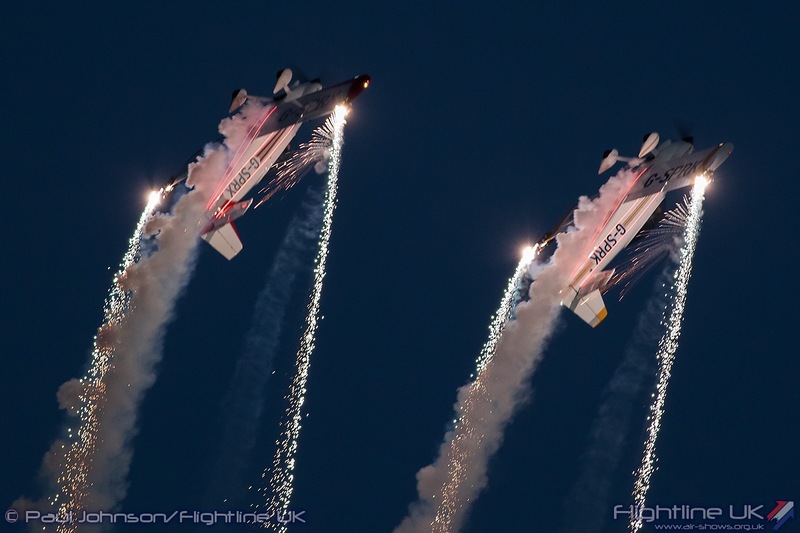 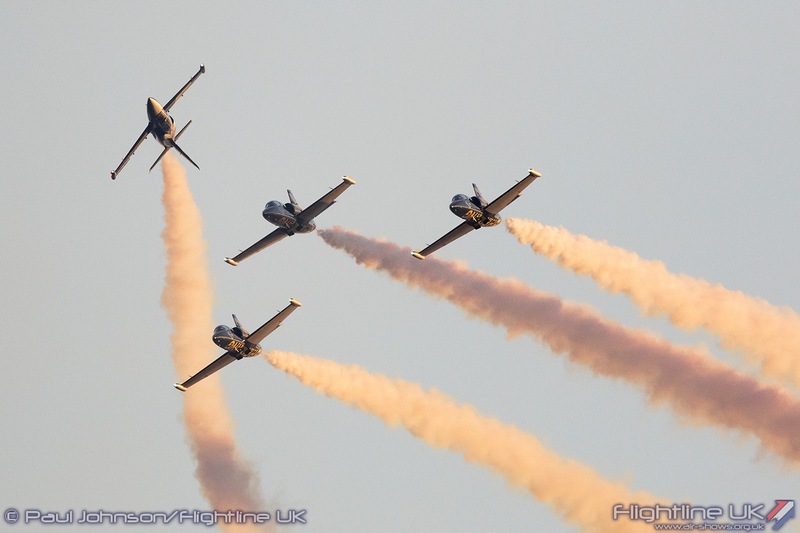 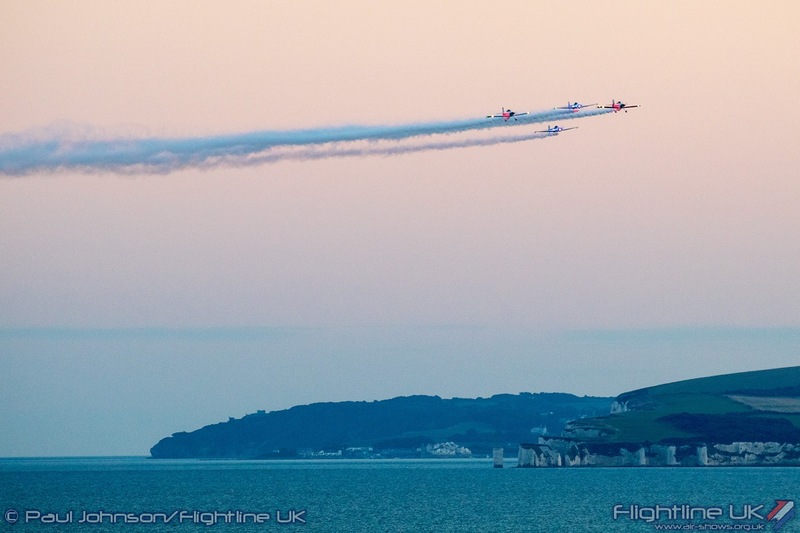 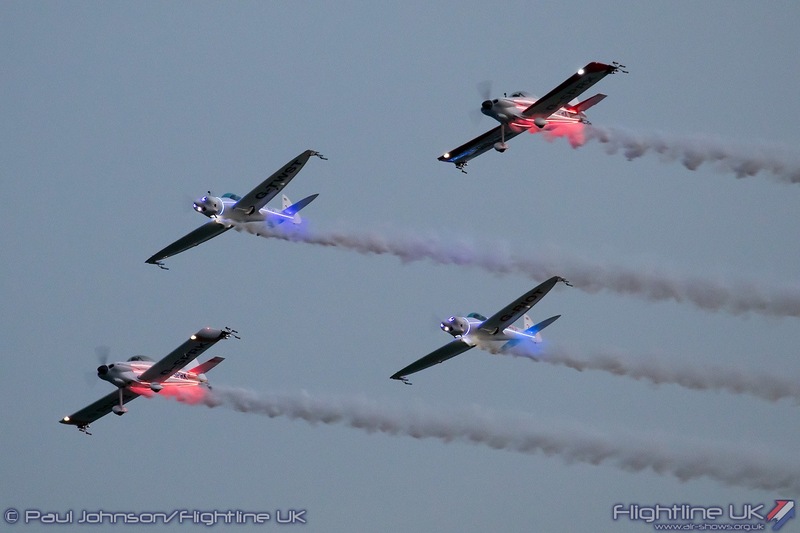 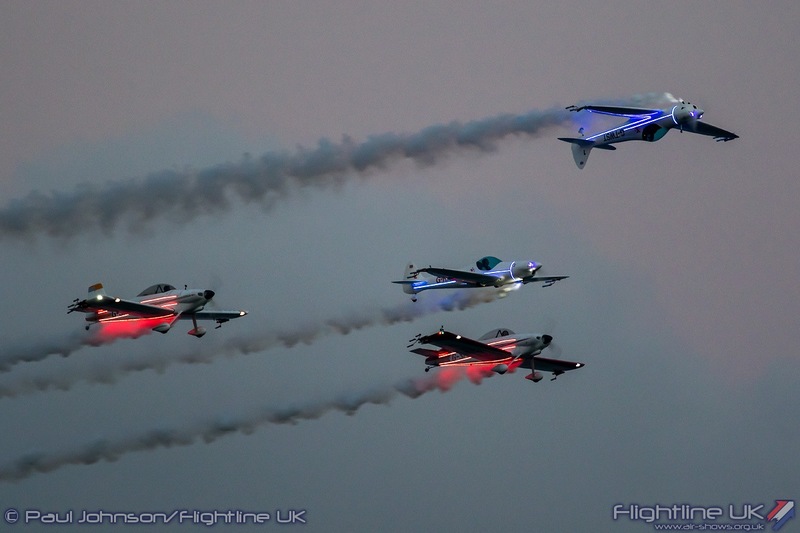 The Jet Team flew four times over the their three day stay in Bournemouth with the highlight being their sole Night Air performance on Saturday which saw them perform in gin clear blue skies with the perfect sunset highlighting their smoke trails and beautifully illuminating their grey, silver and yellow painted jets. 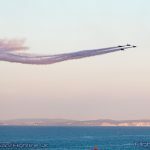 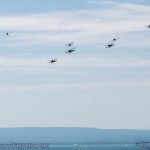 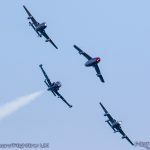 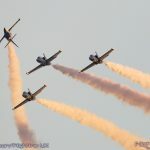 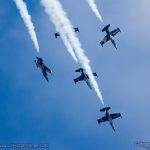 Bournemouth Air Festival 2018 was certainly the most memorable of recent years with that lovely heritage jet formation that closed the show and the Breitling Jet Team’s first appearance at the event. 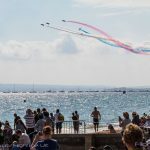 Add in some of the regular items such as Night Air, the music and simply the Dorset coastline, the Air Festival makes for a very full but relaxing, fun short break.